It’s just three days to go before we complete our entire coastal road trip! 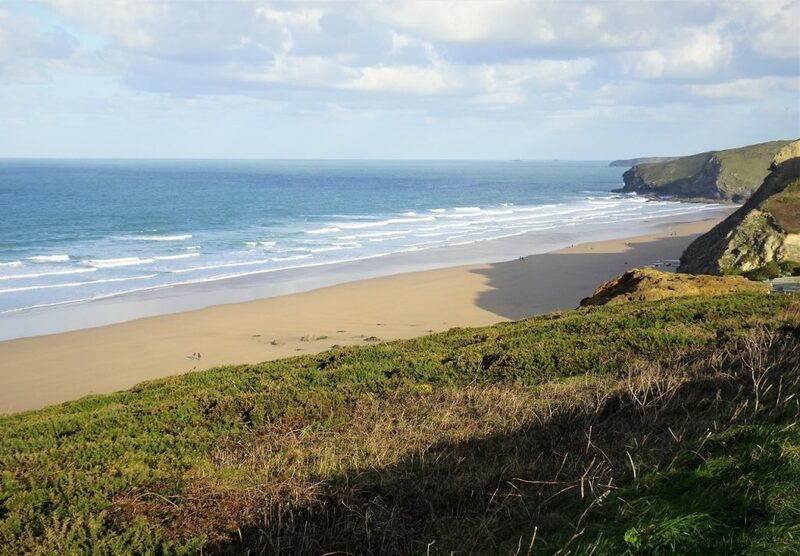 Today we are finishing off north Cornwall, driving alongside its famous golden sandy beaches, before we re-enter Devon as we drive towards Bideford. The sun setting as we headed down to Hartland Quay. Long shadows in the early morning sun. 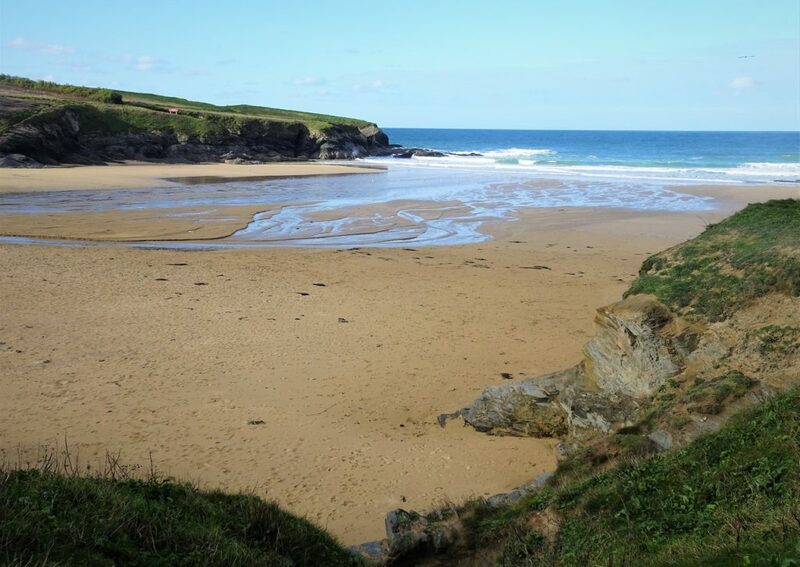 We made our first stop of the day looping back from Newquay to the National Trust’s Holywell Beach. Walking past the sand dunes towards Carter’s Rocks (AKA Gull Rocks) off Penhale Point. 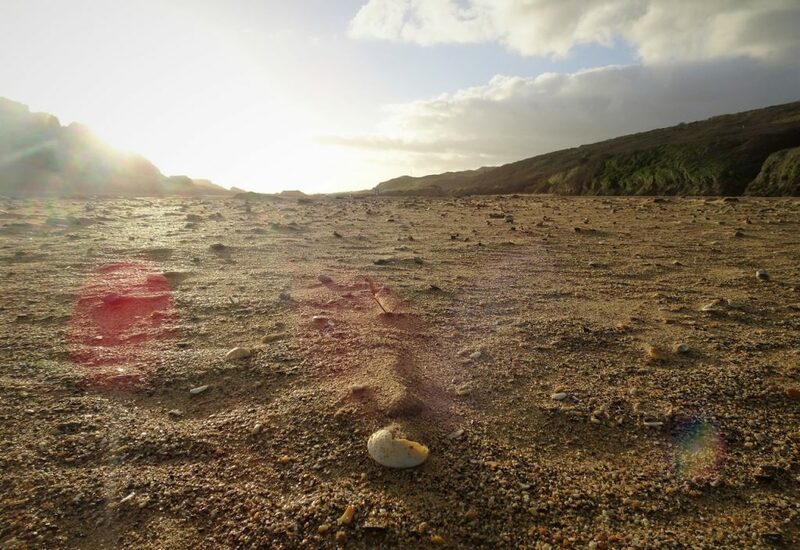 Shells and their shadows scattered across Holywell Beach. 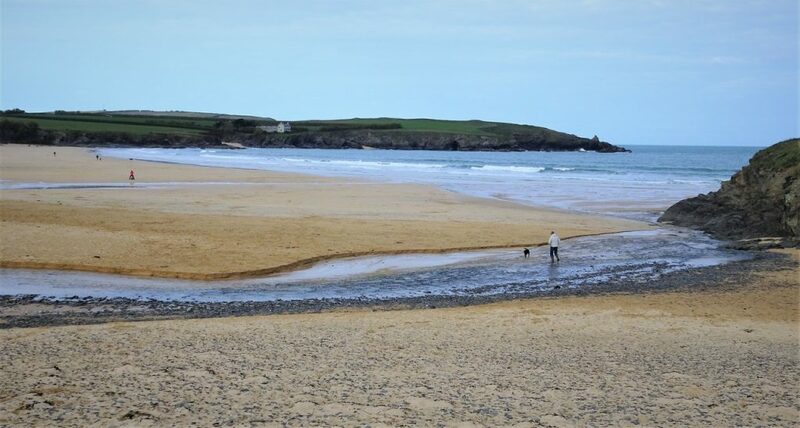 The Gannel Estuary at Crantock Beach, beside Rushy Green. 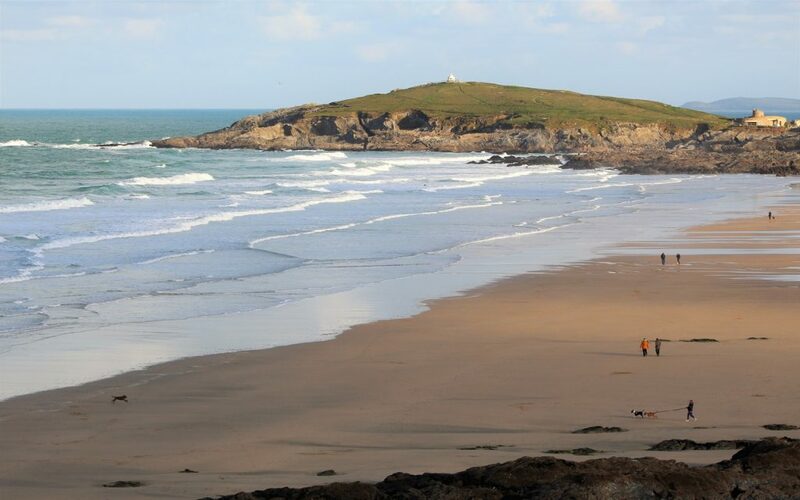 So it was a morning full of beaches… next stop the famous Fistral Beach, a surfers paradise, but none out this morning – yet. 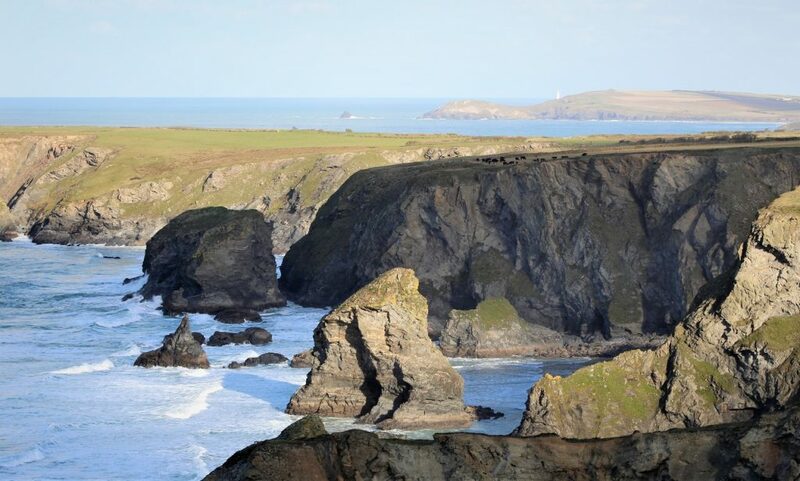 …and the view north towards Bedruthan Steps and beyond to Trevose Head. 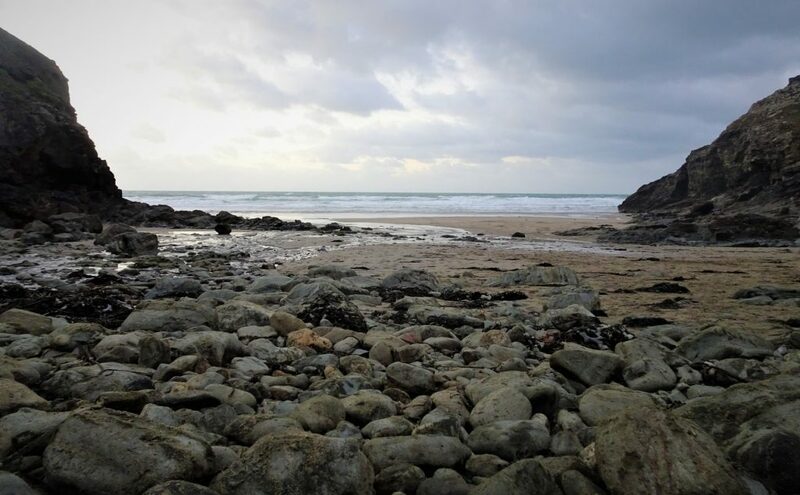 The wide open sands of Watergate Bay, as we headed along the scenic B3276 coastal road. 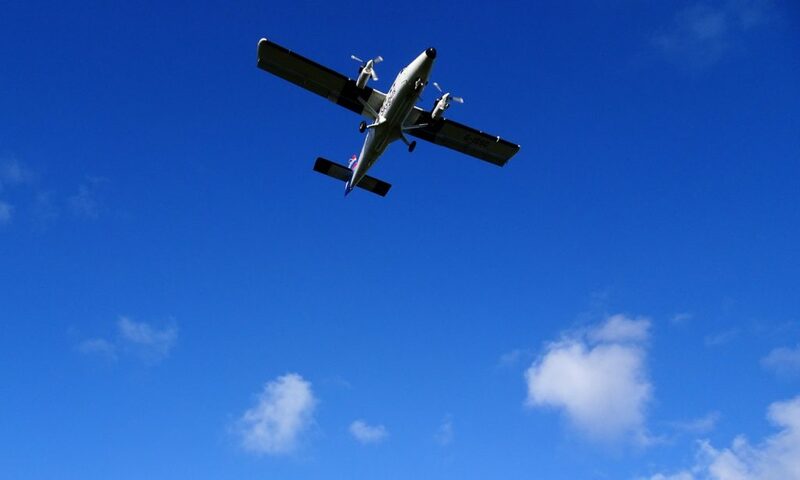 A small plane flying overhead into nearby Newquay Airport. 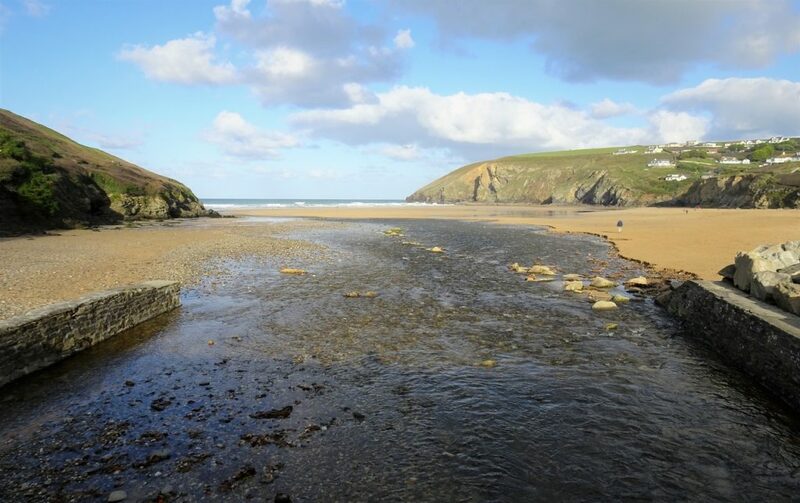 The River Menalhyl streaming down Mawgan Porth Beach. 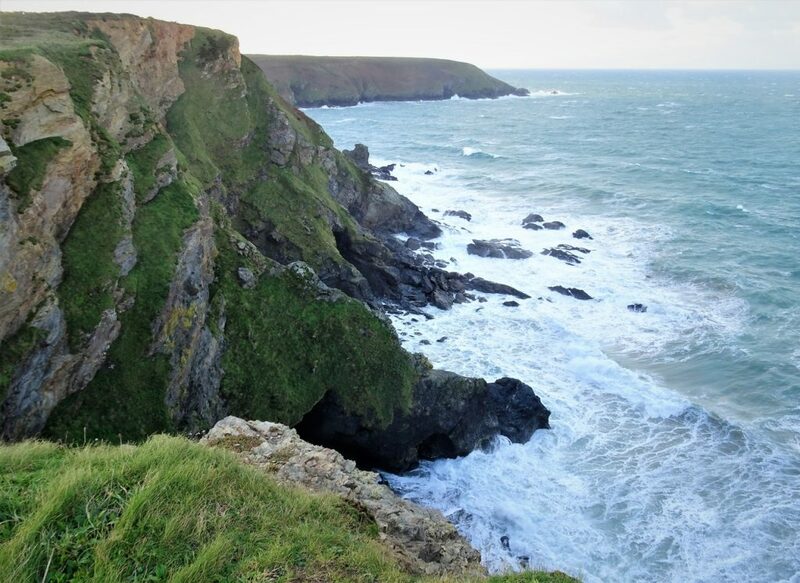 Peering over the Carnewas cliffs at Bedruthan. 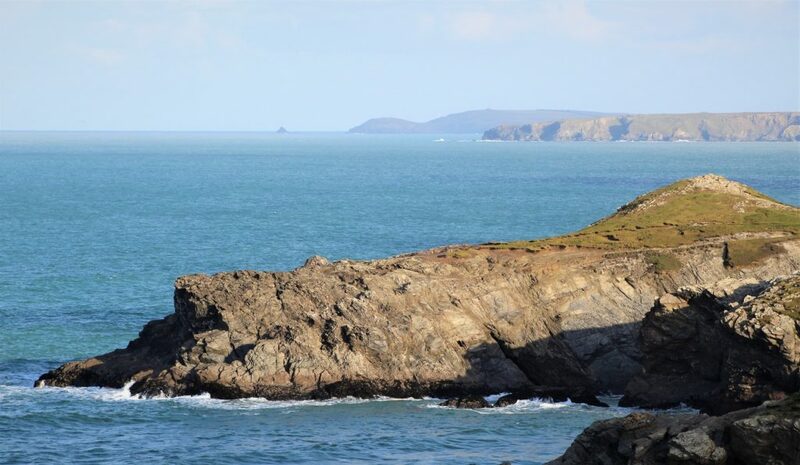 Dramatic views north past Pendarves Island, Queen Bess Rock, Diggory’s Island and Park Head. In the distance you can just about make-out Trevose Head Lighthouse. 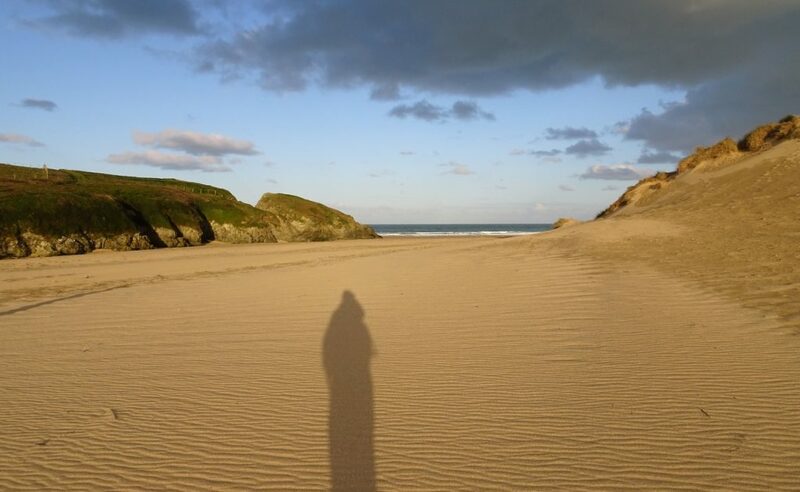 Another beautiful empty beach west of Padstow at Treyarnon Bay. 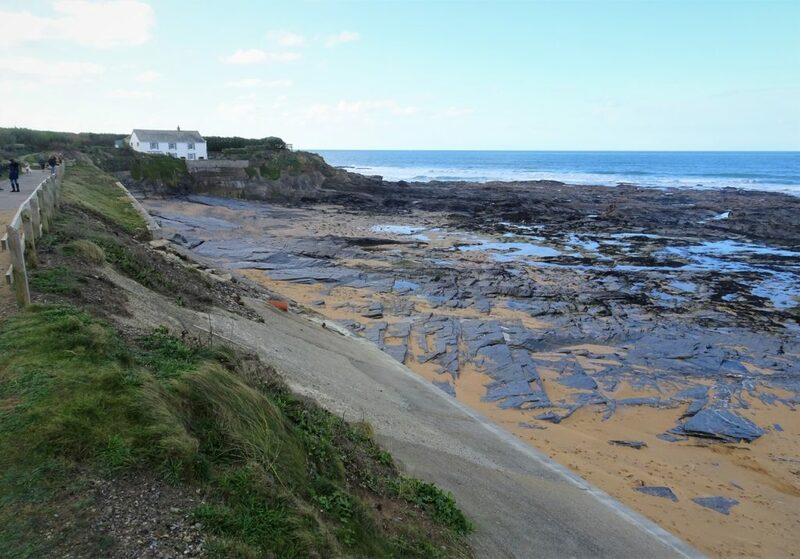 The South West Coastal Path along Chair Cove, behind some rather expensive looking houses at Constantine Bay. Some locals walking a dog stopped to talk to us, and asked if we were bankers! ?… it seemed many locals were! 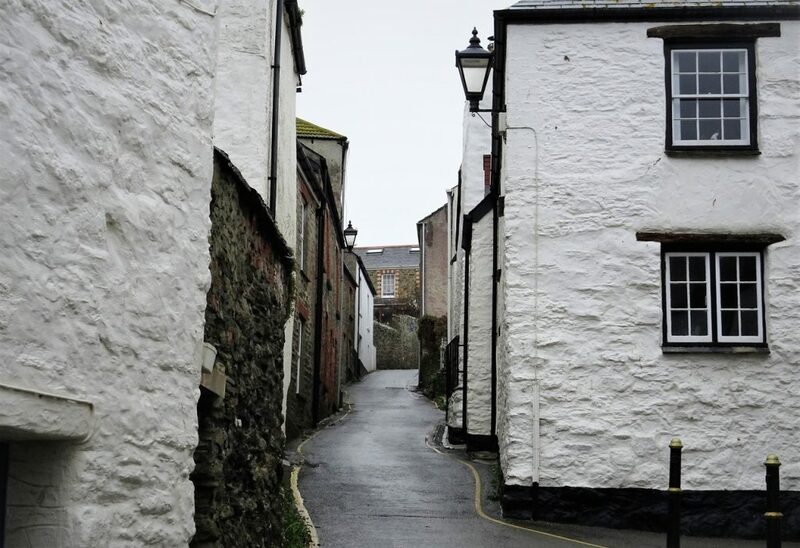 A little alley in Padstow, AKA ‘Padstein’ after its famous local celebrity chef – Rick Stein. 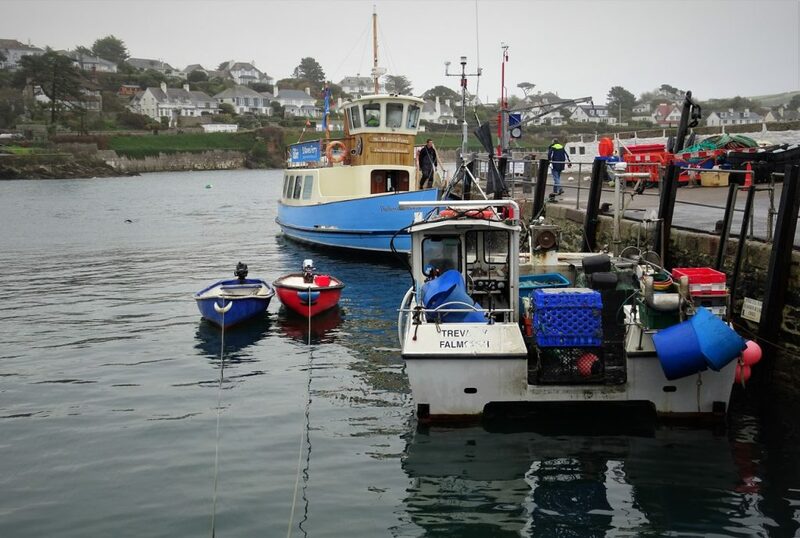 Small fishing boats lining the quay. Quiet at this time of year, but heaving with tourists in the summer. 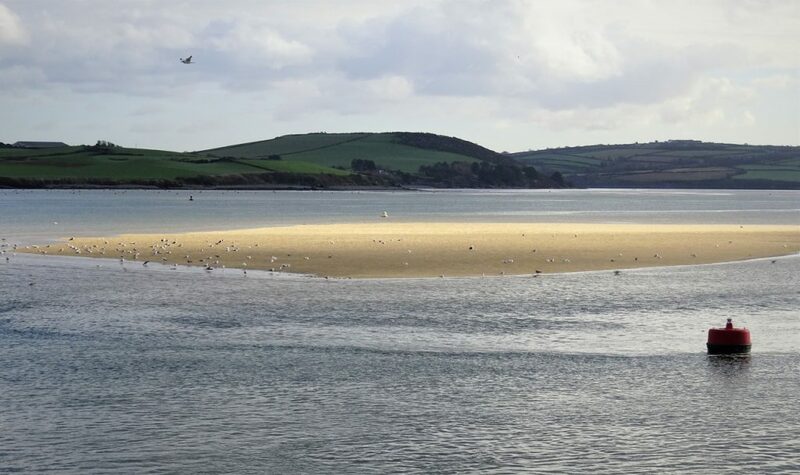 The coastal village of Rock, beyond the sandbank in the River Camel. We will drive past Rock as we continue northeast, but as we had been last year, we won’t stop this time. 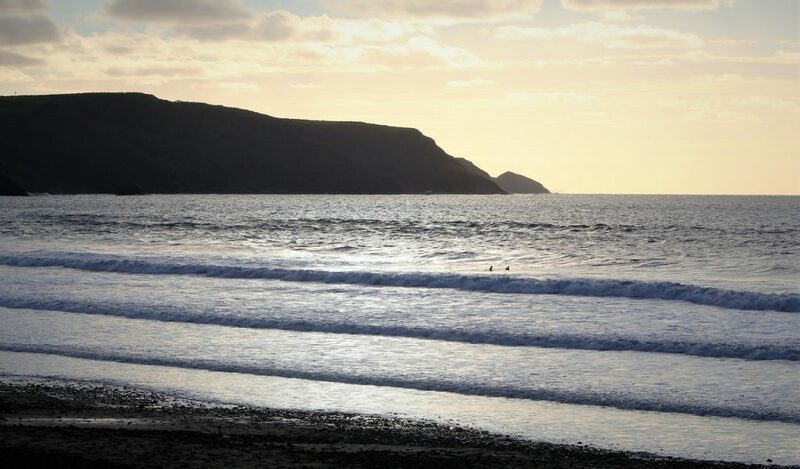 Looping all the way around the River Camel, we made a brief stop to watch the surfers on Polzeath’s Beach. 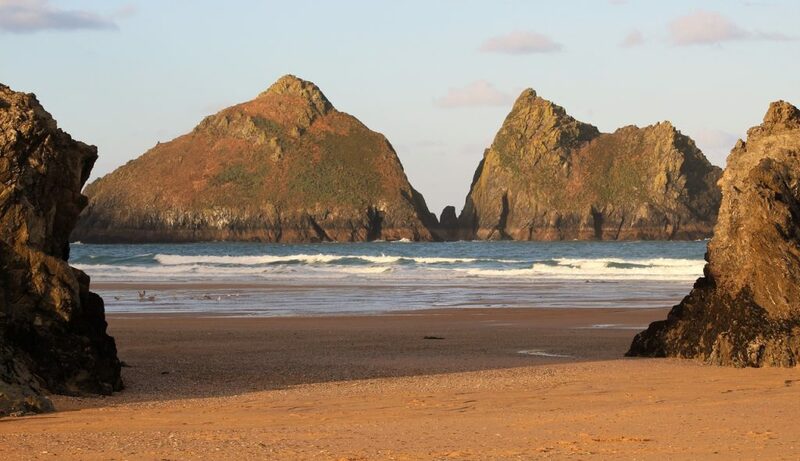 Driving past The Rumps we stopped at the cosy Port Quin inlet, taken care of by the National Trust. 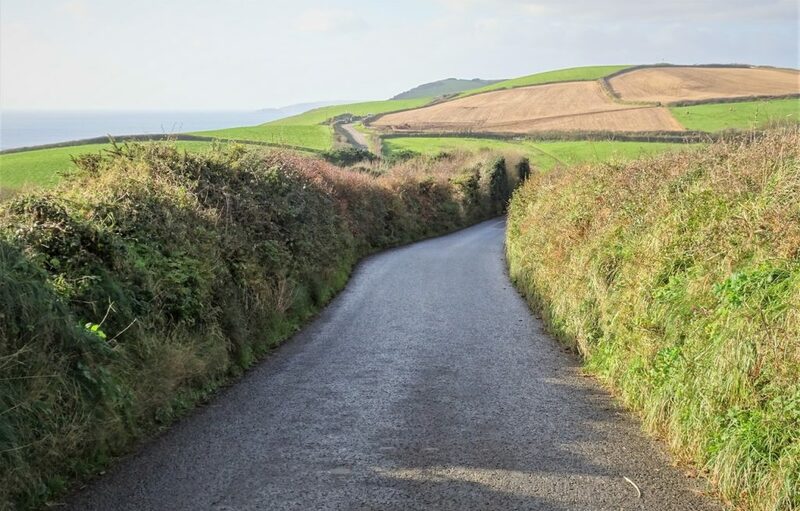 Driving to Port Isaac we realised we were going to end up driving right through the tiny village. We had remembered the lanes were really narrow from our trip here last year, so re-routed to park at the top of the village and walk down. 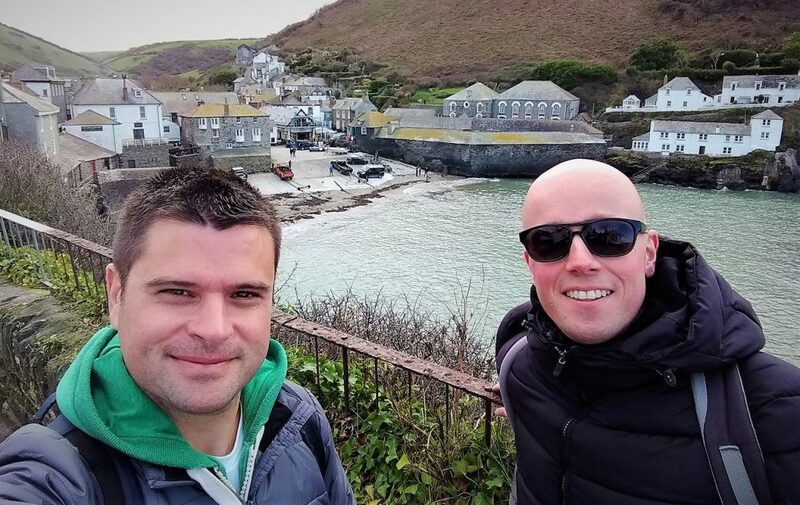 The TV series Doc Martin is filmed in Port Isaac. 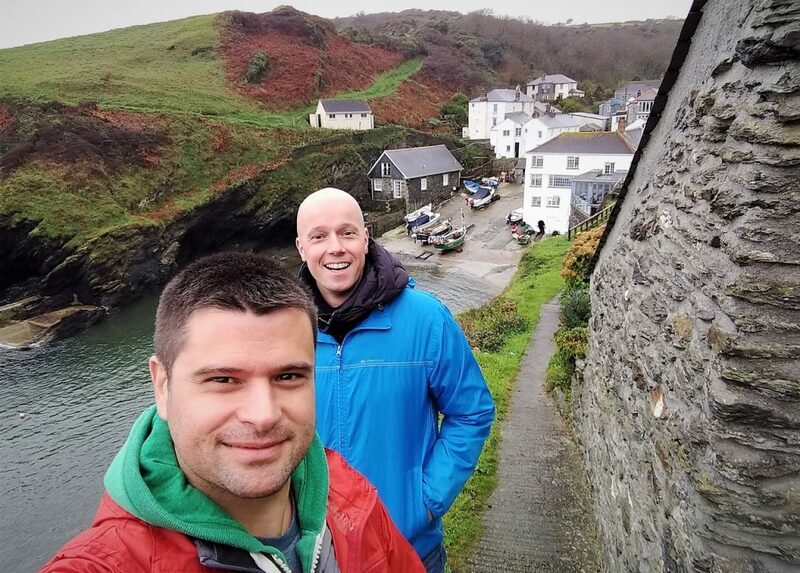 To be honest we have never watched Doc Martin so weren’t as excited as some visitors…. 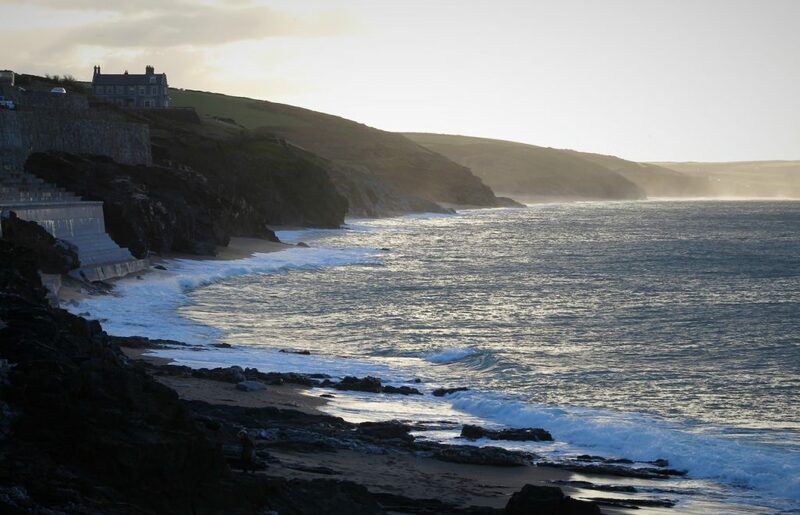 Choppy waters at the mouth of Port Isaac looking towards Varley Head. 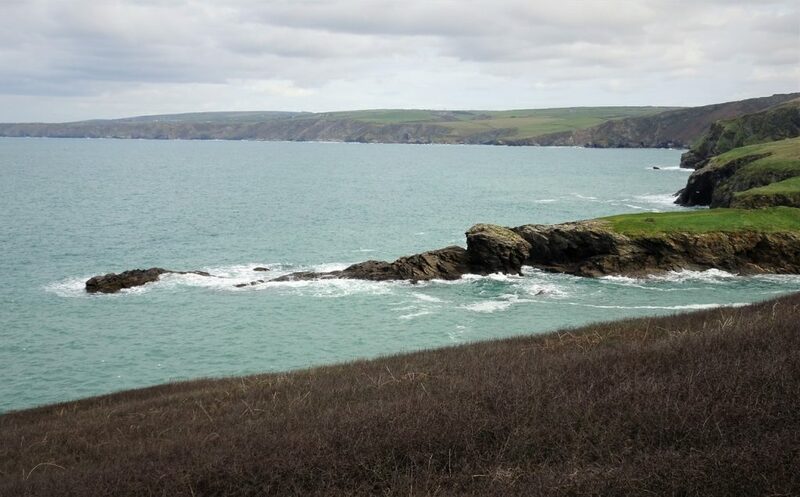 Port Isaac Bay, with views northeast to Treknow. 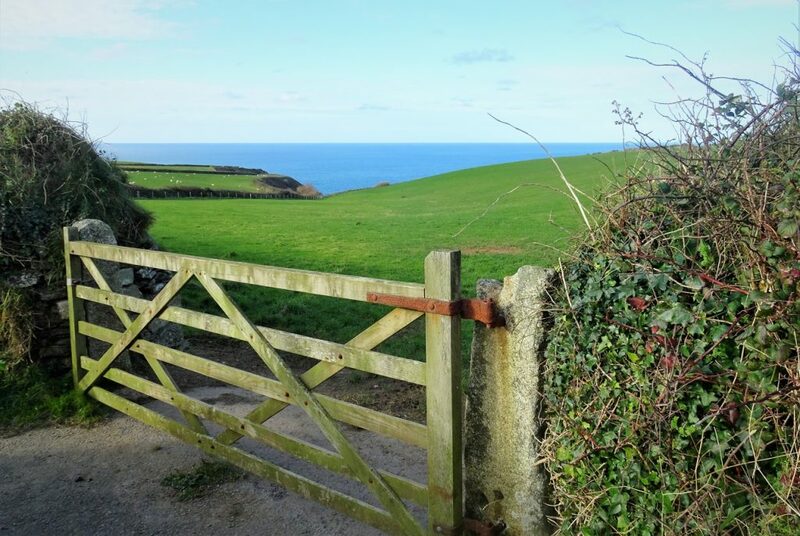 Catching another glimpse of Port Isaac Bay over the fields near St Teath. 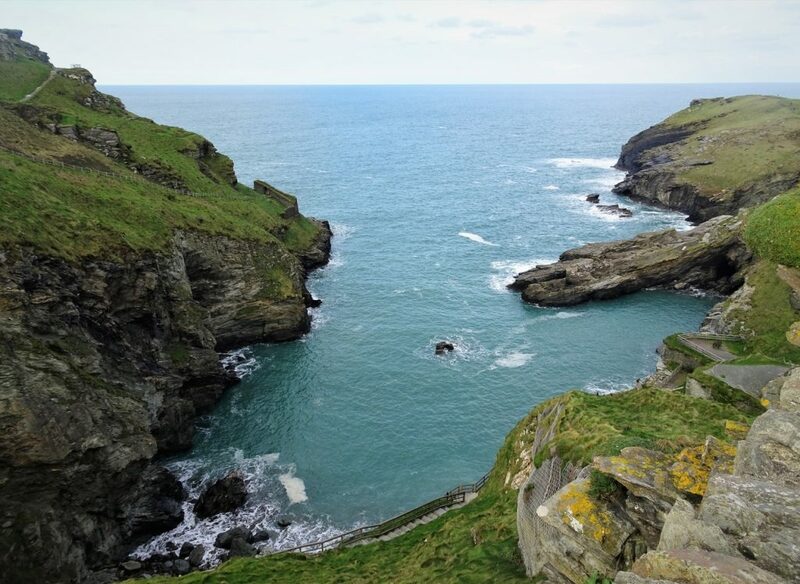 The remains of the 13th century castle perched on the jagged slate cliffs. 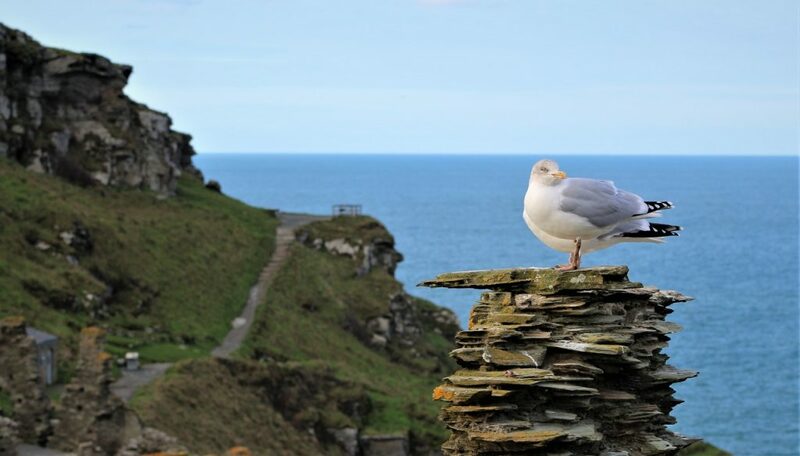 The castle had been built here by Earl Richard of Cornwall, believing it to be the birthplace of King Arthur. 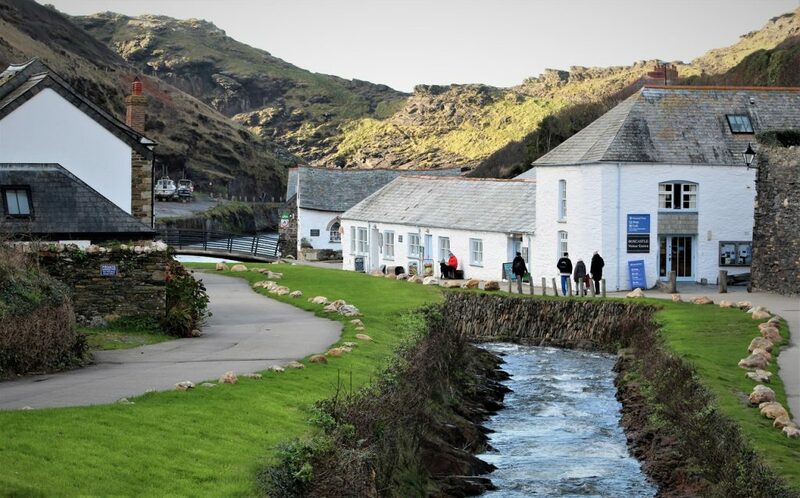 Boscastle had been devastated by the flooding of the River Valency in 2002, but has since been lovingly restored. 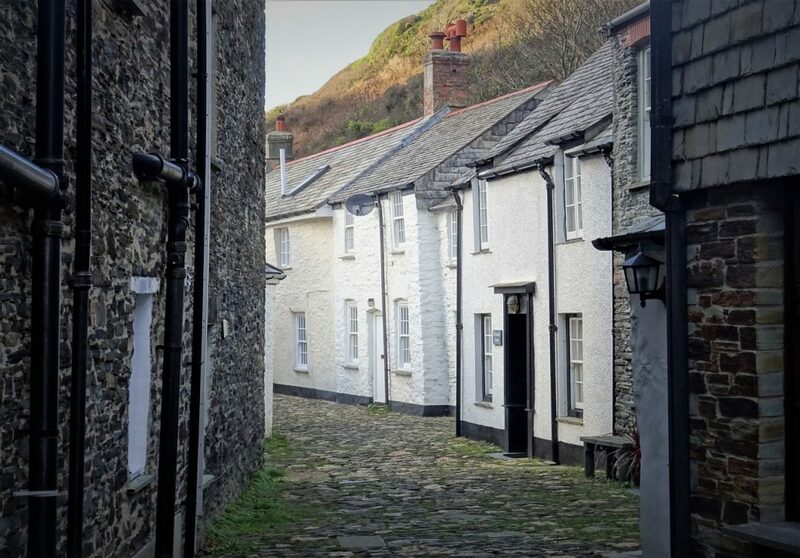 Fishing cottages down the cobbled Valency Row in Boscastle. 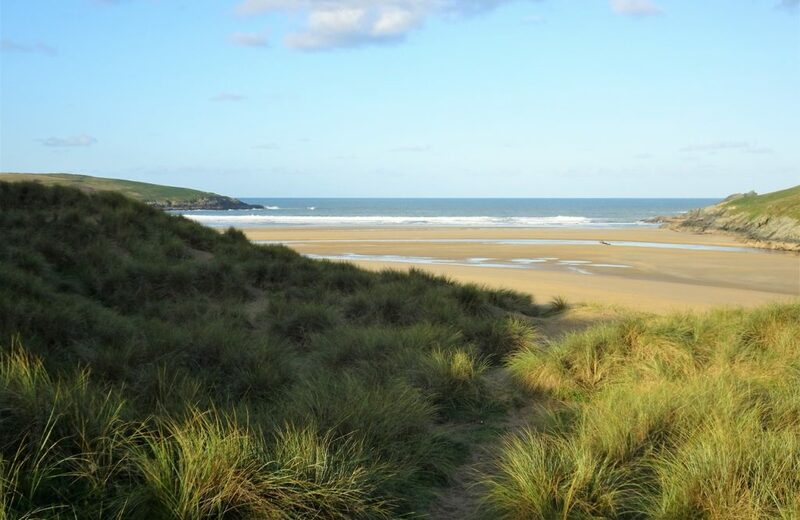 Widemouth Beach, popular with surfers, with Dizzard Point in the distance. 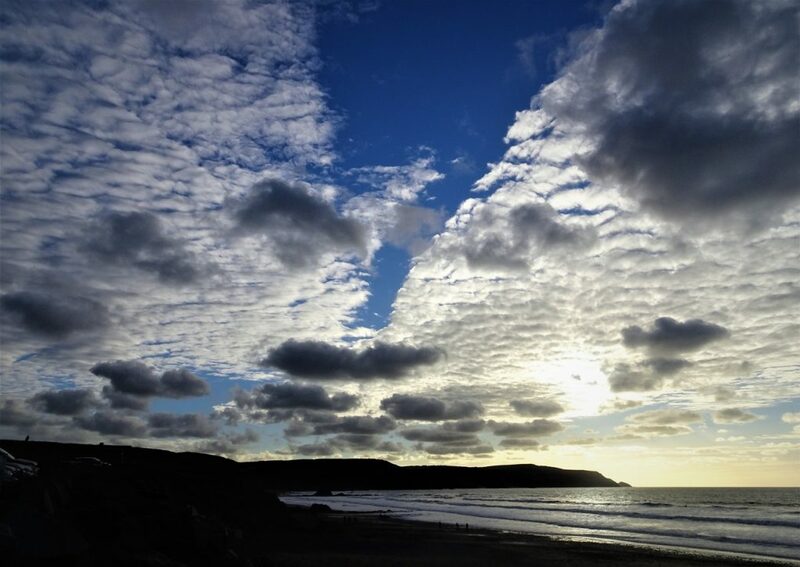 The clouds were parting like a zip to reveal the blue sky above Widemouth Bay. At last!…. 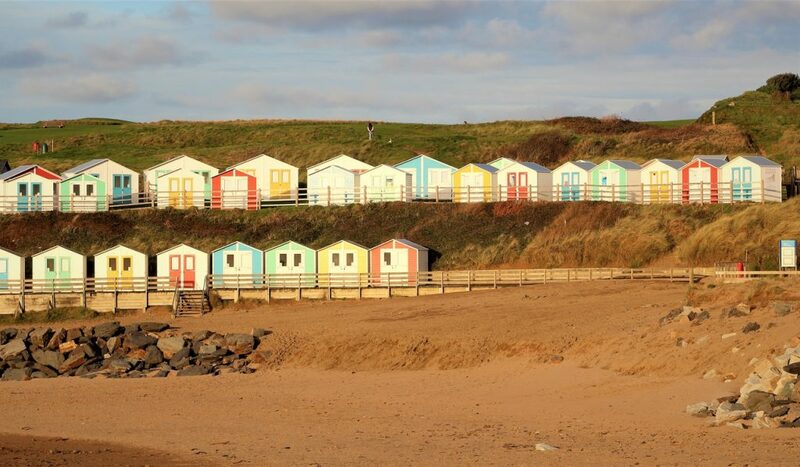 beach huts again on Summerleaze Beach at Bude, we had been missing beach huts on this stretch of coast. 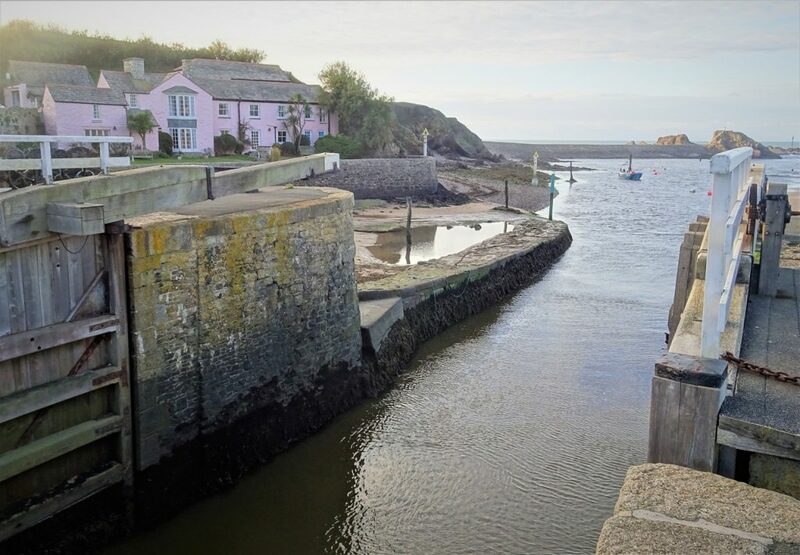 The entrance to the Bude Canal. Started in the 1820s with the idea to link the English and Bristol Channels… however it didn’t get very far with the arrival of the railway later in the 19th century. Leaving Bude and heading along the Hartland Cornwall Heritage Coast towards Morwenstow, the view was dominated by the satellite dishes at GCHQ Bude. 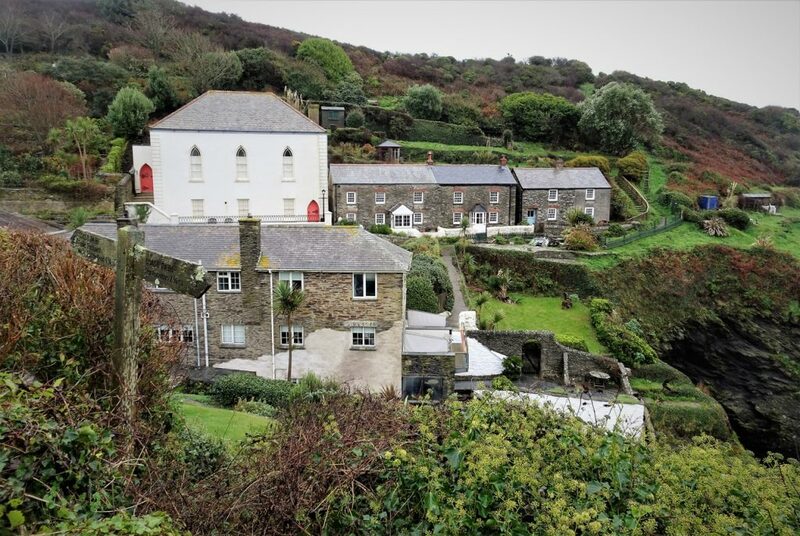 Before leaving Cornwall we stopped at Morwenstow, Cornwall’s northernmost point. We had intended to walk to the Hawker’s Hut along the cliffs. But a very muddy field was slowing our progress, we weren’t exactly sure we were on the right track, and light was fading fast. 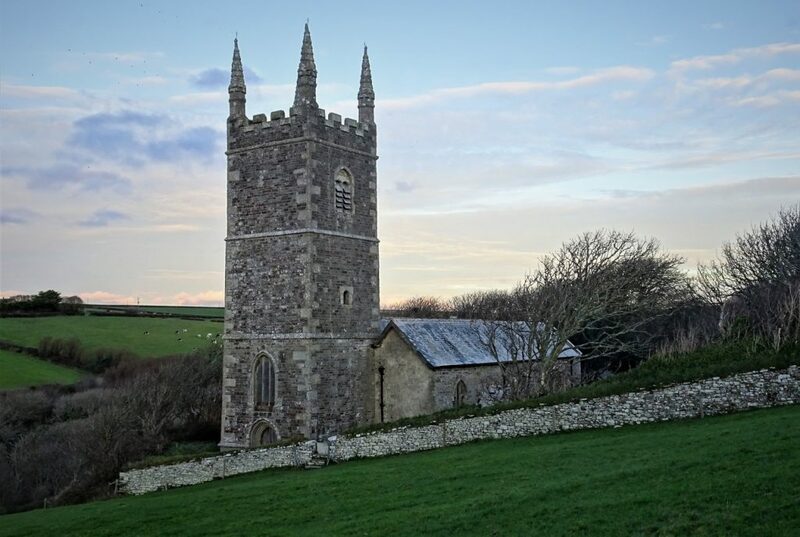 So we made do with the Church of St Morwenna and St John the Baptist across the fields. On the way to Bideford, we made our final stop of the day at Hartland Quay. 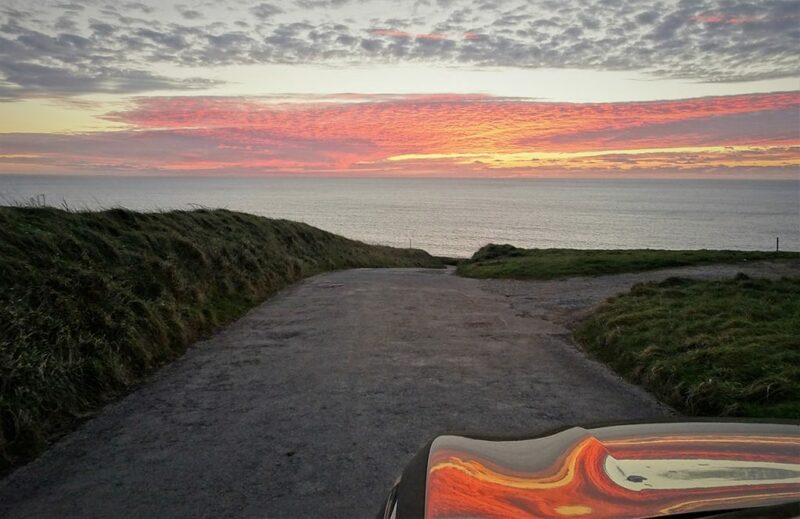 As we drove down the coastal track the sunset reflected beautifully off the car bonnet. Originally we had planned to also stop further along the coast at Clovelly, but it seems it was probably closed, and it would have been dark by then anyway. Oh well, we will leave Clovelly for another trip! 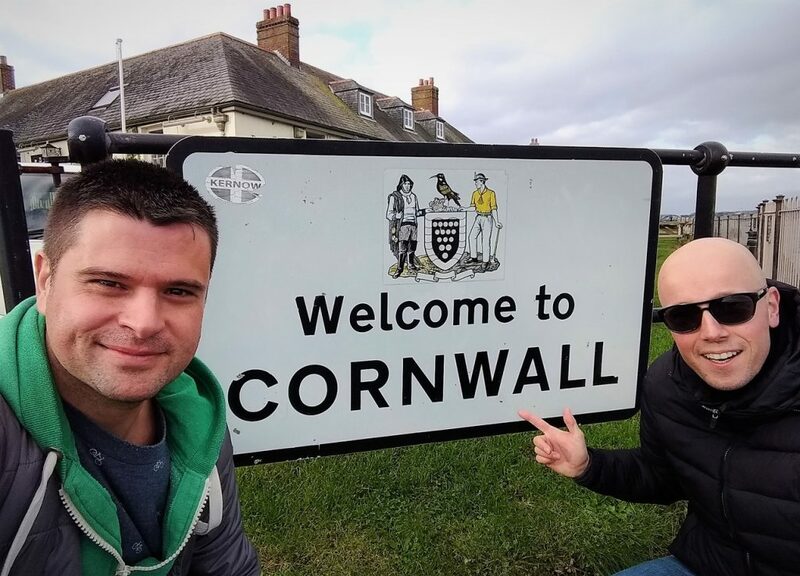 We will be driving just over one-hundred miles today as we head along the south coast of Cornwall to Land’s End, and back up the north coast towards Newquay. 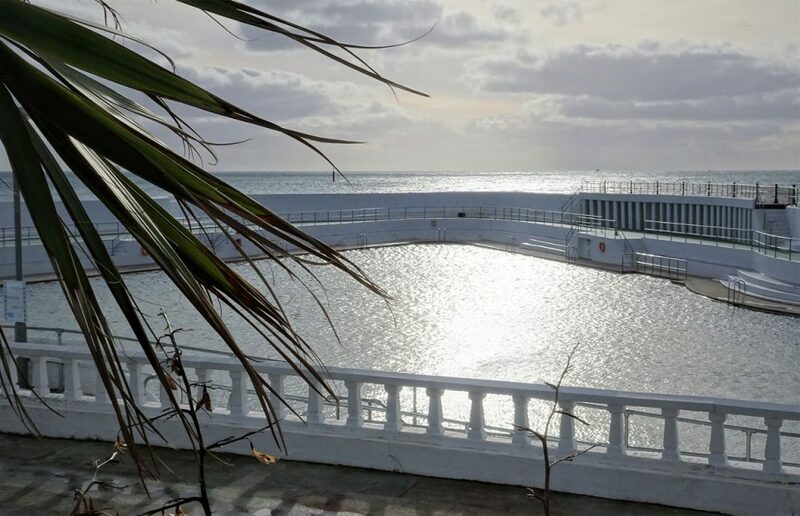 The weather has improved from yesterday’s miserable effort – yay! 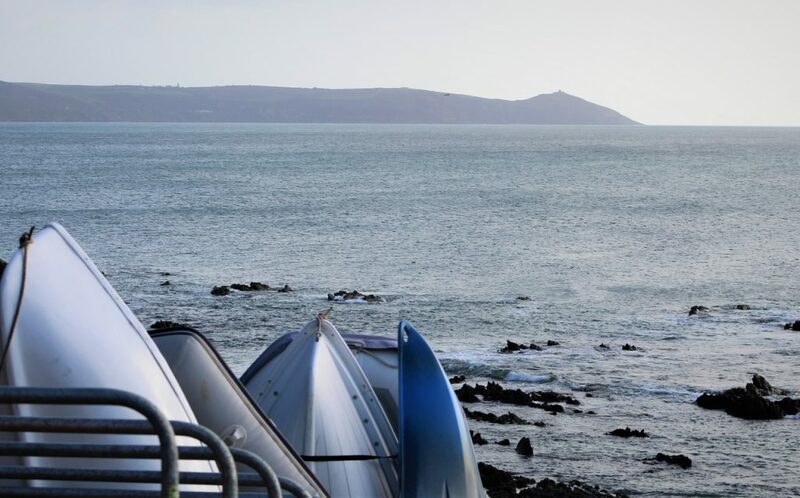 After leaving our base for the night at Helston, we drove straight down to the coast at Portleven to take in the early morning views back down the west side of the the Lizard Peninsula. Portleven Harbour was just waking up on this early Sunday morning. At Rinsey Cove we walked down to Wheal Prosper, an old engine house that was used to pump water out of undersea copper and tin mines. Even the National Trust car park had been built above an old mine shaft. Wow, what a position for a house. 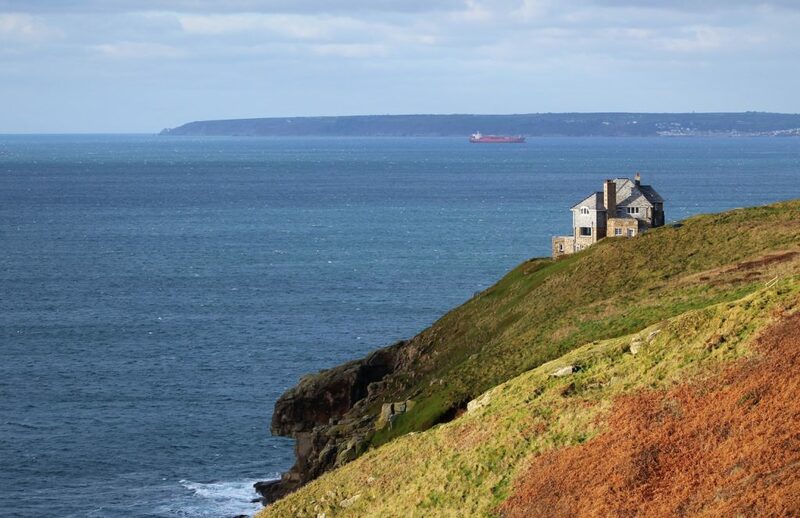 Perched on Rinsey Head with magnificent views across Mount’s Bay to Mousehole, Black Rock and Lamorna. 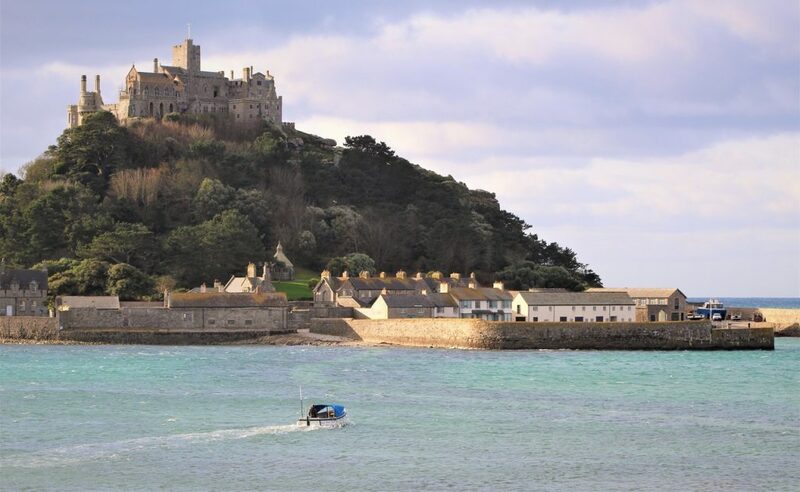 St Michael’s Mount across Mount’s Bay came into view as we drove towards Marazion. Over the years the original Abbey on the island was absorbed into a fort, then later a grand house built by the St Aubyn family. When we have time we would like to go back and take the ferry across to explore the small island properly. 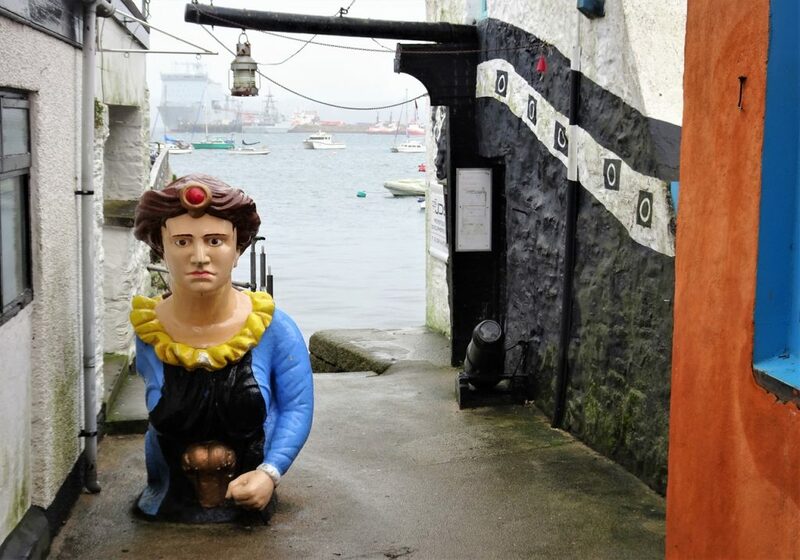 Penzance was a curious town, and like Falmouth yesterday, it was larger than we had expected. 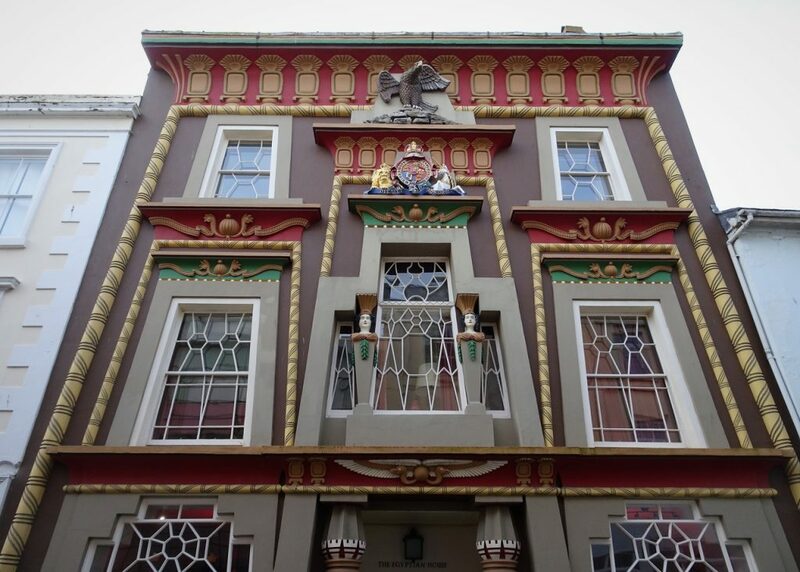 Walking down Chapel street we came across the unusual Egyptian House. 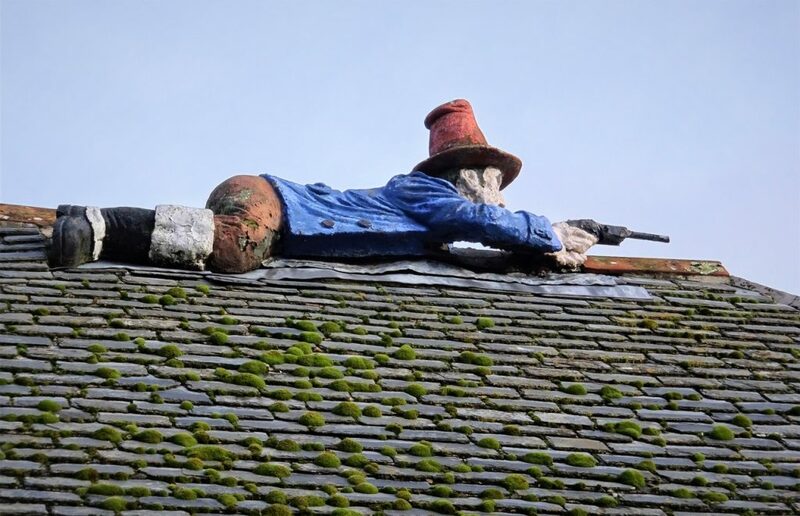 Further down the road there was a Cornish pirate on the roof of the local pub (Admiral Benbow Inn). 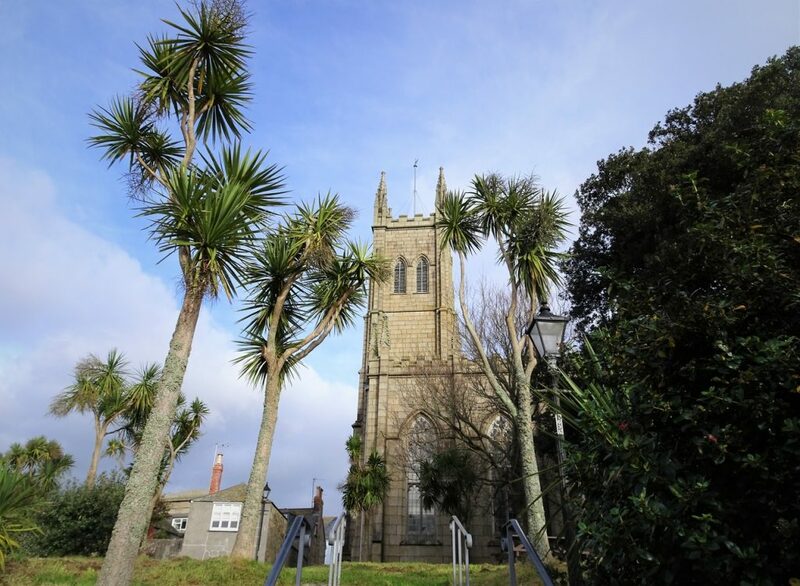 Cutting down to the harbour, tall palm trees surrounded St Mary the Virgin Church. More pirates at the next pub! 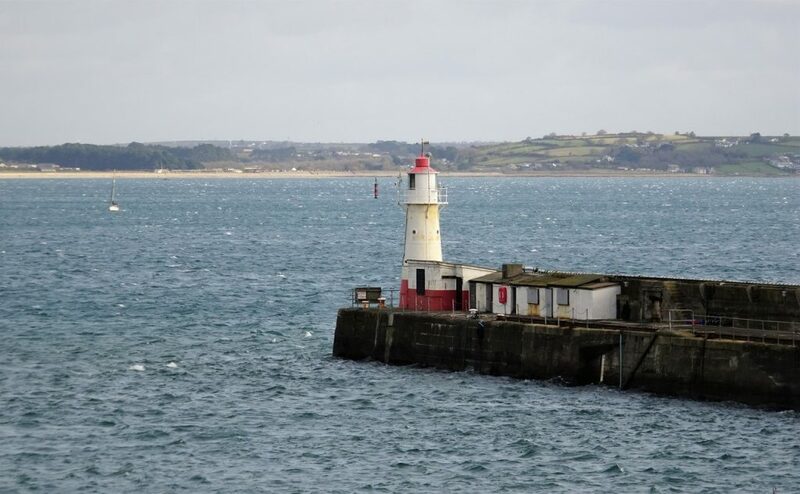 The Newlyn South Pier Lighthouse at the entrance to Newlyn harbour, just southwest of Penzance. 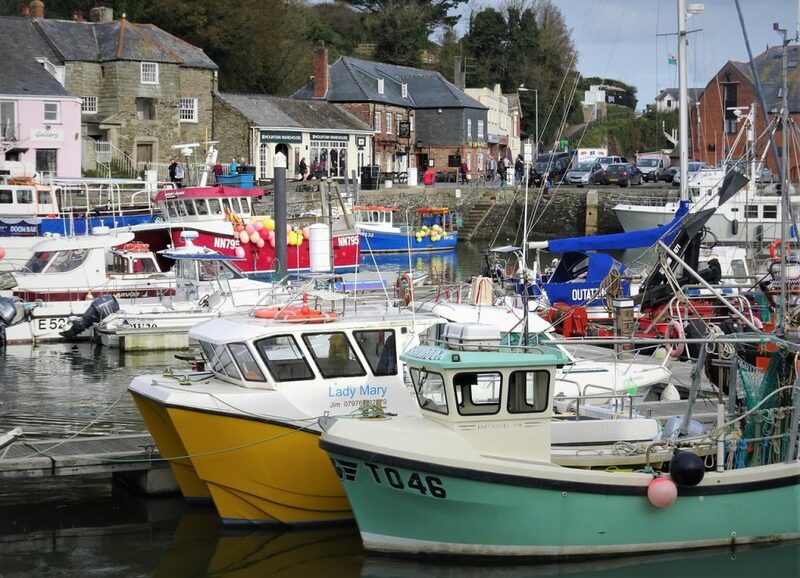 The harbour is home to the largest fishing fleet in Britain. 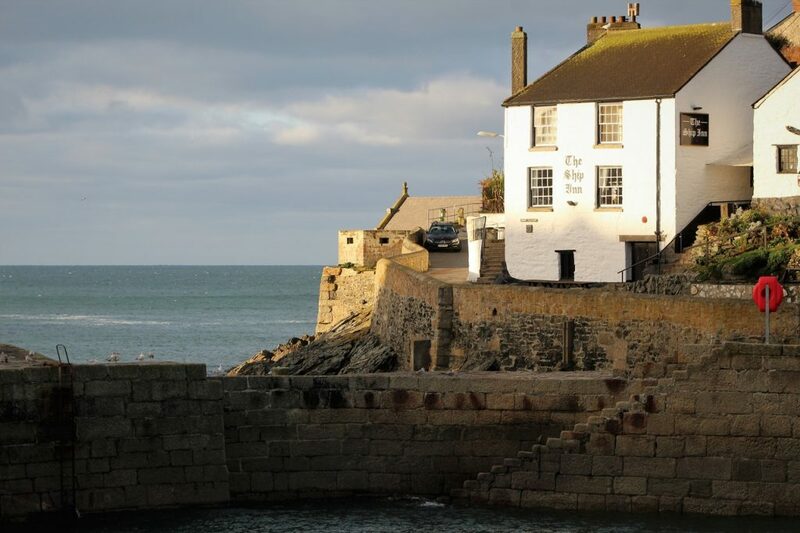 Yes, you read right, there is a place called Mousehole. What a cool name, though it is actually pronounced ‘Mowzall’. 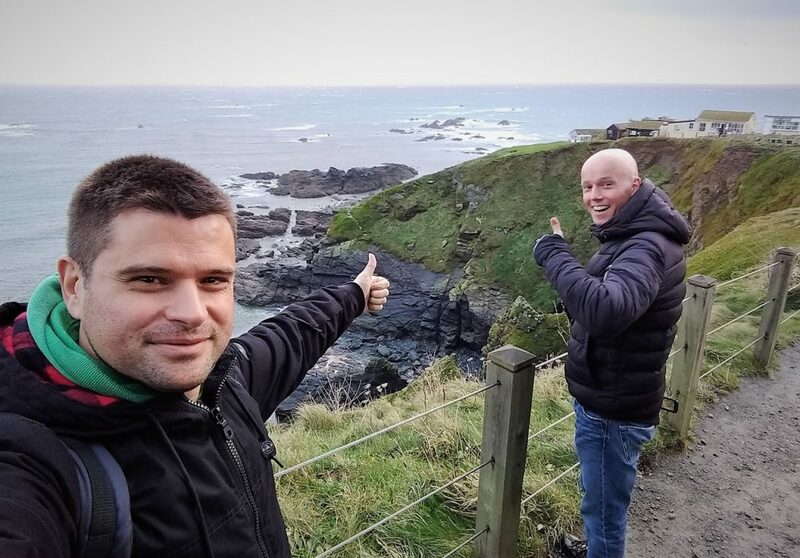 We stopped by the Rockpool Cafe to look at the views across Mount’s Bay…. …. 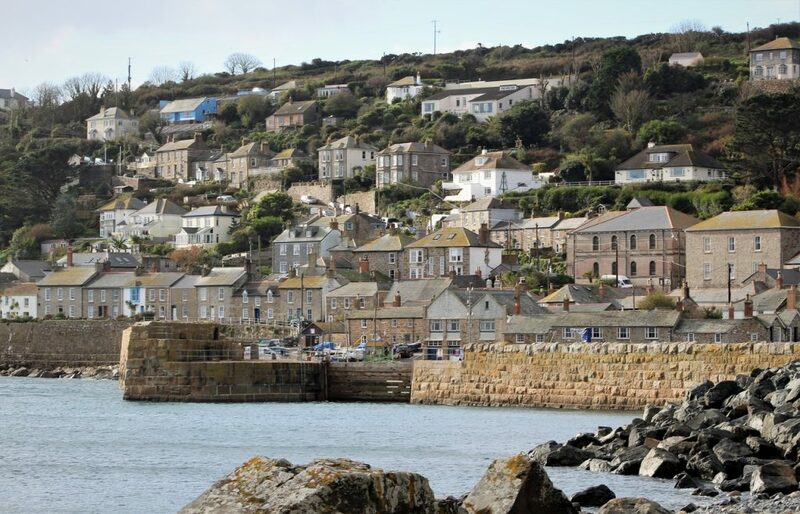 and south to the granite cottages overlooking Mousehole’s harbour front. 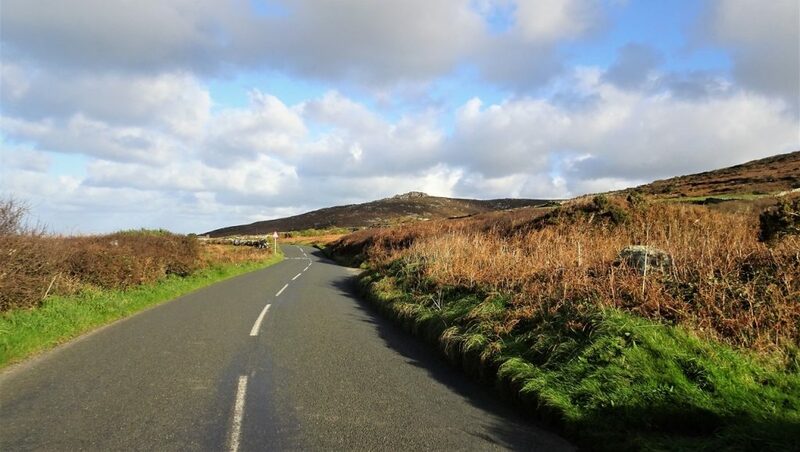 We then set-off to wind our way through its narrow Cornish lanes. 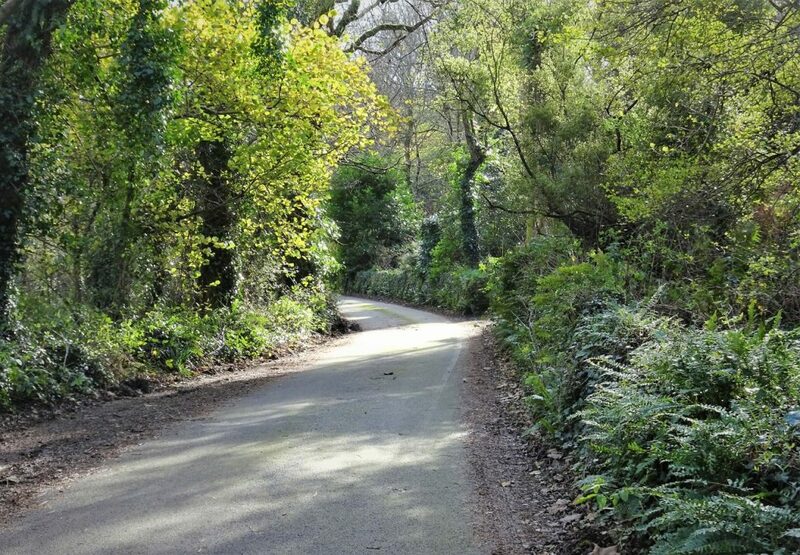 Continuing on towards Land’s End, we drove alongside a trout stream, through the beautifully wooded Lamorna Valley, down to Lamorna Cove. Waste from the cove’s 19th and early 20th century granite quarries was precariously heaped down the hillside. 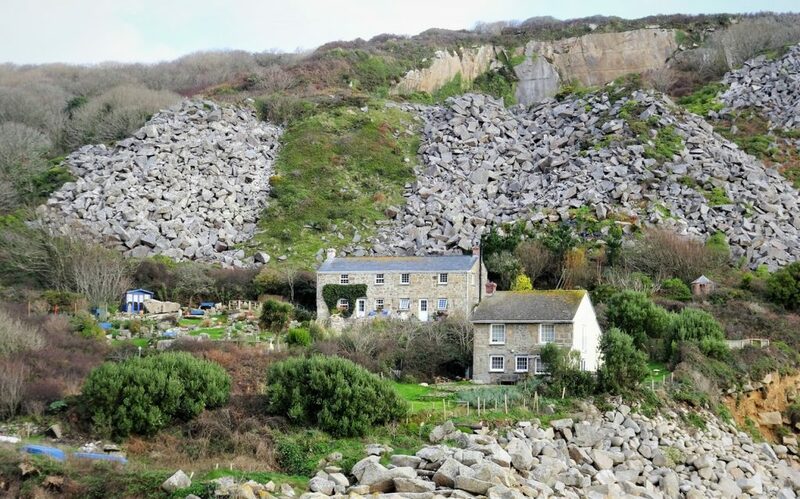 The cottages looked a little to close to those huge boulders for comfort. The quarries had been used to provide granite to build London’s Thames Embankment. The view out past Black Rock to Mount’s Bay. 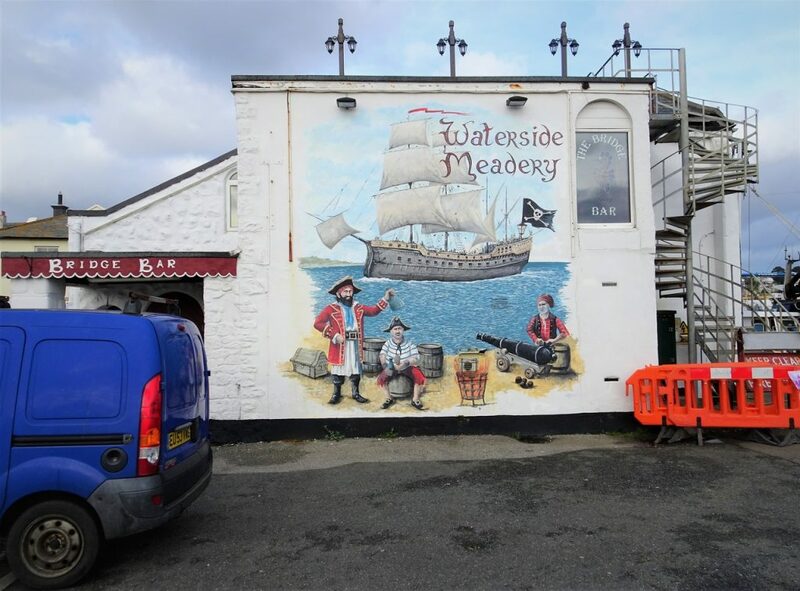 Wandering around the quay, we noticed this sign on the way back to the car… bit late. 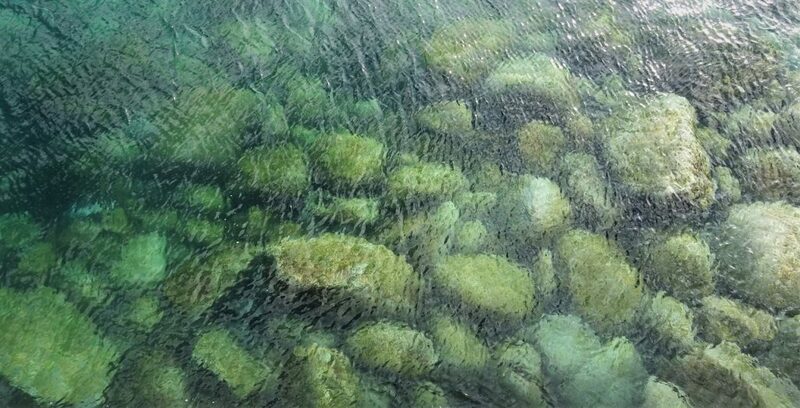 The cove’s waters were crystal clear. 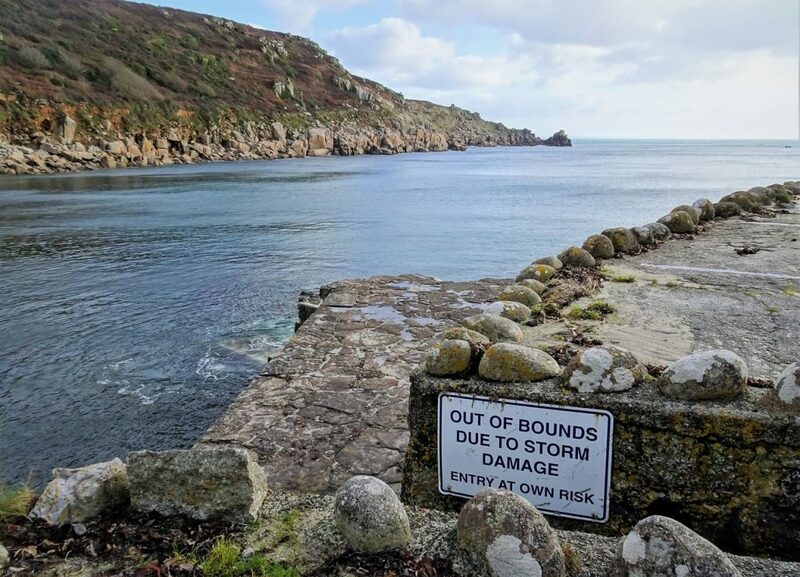 No chance of having our morning coffee here, the Lamorna Cove Cafe was closed until next year. 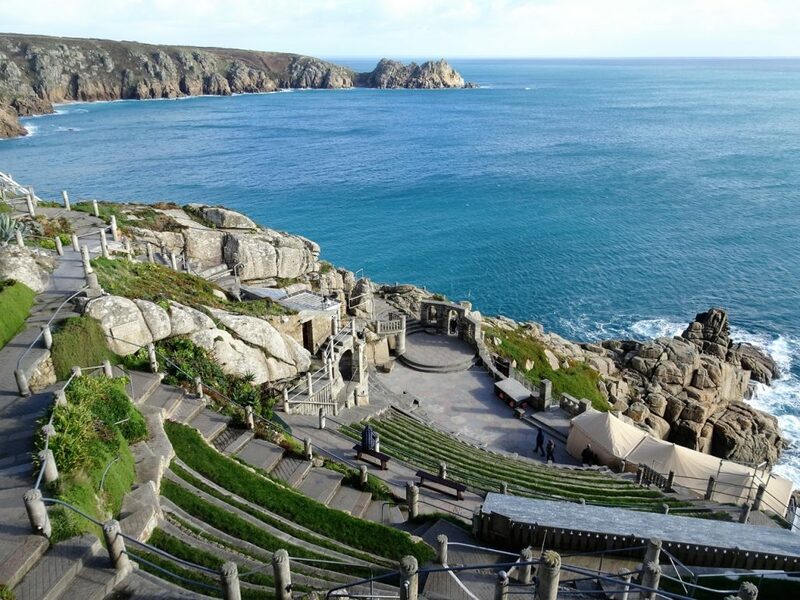 The truly spectacular open-air Minack Theatre at Porthcurno, with its stunning turquoise sea backdrop. 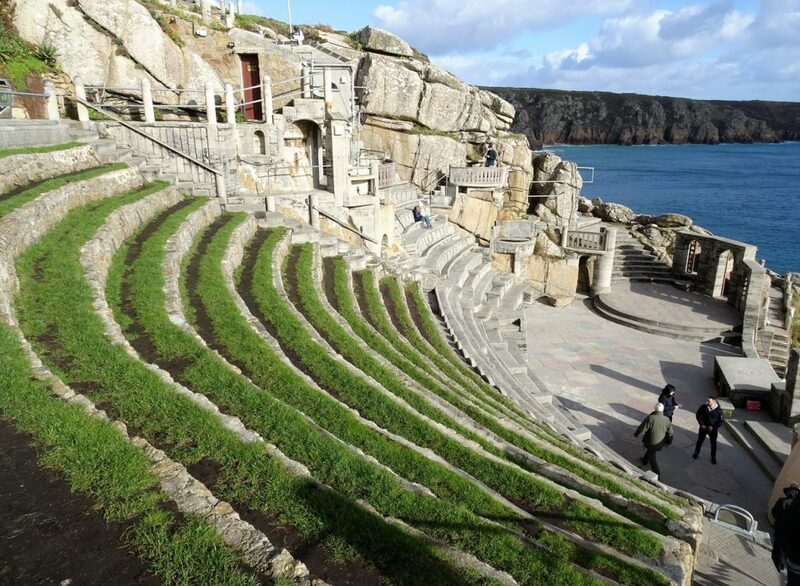 The brainchild of Rowena Cade, who started building the theatre with her gardener in the early 1930s, a true inspiration. The entry fee also included access to a small but interesting exhibition telling the theatre’s story. The theatre really was the highlight of our day. We would love to come back in season and join the 80,000 people that enjoy a performance here every year. 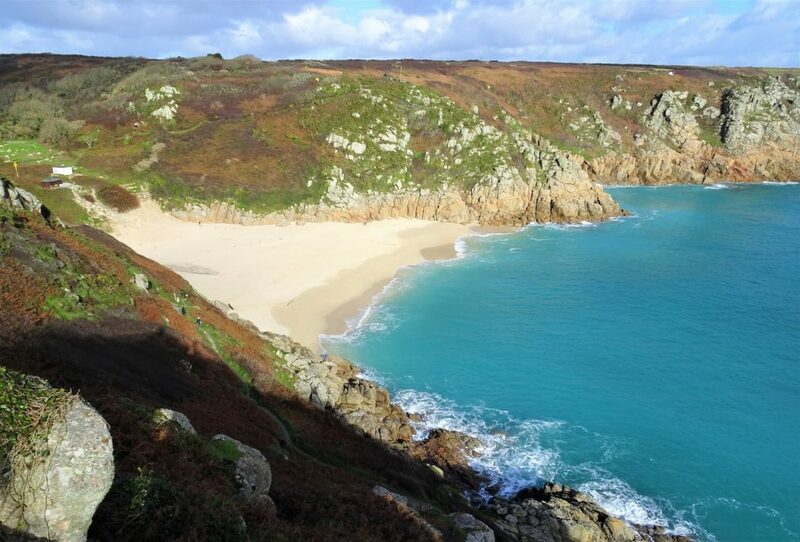 Porthcurno Beach, next to the Minack Theatre, was equally impressive. 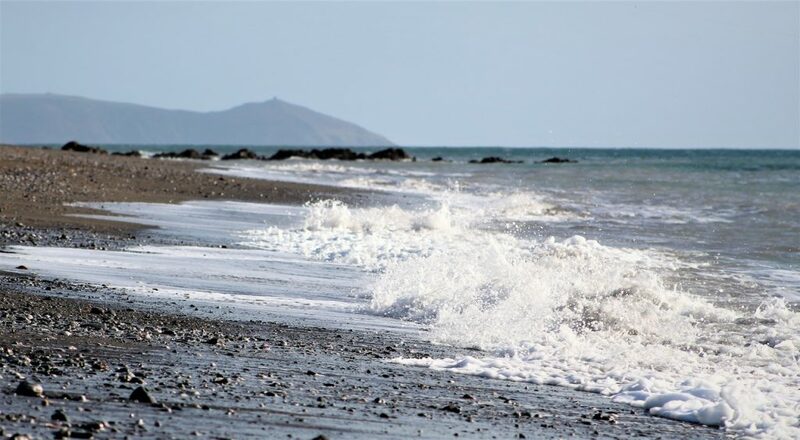 The golden sand and the turquoise sea were glowing in the midday sun. 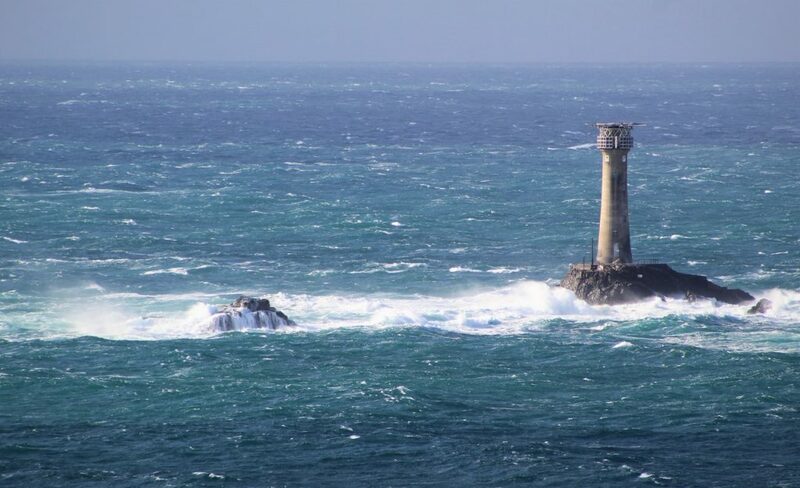 The rather brutal looking Longships Lighthouse, just off Land’s End on Carn Bras. 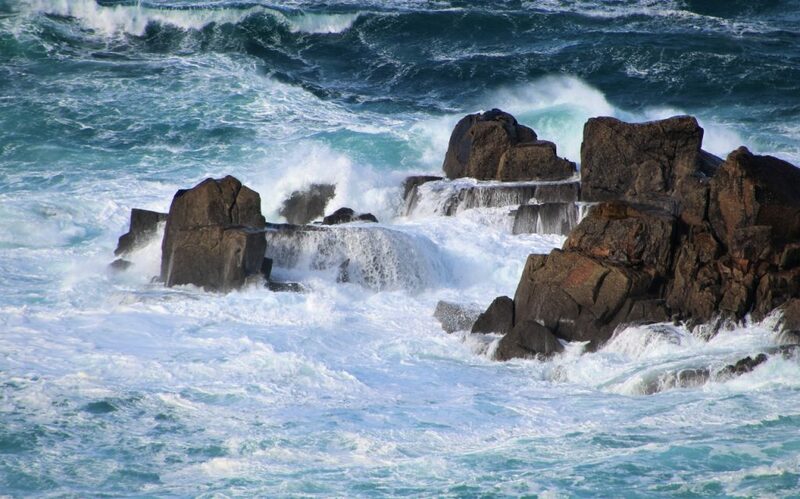 Waves crashing over the rocky coastline surrounding Land’s End. 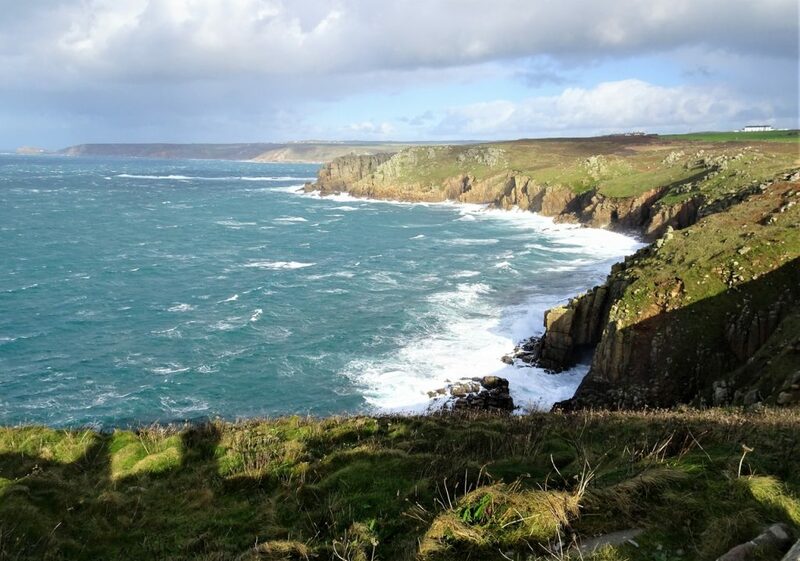 We had great views north from Land’s End across the rather choppy Whitsand Bay to Cape Cornwall. 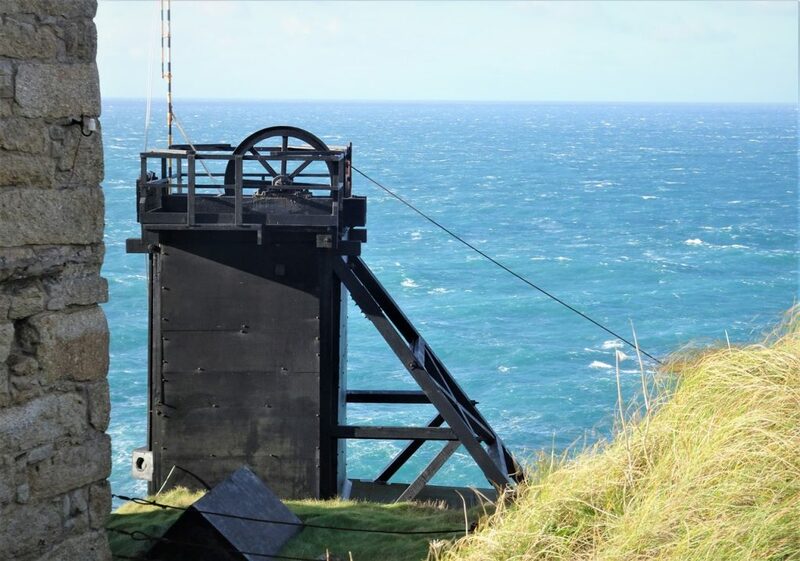 Driving north along Whitsand Bay, we arrived at Pendeen and the National Trust’s Levant Mine. Like Wheal Prosper this morning, these were the remains of engine houses that pumped water from the undersea copper and tin mines. 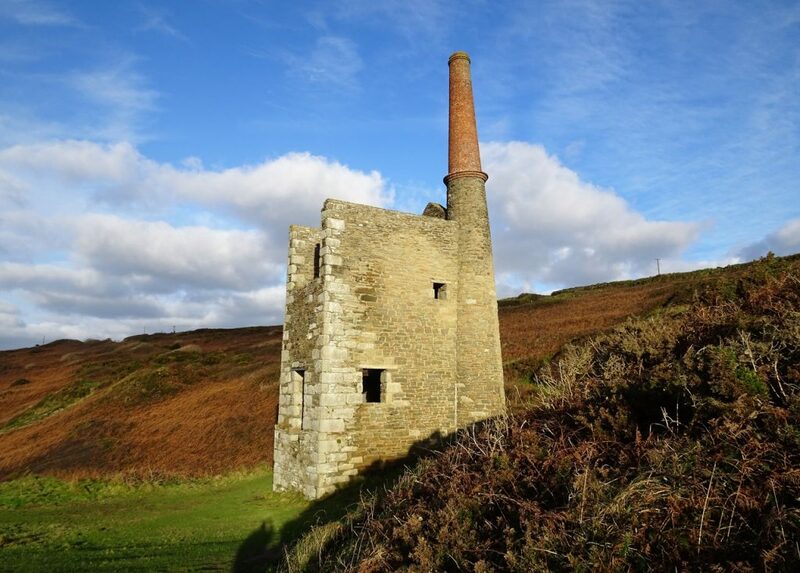 The National Trust had restored many of the buildings, and the site contains the only remaining and operating Cornish beam steam engine in the world. 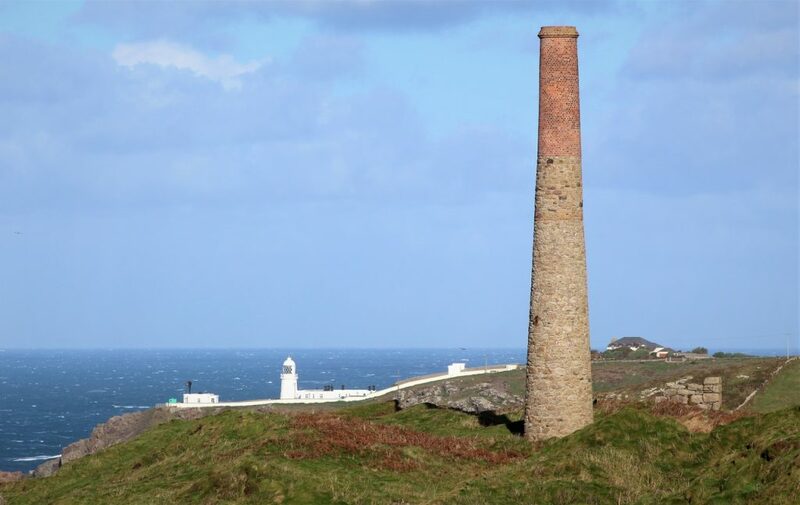 From the Levant Mine we could also see Pendeen Watch Lighthouse, looking out across Cornwall’s northwestern peninsula. Though it was tricky to get a good shot, as it was so windy. 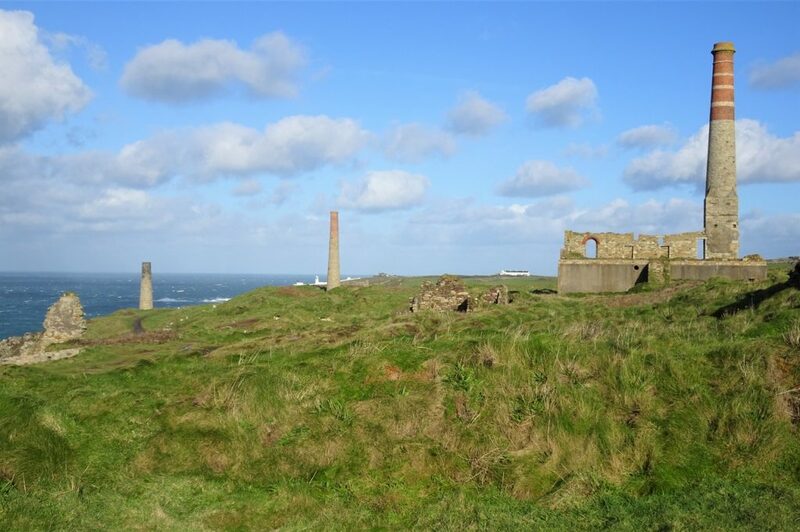 As we passed another National Trust mine at Carn Galver, the coastal road started to feel more barren and windswept. 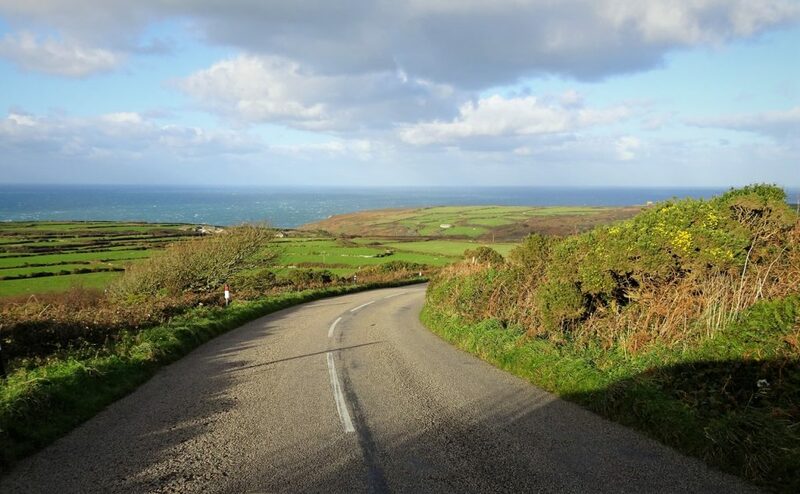 Continuing along the B3306 towards St Ives we had sweeping views past Treveal to the Atlantic Ocean. 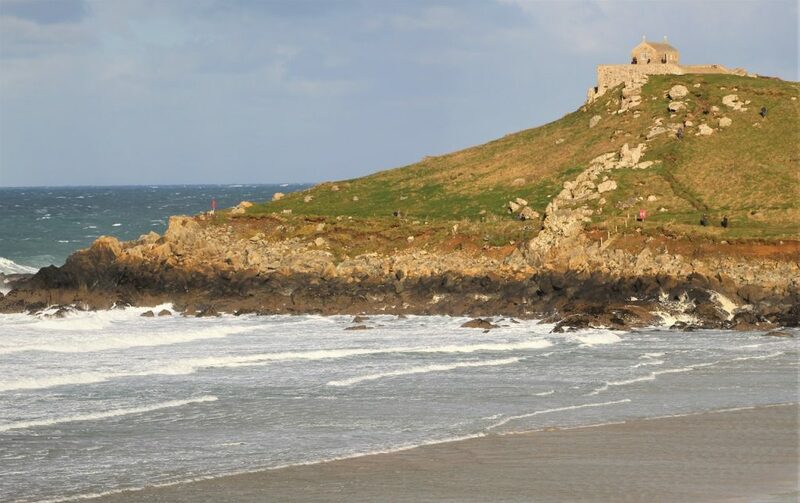 Arriving in St Ives, we made our first stop at Porthmeor Beach looking towards St Nicholas Chapel on the headland. 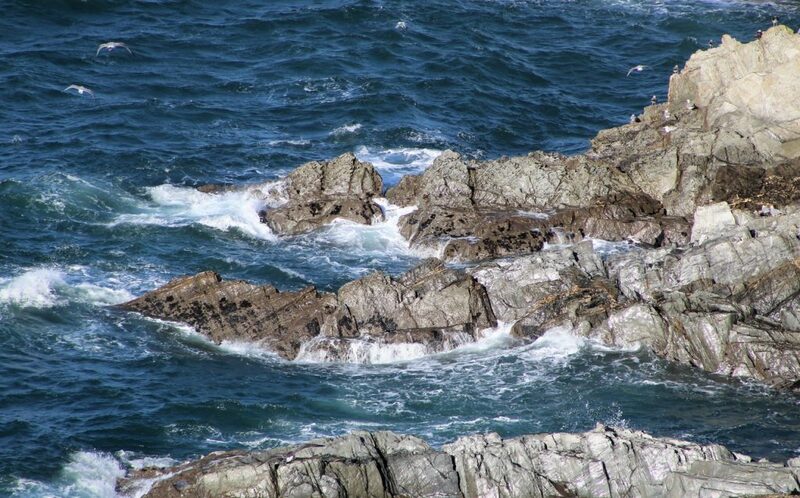 Waves were crashing against the rocks below the Southwest Coastal Path. 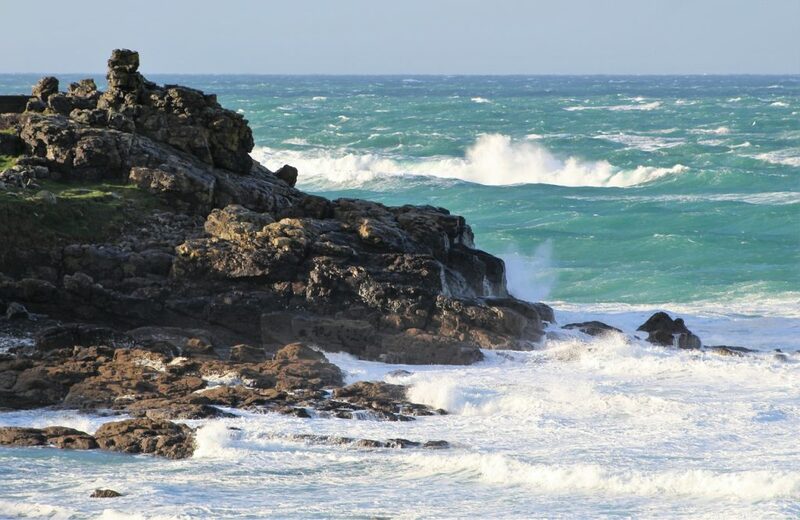 Salty sea spray filled the the afternoon air behind Porthmeor Beach and the Tate St Ives. 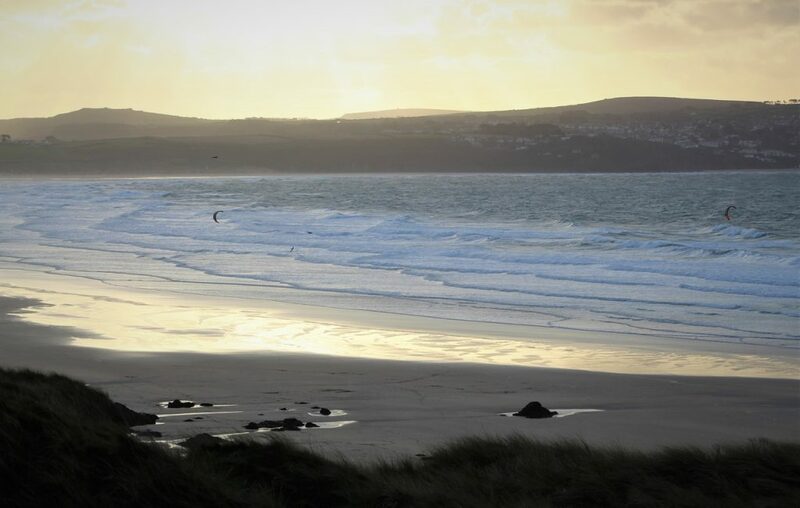 Looking back across St Ives Bay and kite-surfers enjoying the breeze at Gwithian Beach. 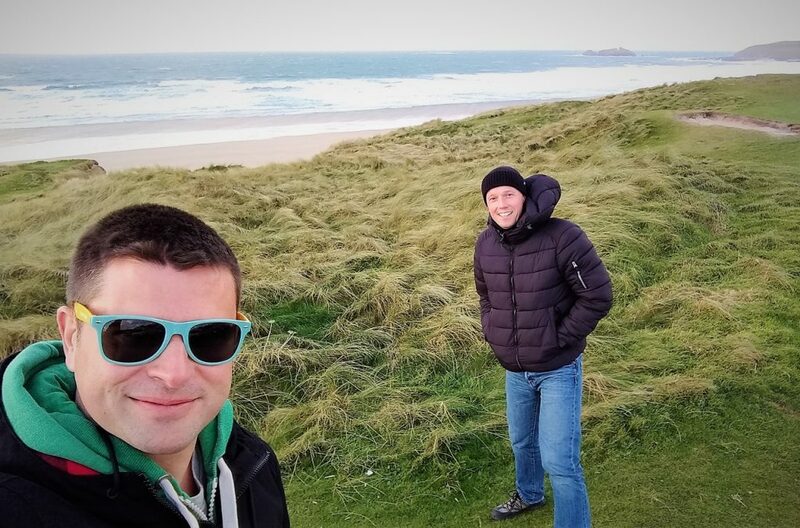 We look a bit cold at windy Gwithian Beach! 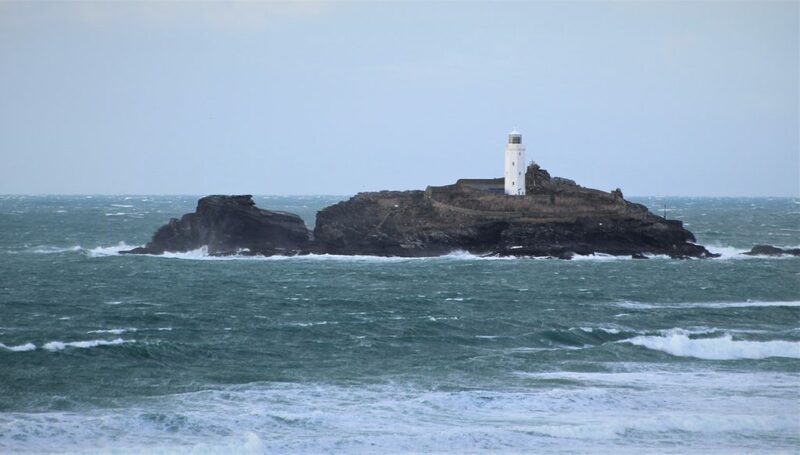 Godrevy Island and its lighthouse, northeast along Gwithian Beach. 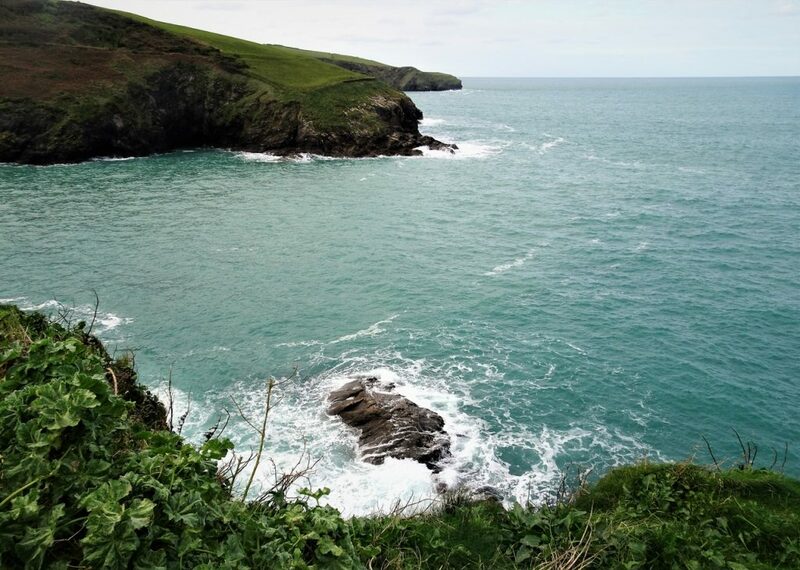 Driving along the cliff tops towards Portreath we stopped to peer over the edge of Hell’s Mouth towards Navax Point. 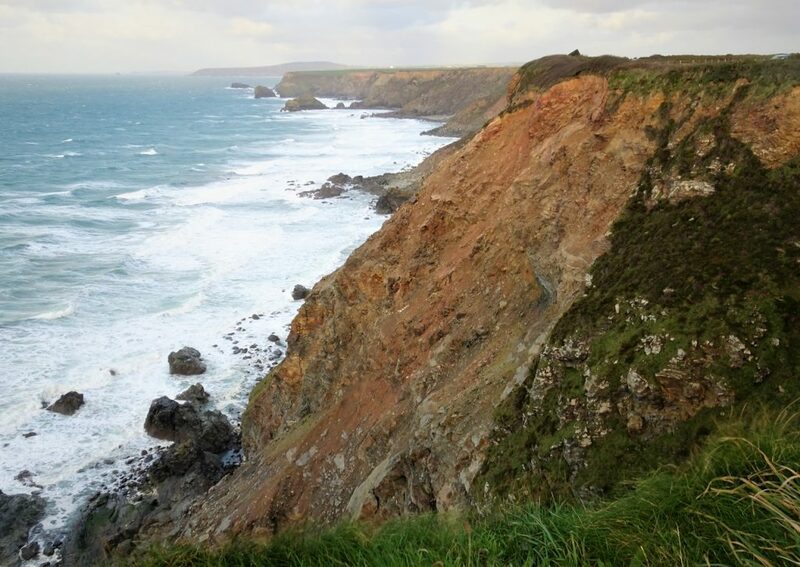 Then a little further along the coastal road, the red North Cliffs seemed to be crumbling away. You can just make out St Agnes Head in the distance. 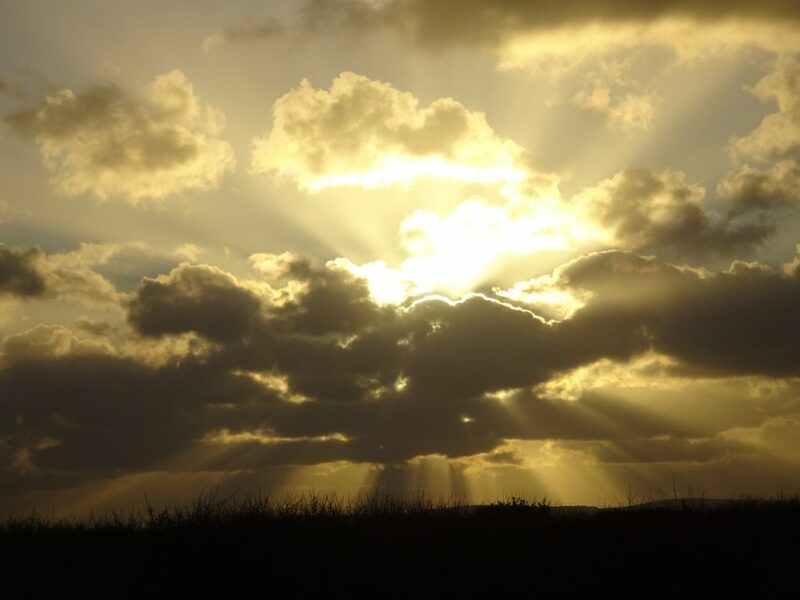 Looking behind us, golden sun-rays were bursting through the cloudy late afternoon sky. 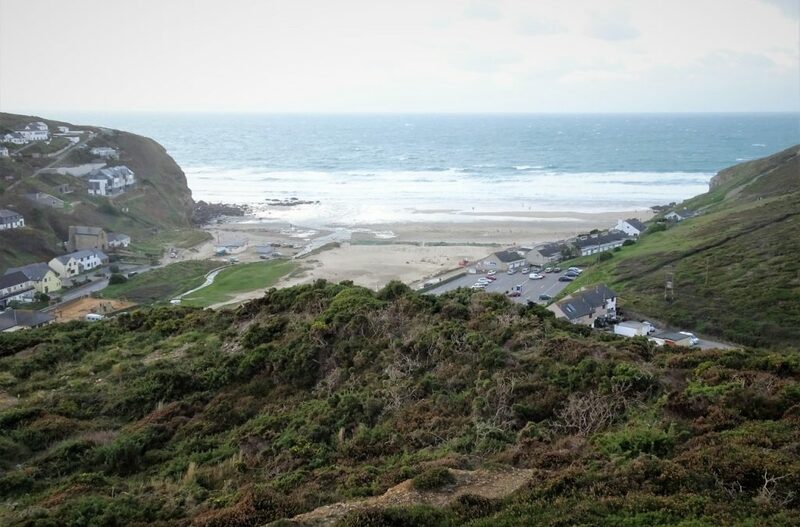 Continuing our journey towards Newquay, we made a quick stop to look down on Porthtowan Beach. 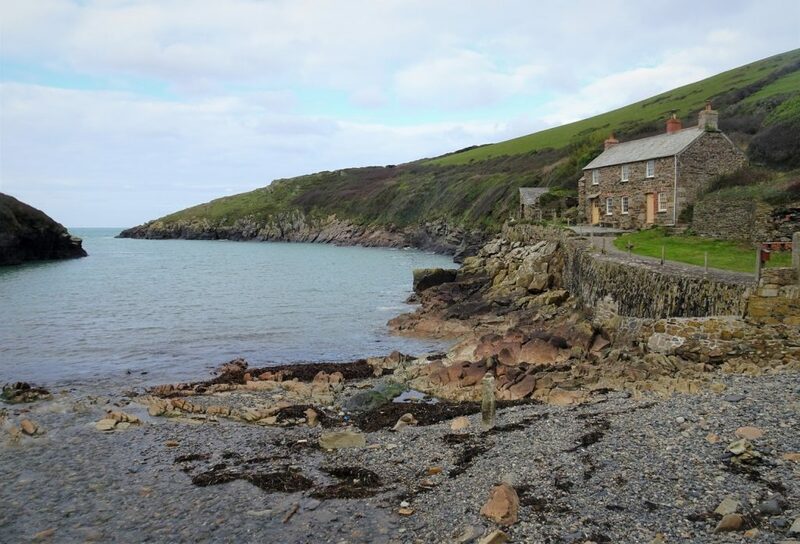 The National Trust Chapel Porth Beach was nestled into a cosy quiet cove just south of St Agnes Head. 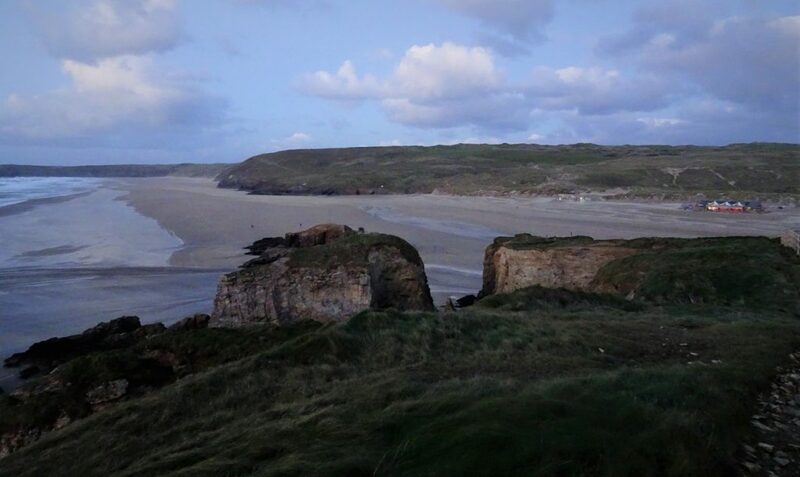 The sunlight had almost gone by the time we reached Perranporth Beach, hence a slightly grainy picture! But the Watering Hole cafe lit up on the beach looked quite inviting. 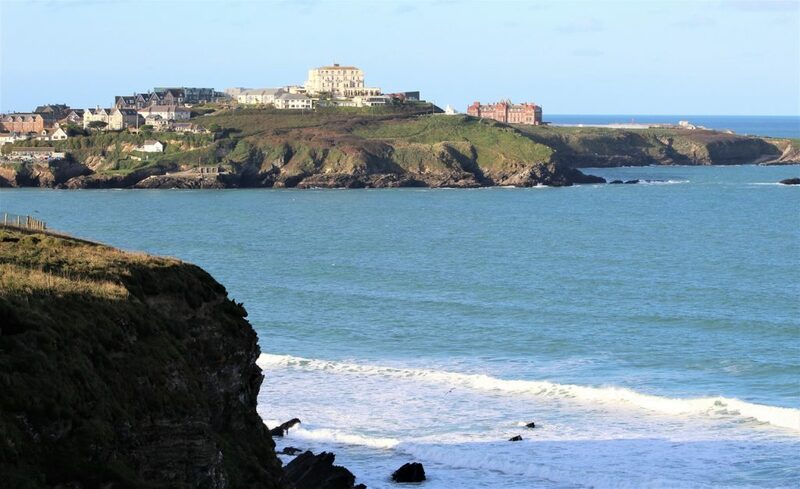 Newquay was our next stop for the night. 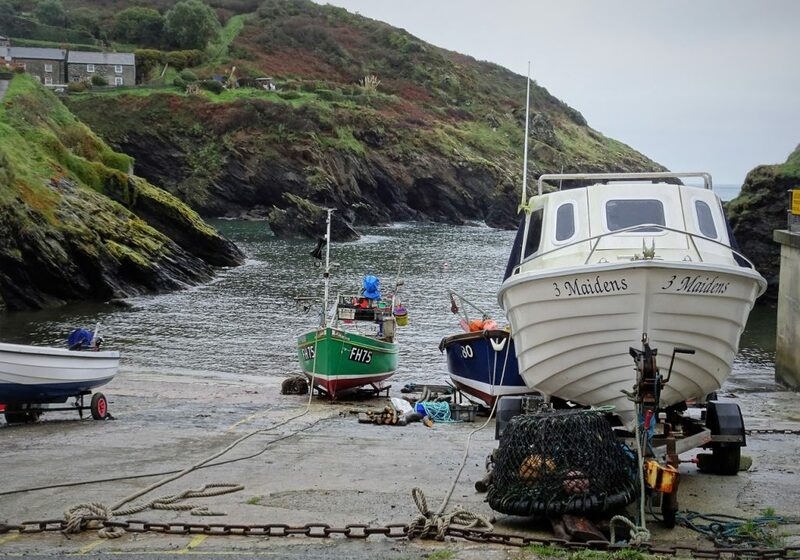 Fishing boats at Cadgwith Cove. 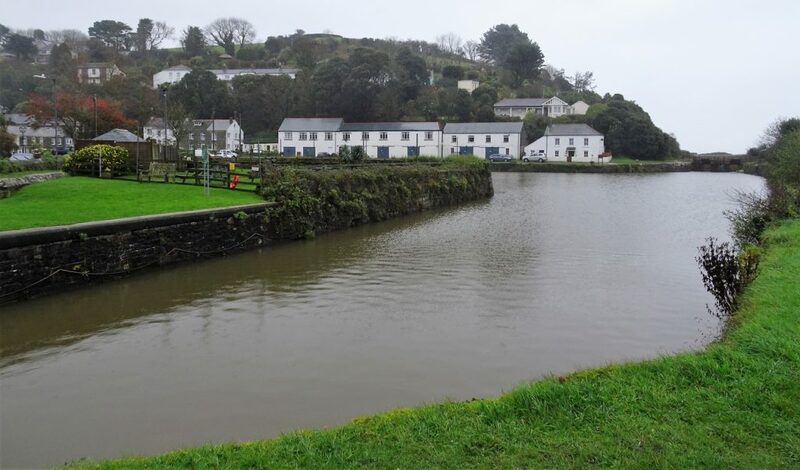 After leaving St Austell we followed the St Austell River to Pentewan. We were going to get soaking wet if we had walked to the beach, so made do with visiting the village set-back from the seafront. 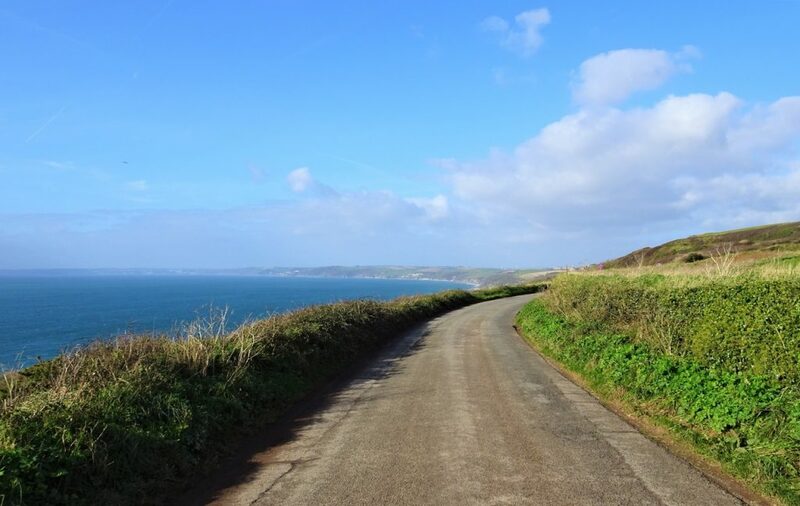 Leaving Pentewan heading to Mevagissey with views over the rolling fields to the coast. 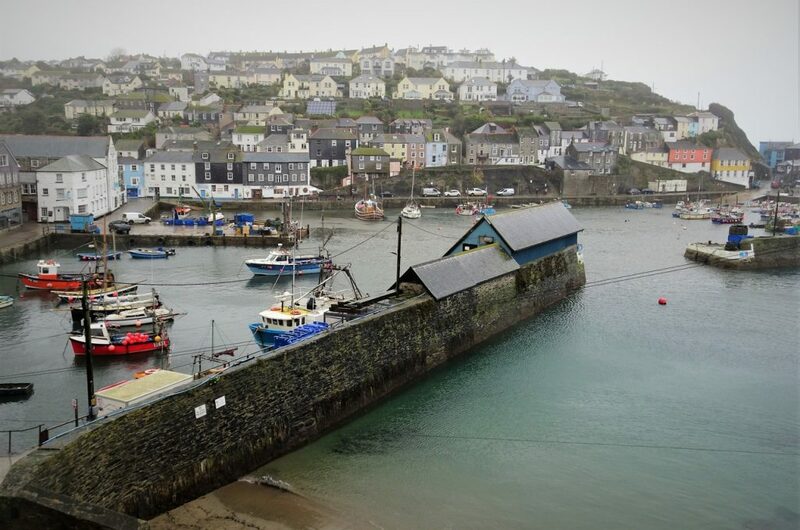 Mevagissey was still slowly waking up on this rainy Saturday morning. Everyone else had clearly decided it was better to stay in bed. 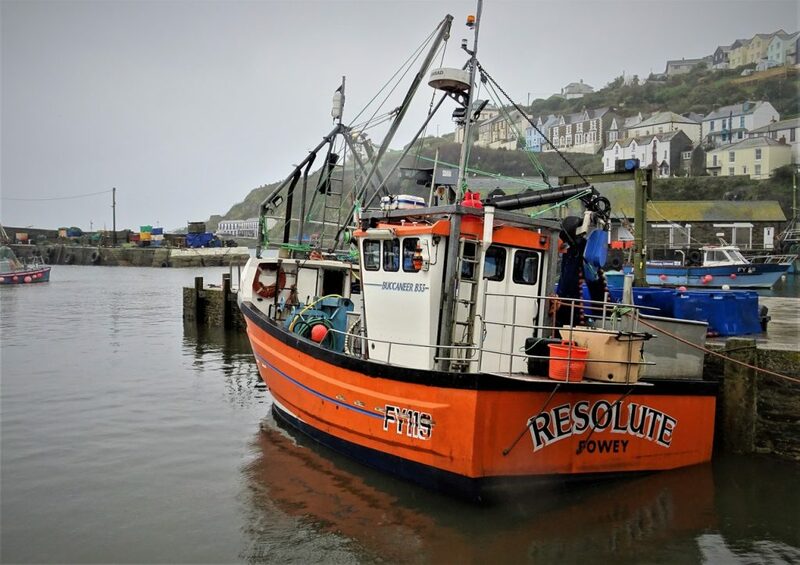 Mevagissey still has a working fishing harbour, but it was very quiet this morning. 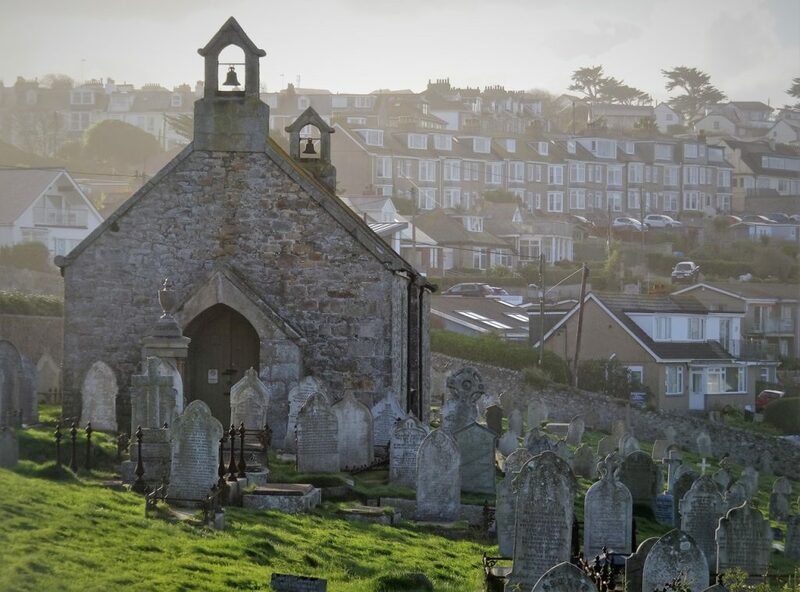 We had just driven down the crazy narrow Church Street into Gorran Haven. 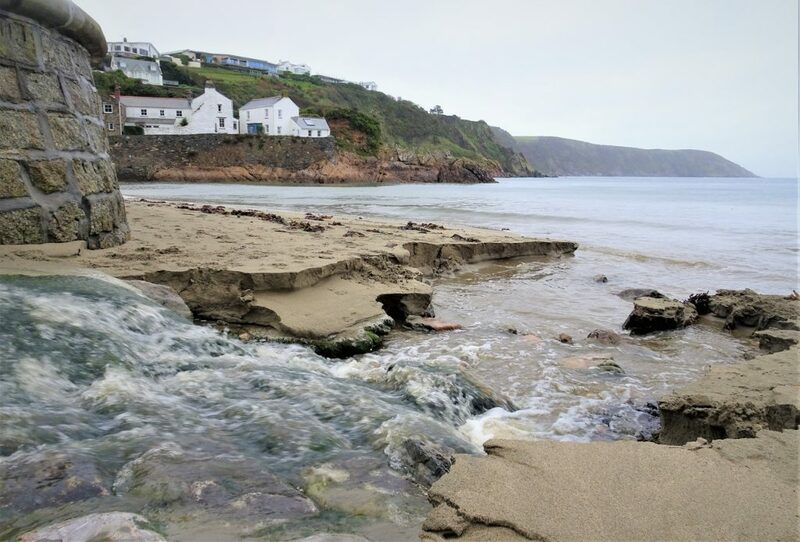 A stream tumbling down Gorran Haven Beach. 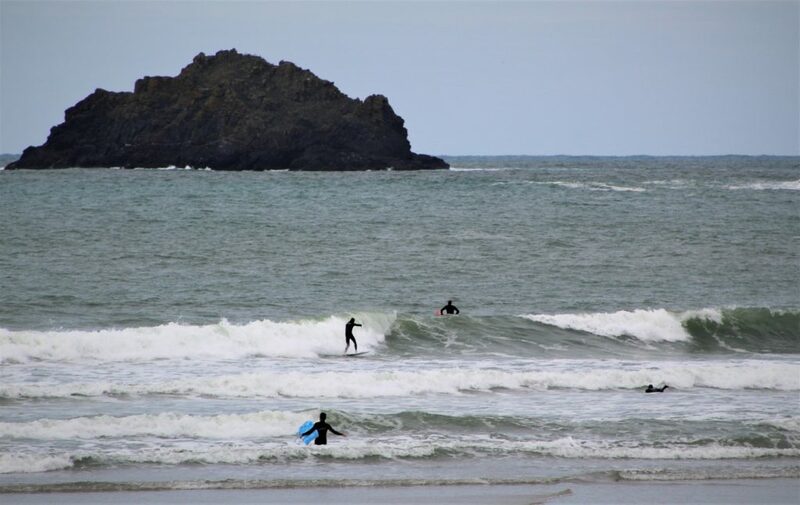 A few paddle-boarders were testing the waves at Porthluney Beach, at the foot of the Caerhays Estate. 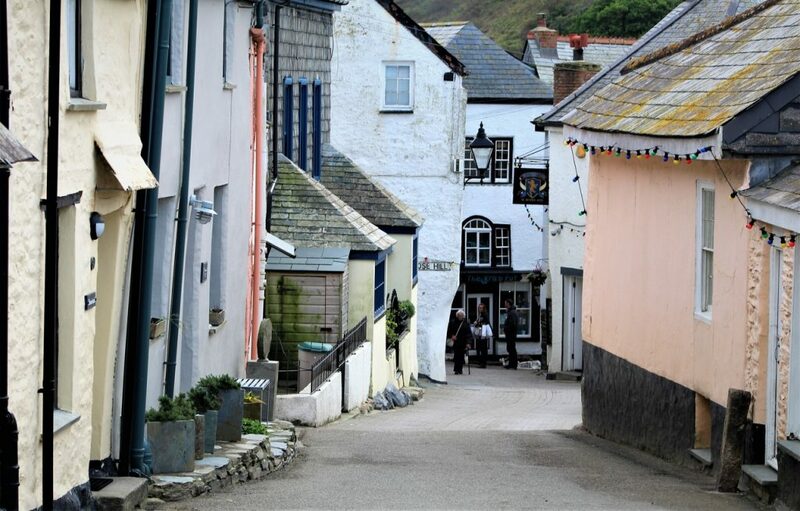 Portloe was a really cosy coastal village. It had a lovely genuine feel to it. 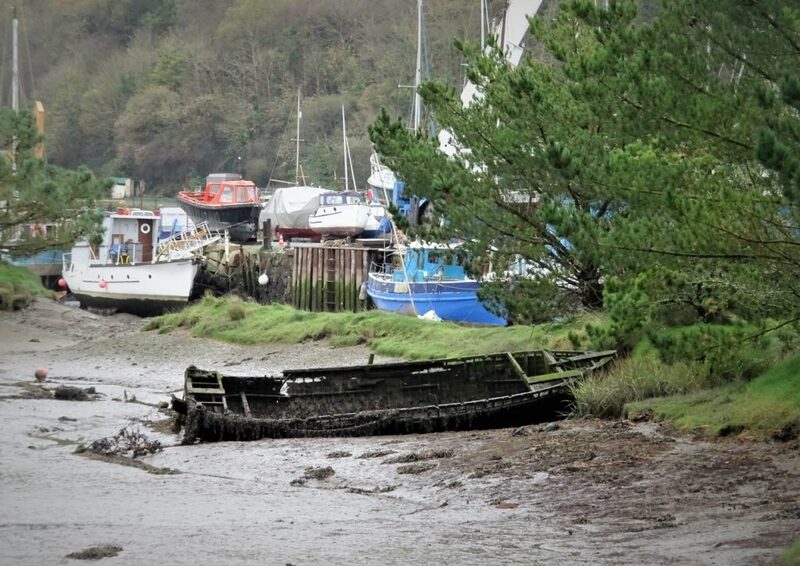 The small boat slipway nestled into the valley. 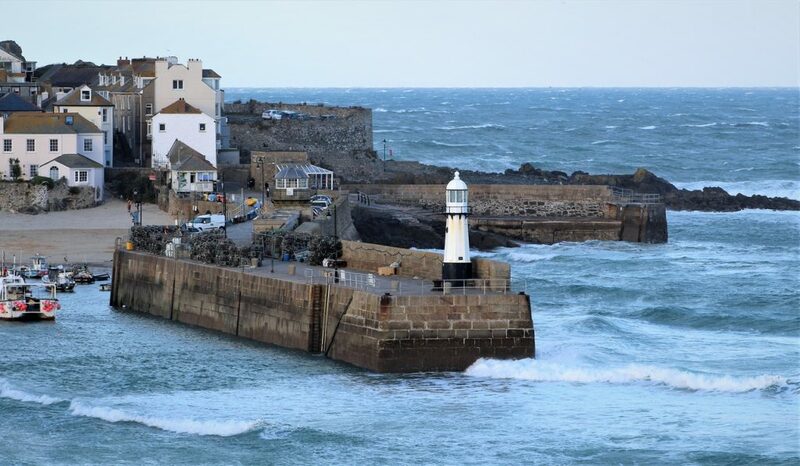 A rather rocky looking entrance to the tiny harbour. As we arrived at the National Trust Pendower Beach the heavens opened and it absolutely poured with rain. 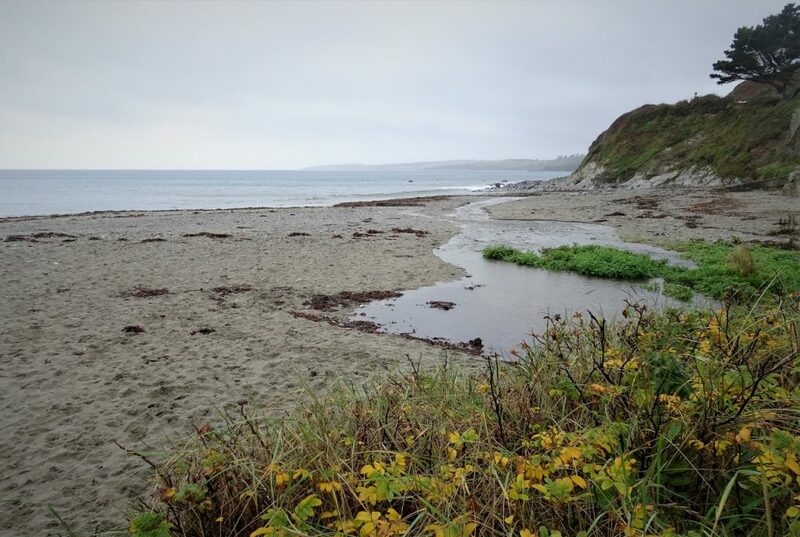 After a while we made a quick dash for the beach with our umbrellas, and through the rain manged to catch views across Gerrans Bay. 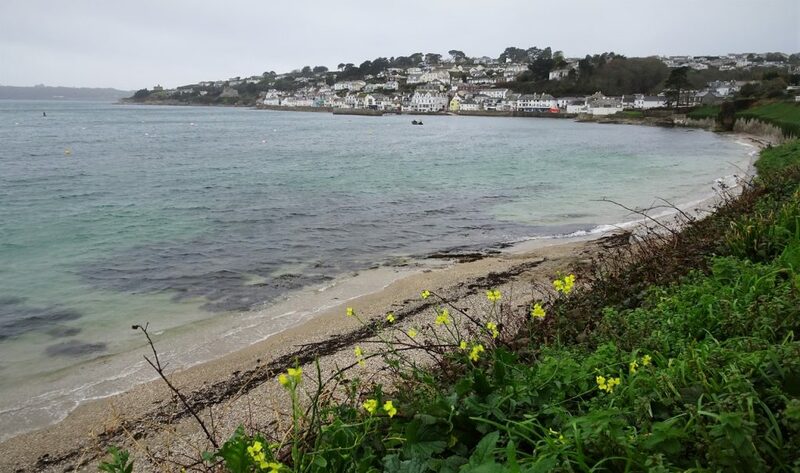 We then continued our journey down the Roseland Peninsula to St Mawes. 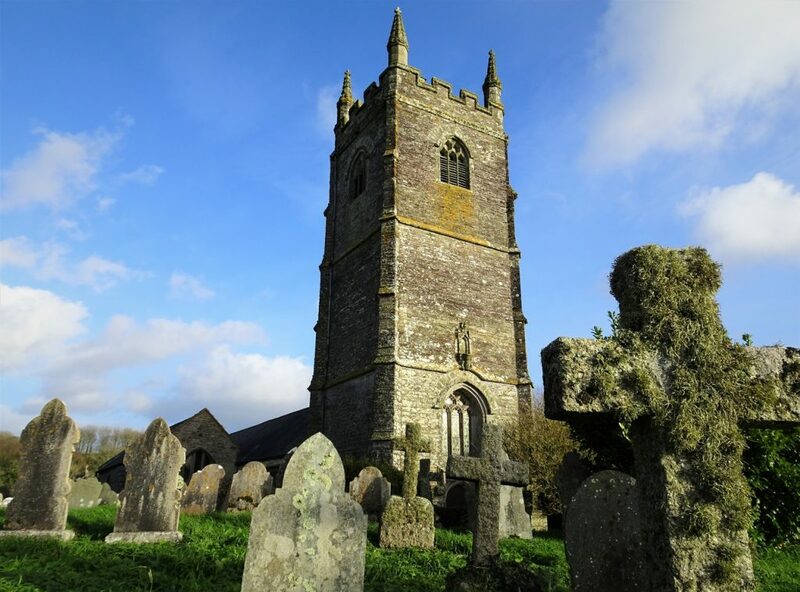 We had visited St Mawes and the castle last year with Julian’s parents, so we just made a brief stop in the small town. However, we still managed enough time to squeeze in a morning coffee and sausage roll from the famous local Curtis bakery. The passenger ferry to Falmouth in St Mawes Harbour. 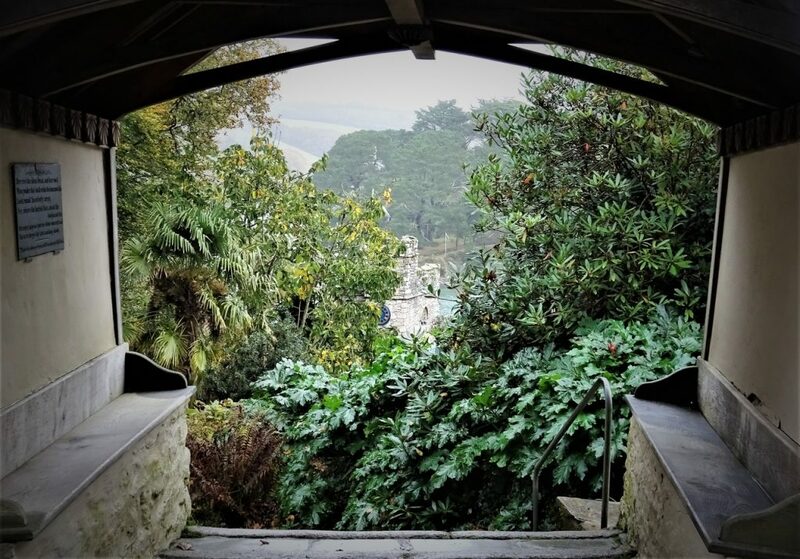 St Just’s Church tower peeping above the trees through the church lych gate. 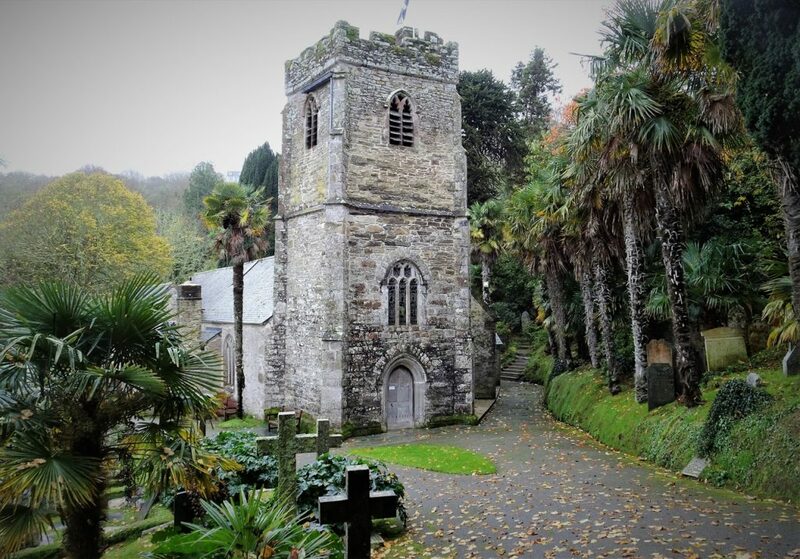 The 13th century St Just’s Church in a charming wooded valley overlooking Carrick Roads. 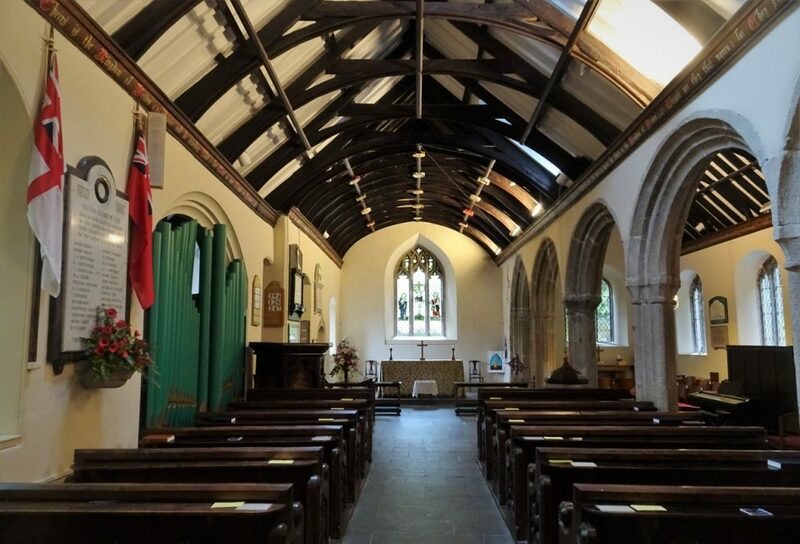 The church was quite compact inside, it felt almost chapel like. 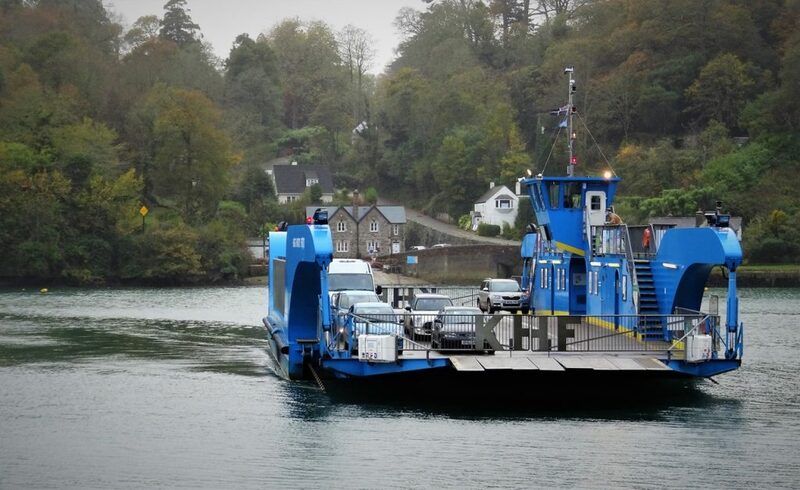 Avoiding a long trip north via Truro, we cut across the River Fal from Philleigh to Feock on the King Harry Ferry. 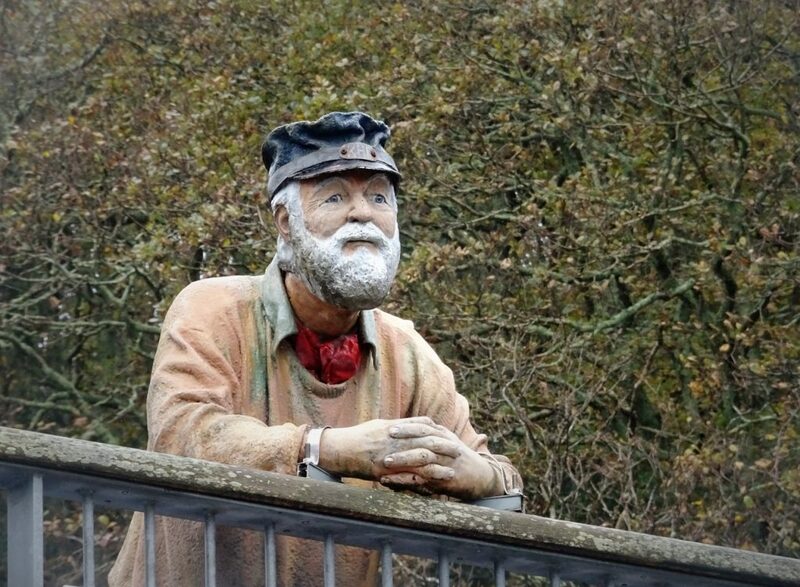 The ferry captain kept watch as we crossed the river. 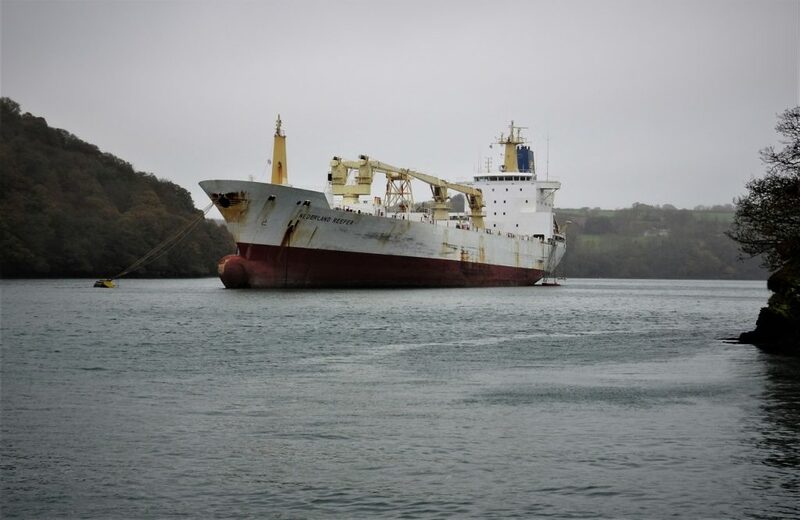 A surprisingly large Dutch ship was anchored in the River Fal. 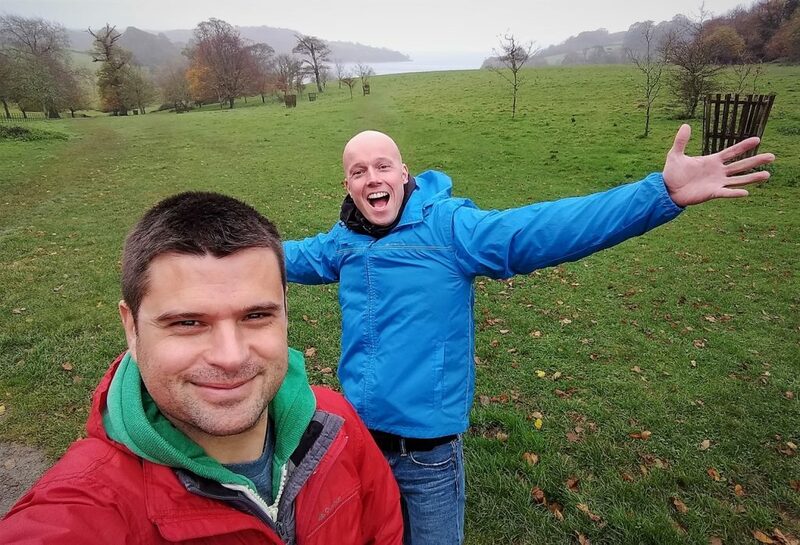 Exploring the National Trust Trelissick grounds, looking down to Channals Creek and the River Fal. Still raining! 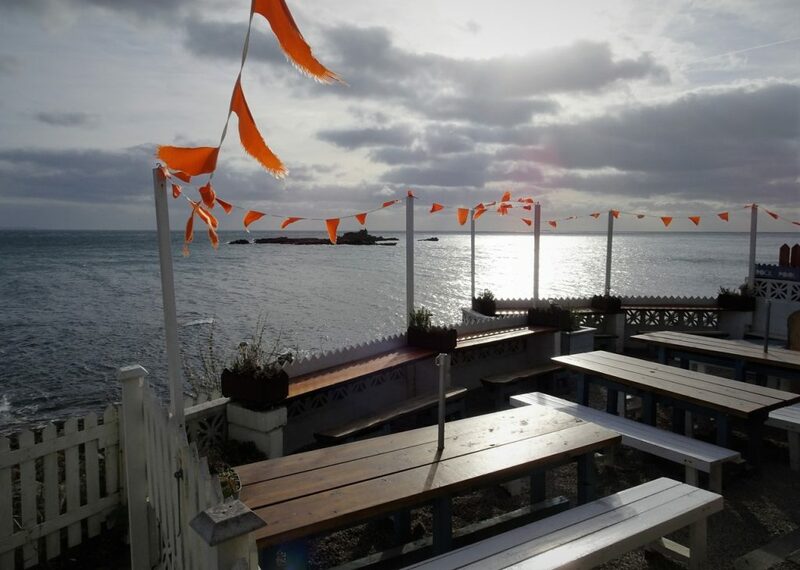 We made our next stop at Falmouth, which was much larger and busier than we had been expecting. It actually made quite a nice change from the quiet fishing villages. 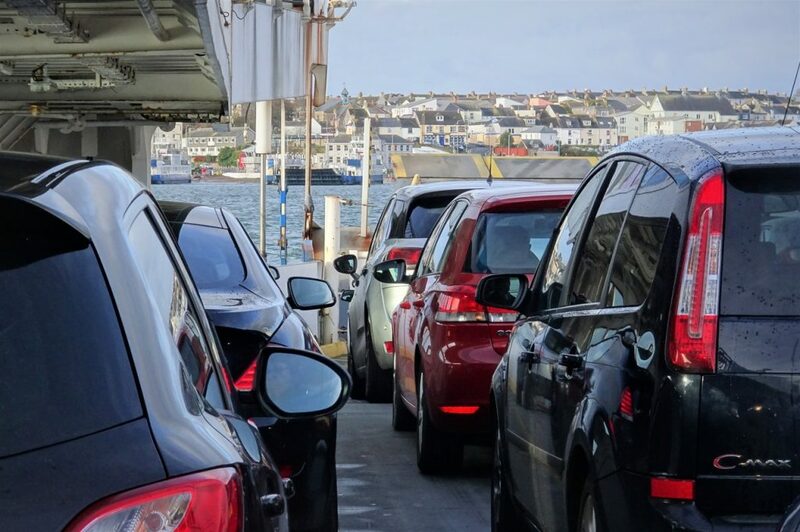 We discovered the port is the busiest in Cornwall. Yay! 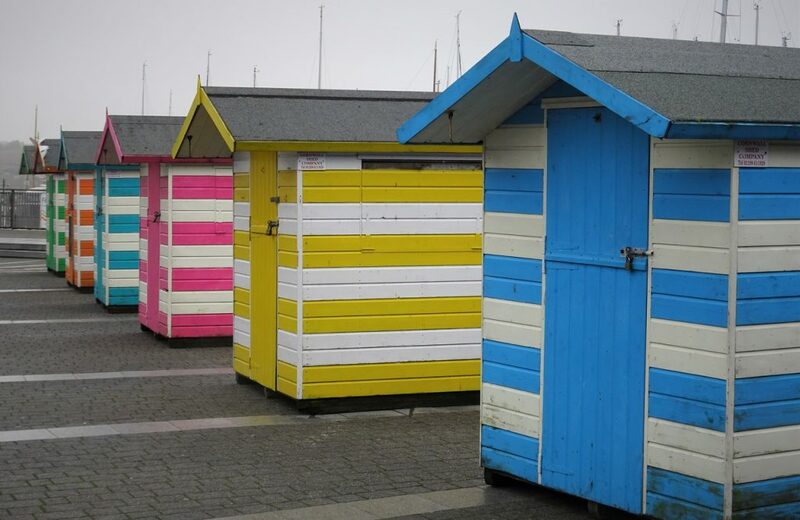 Finally we found some ‘beach huts’ in Cornwall at Falmouth’s Discovery Quay. 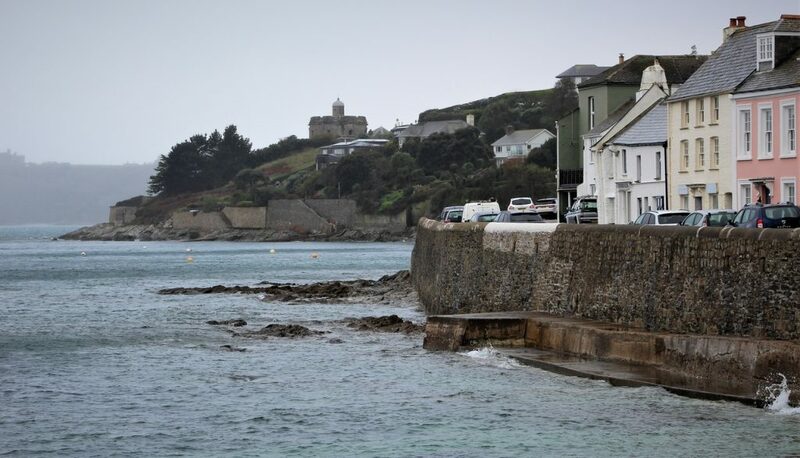 Falmouth’s Custom House Quay, with Flushing and Carrick Roads through the drizzle in the background. 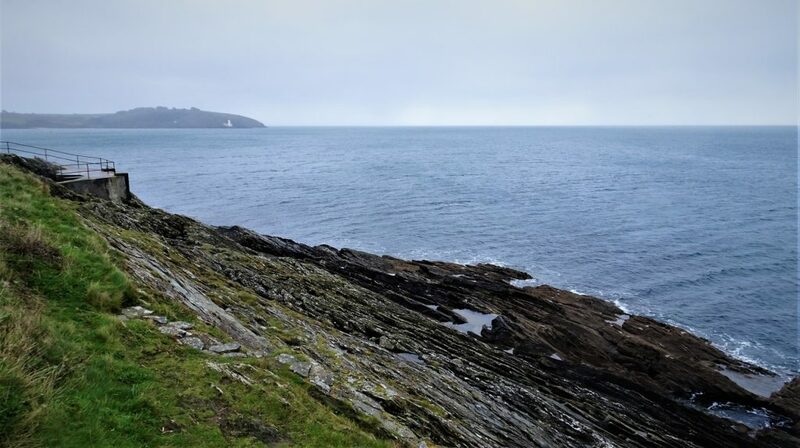 From Pendennis Head we could just about see across to St Anthony Lighthouse south of St Mawes. Gyllyngvase Beach just south of Falmouth, overlooking Falmouth Bay. 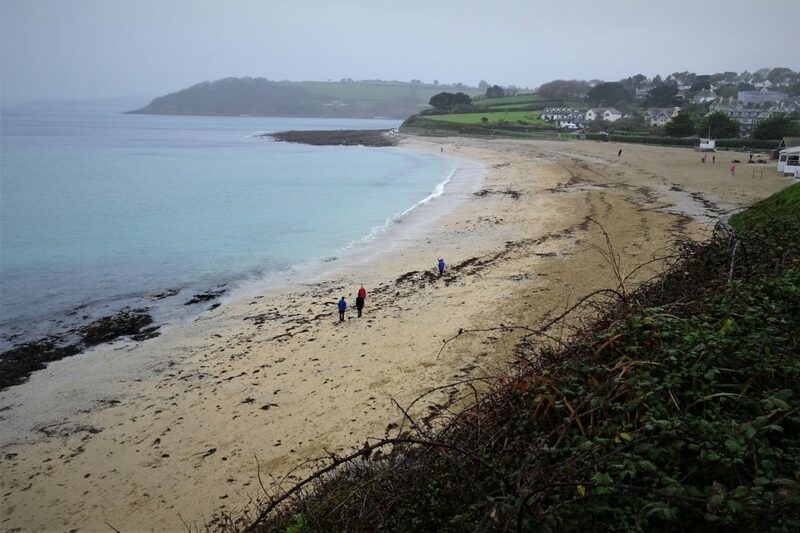 As we continued our journey south to the Lizard peninsula we crossed over the Helford River at Gweek. 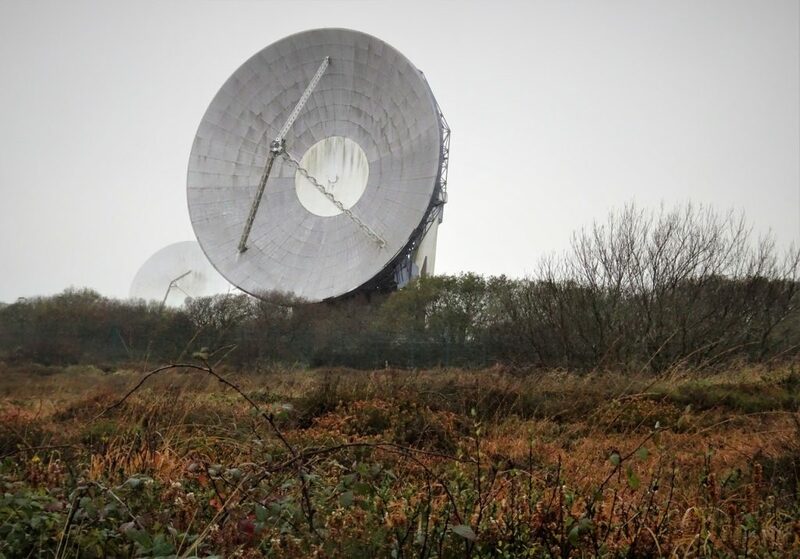 The satellite dishes at Goonhilly Earth Station suddenly appeared on the horizon, so we made a quick stop at the nearby Goonhilly Downs National Nature Reserve to take a closer look. 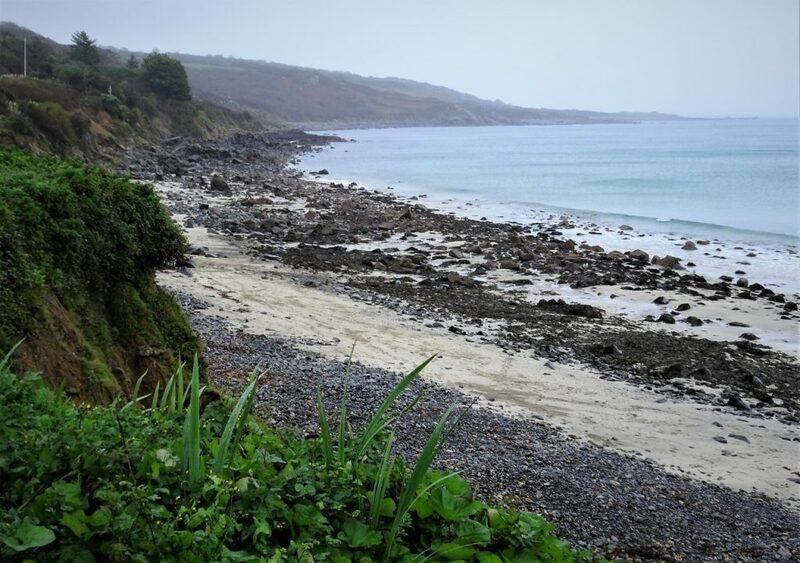 Coverack Beach and Cove with views over to Lowland Point. The small village was still recovering from a flash flood that had damaged property and the sea wall earlier in the year. 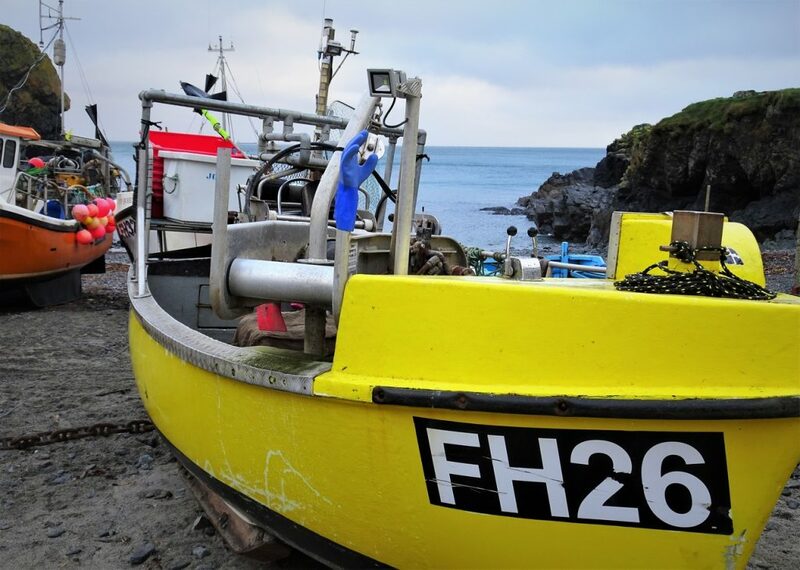 A sunshine yellow fishing boat adding a bit of colour to this grey day. 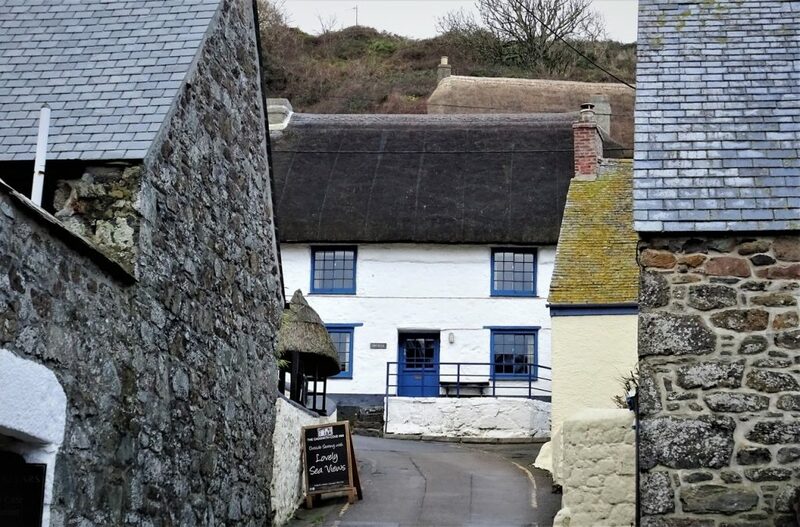 Cadgwith Cove felt like another cozy and authentic Cornish village. 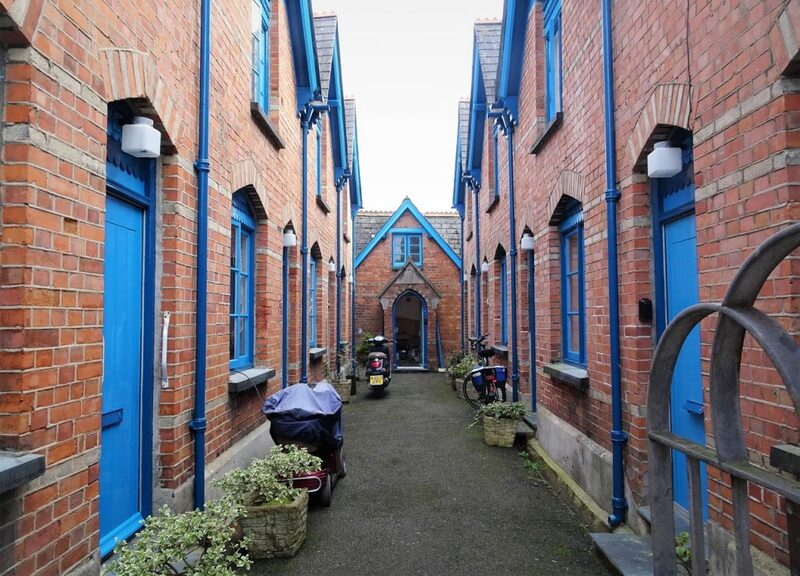 Cottages nestled around the narrow streets. 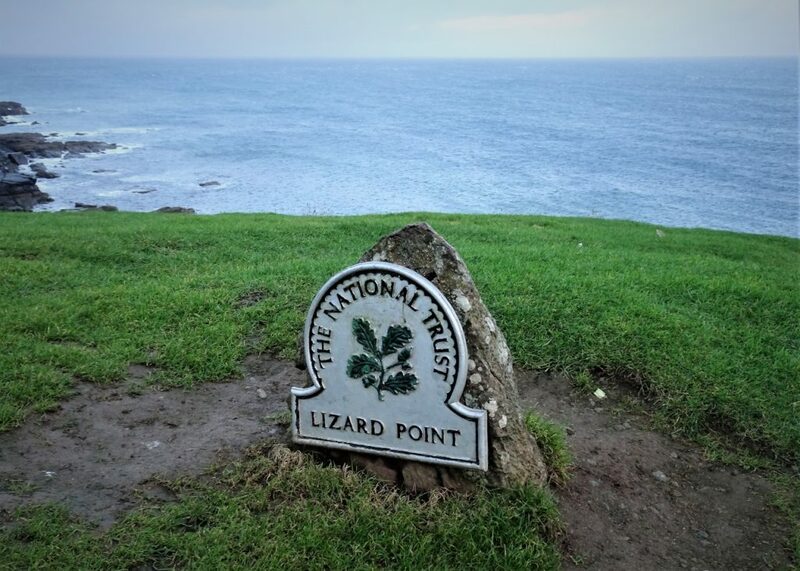 Finally we made it to The Lizard. 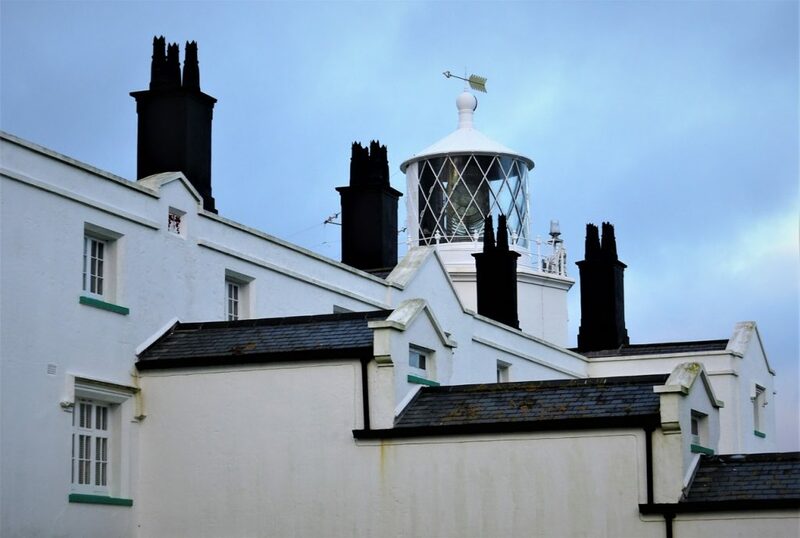 The Lizard Lighthouse, dating back to 1752, sitting above the lighthouse keeper cottages. 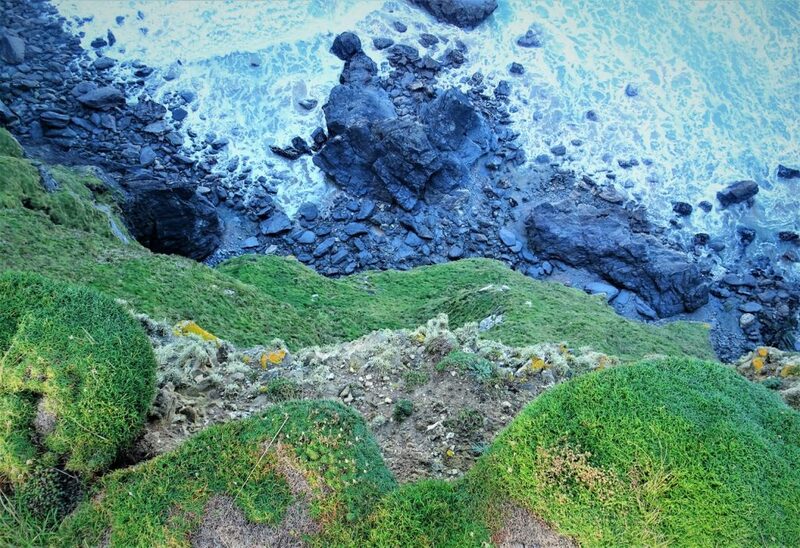 Lizard Point, the most southerly point of mainland Britain. 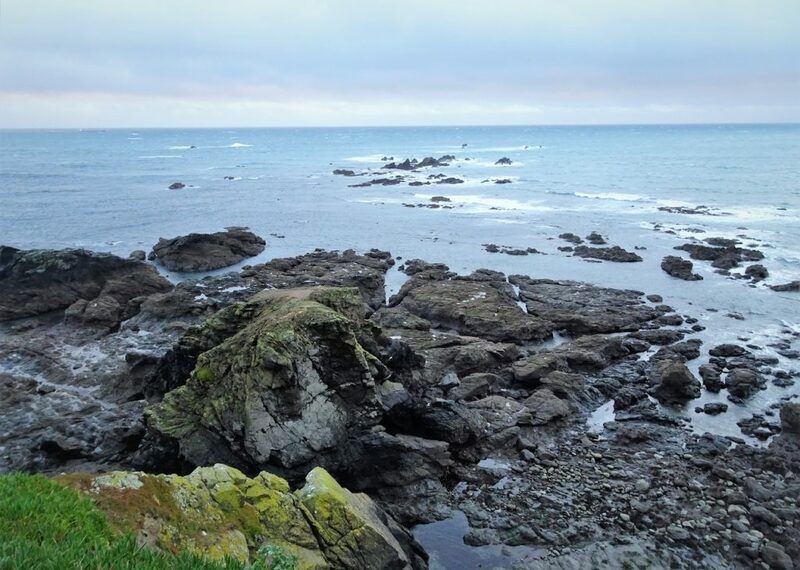 On day 17 of our coastal road trip we visited the most westerly point of mainland Britain at Ardnamurchan. 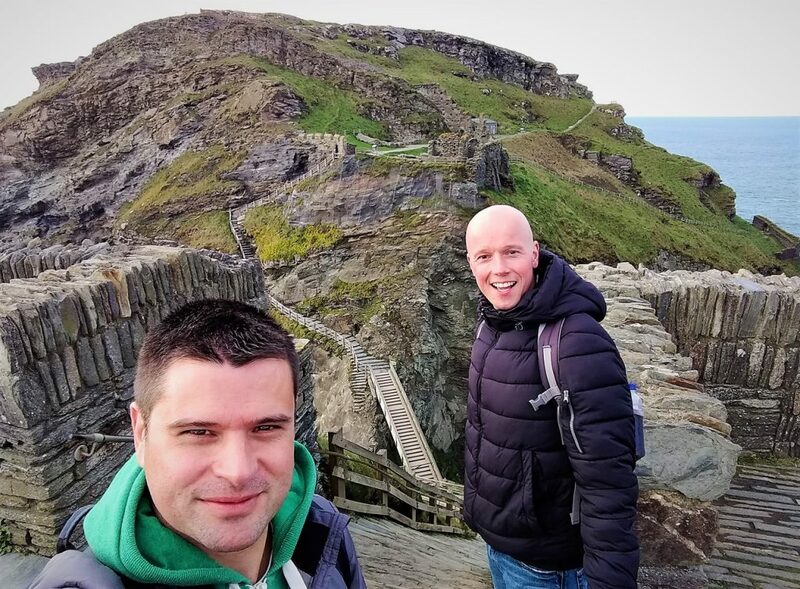 On day 24 we visited the most northerly point at Dunnet Head. 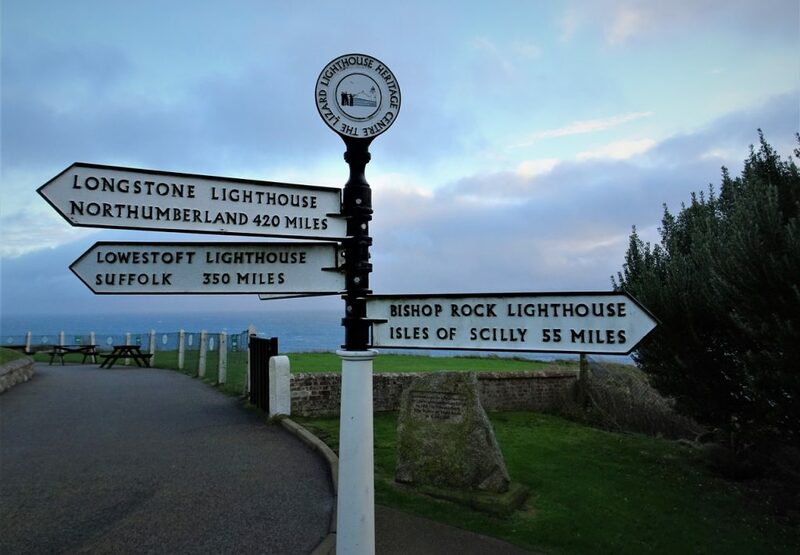 On day 35 we reached the most easterly point at Ness Point. 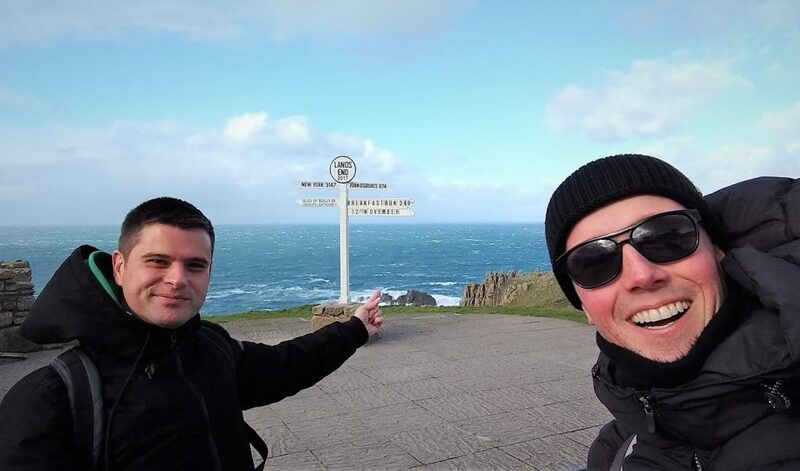 Then today (day 45) we finally reached the most southerly point at Lizard Point! And it was so quiet, just us and another couple. 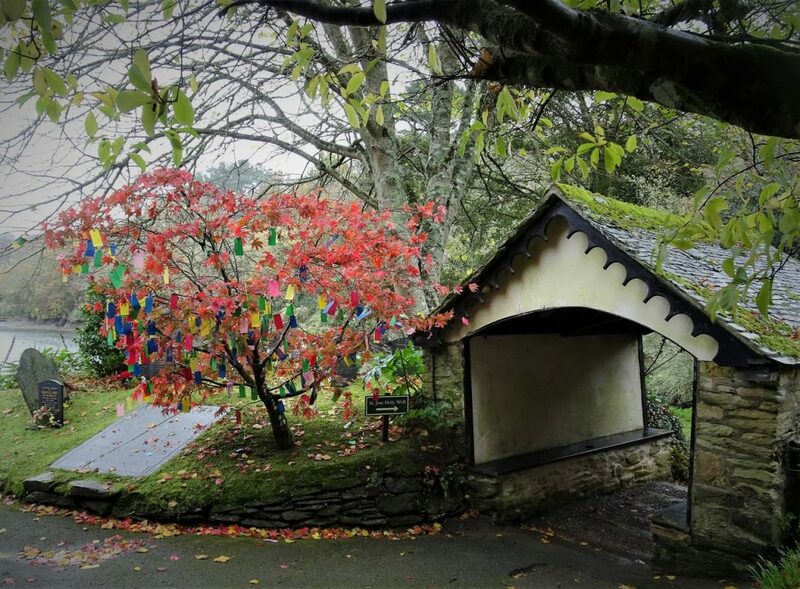 Hint, to miss the crowds visit on a cold rainy late Saturday afternoon in November! So that was our final stop of the day before we drove back up the western side of the Lizard peninsula to Helston for the night. 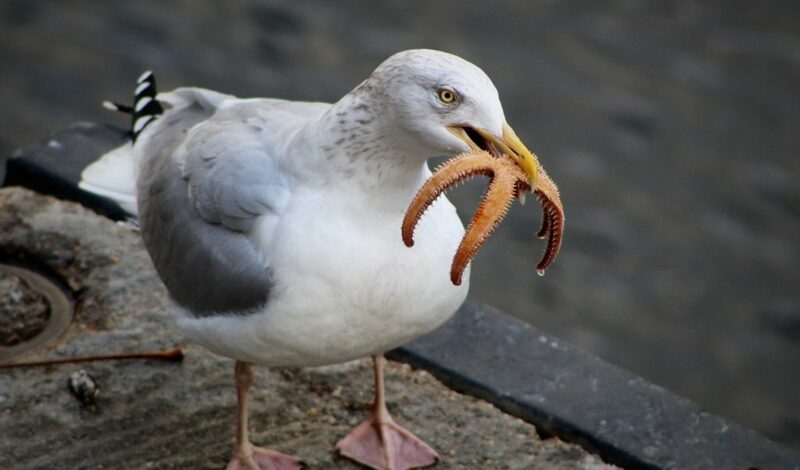 A hungry seagull (aren’t they always?) at Polperro. 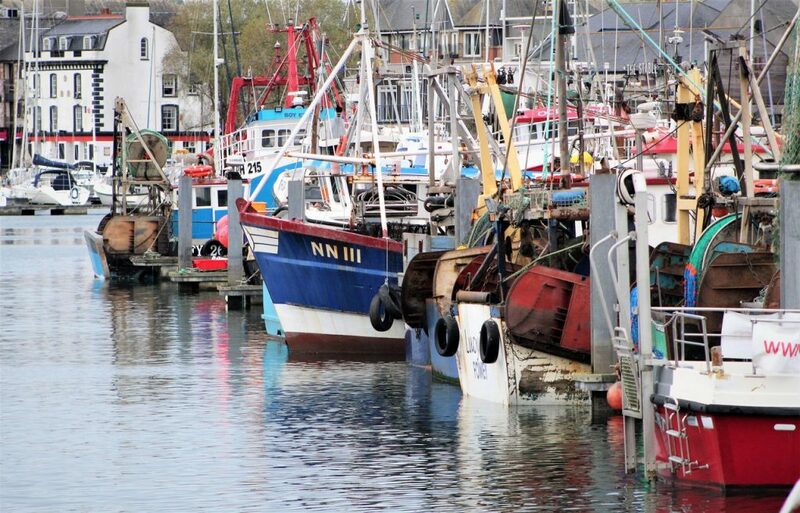 Fishing boats being prepared for the day at Plymouth’s Sutton Harbour. Smeaton’s Tower and the Royal Citadel along Plymouth Hoe. 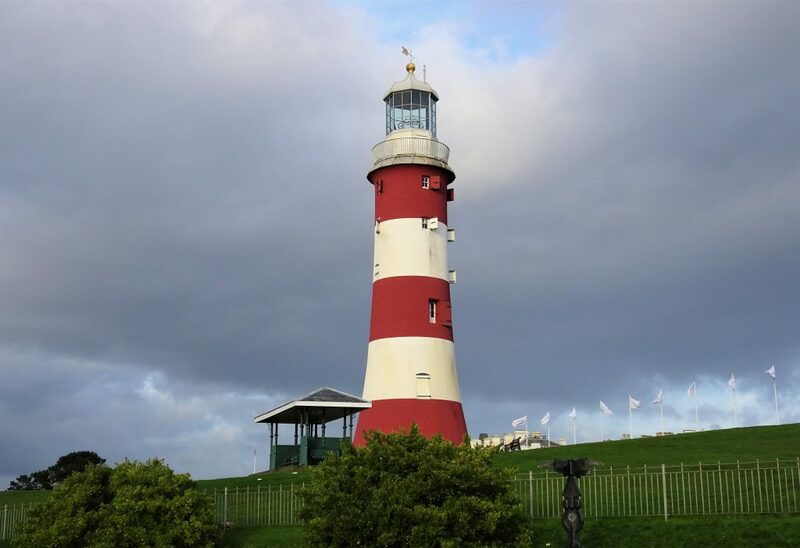 Smeaton’s Tower was originally built as the lighthouse at Eddystone Rock off Rame Head (we will visit later today). 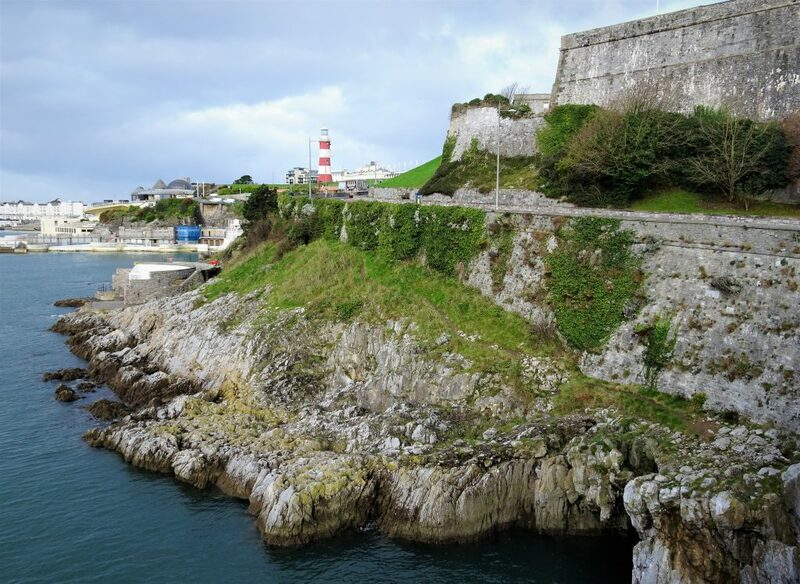 It was then moved to Plymouth Hoe as a memorial to John Smeaton, its engineer. 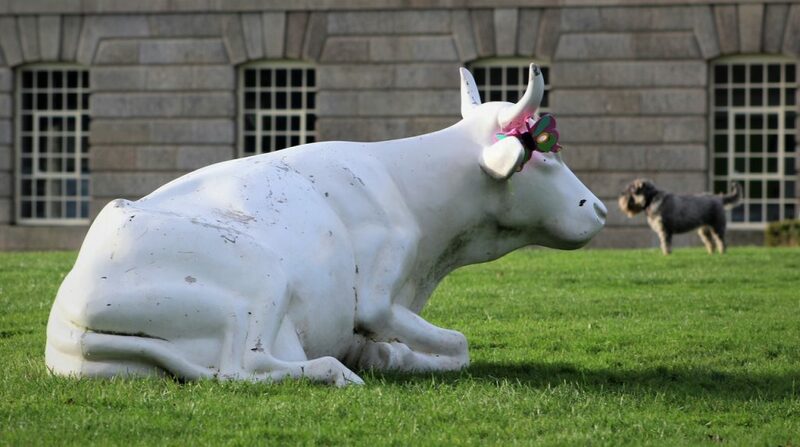 We were really impressed by Plymouth’s Royal William Yard. 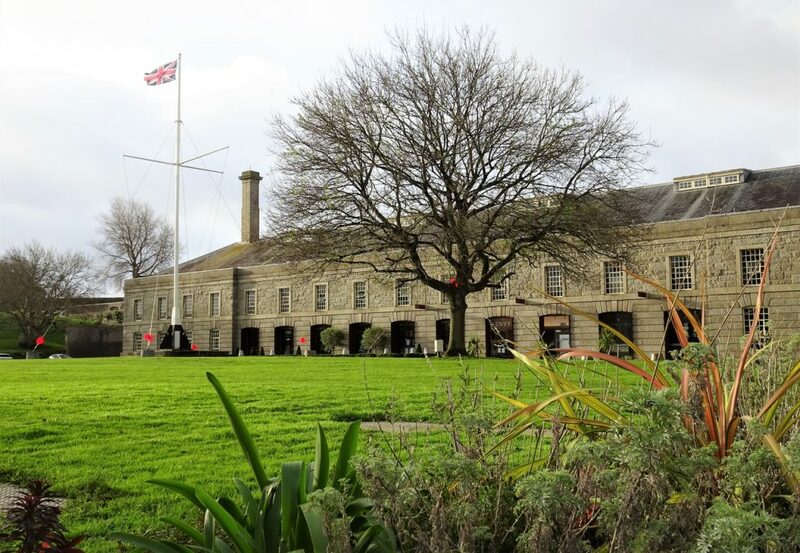 Originally built for the Royal Navy but now redeveloped with shops, restaurants, offices and a harbour. Very nicely done. Sculptures on the lawn in front of the New Cooperage. 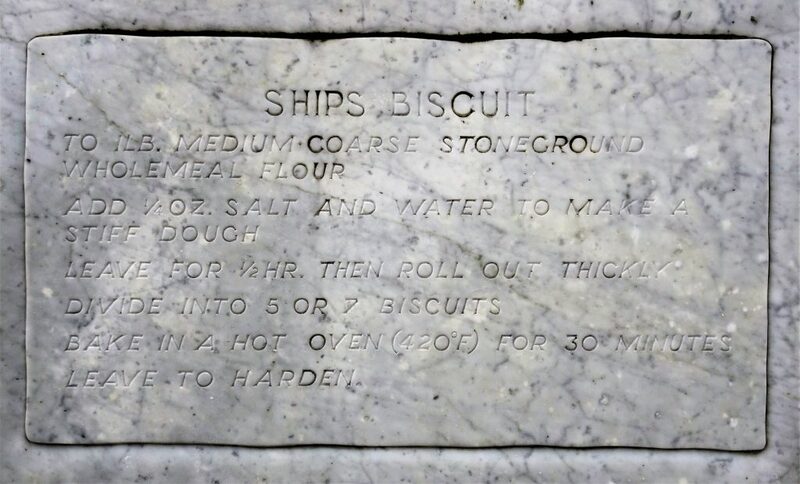 A recipe for Ships Biscuit curiously carved into a stone at the entrance to the Royal William Yard. 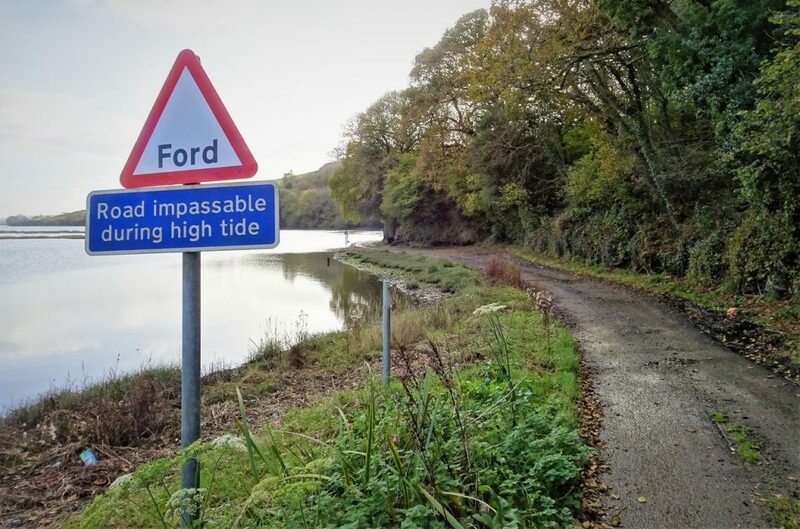 More watery roads along the Cornish coast. 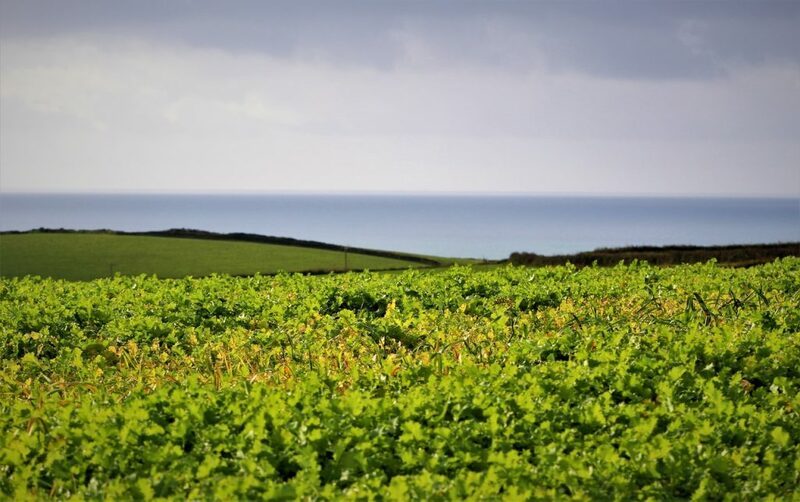 Bright green fields above St John, looking down towards Whitsand Bay. 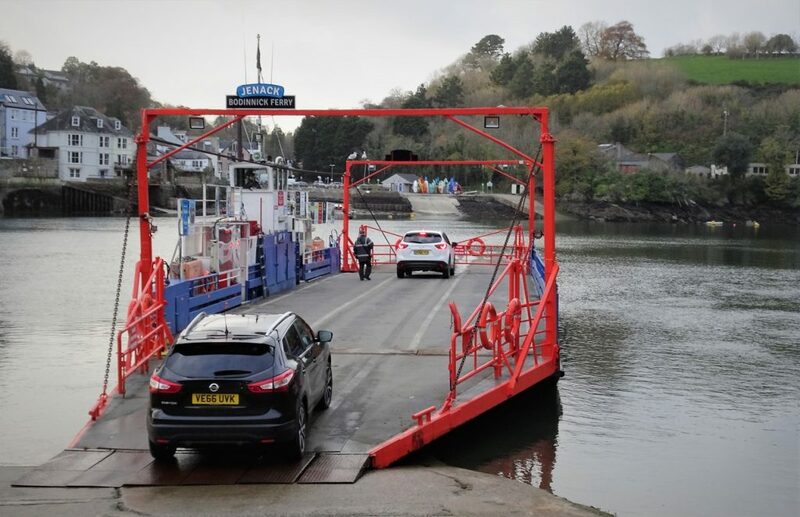 Although we entered Cornwall by ferry at Tor Point, there was also a passenger ferry landing at Cremyll. 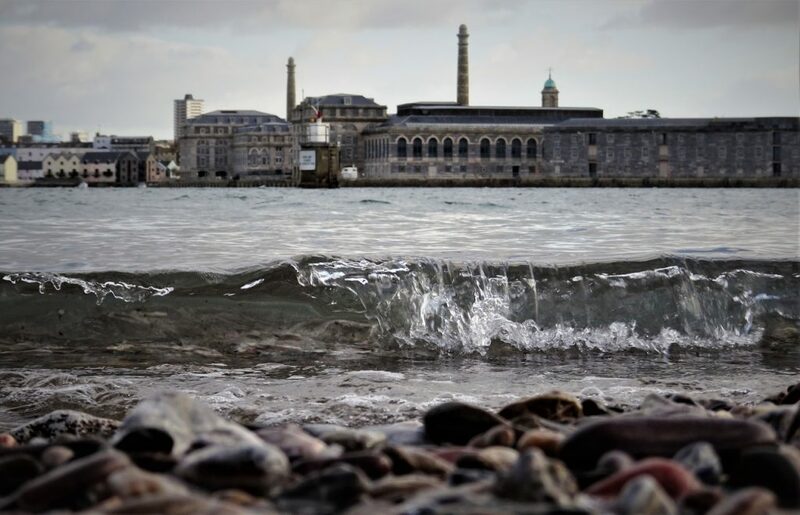 Looking back across the River Tamar to the Royal William Yard. 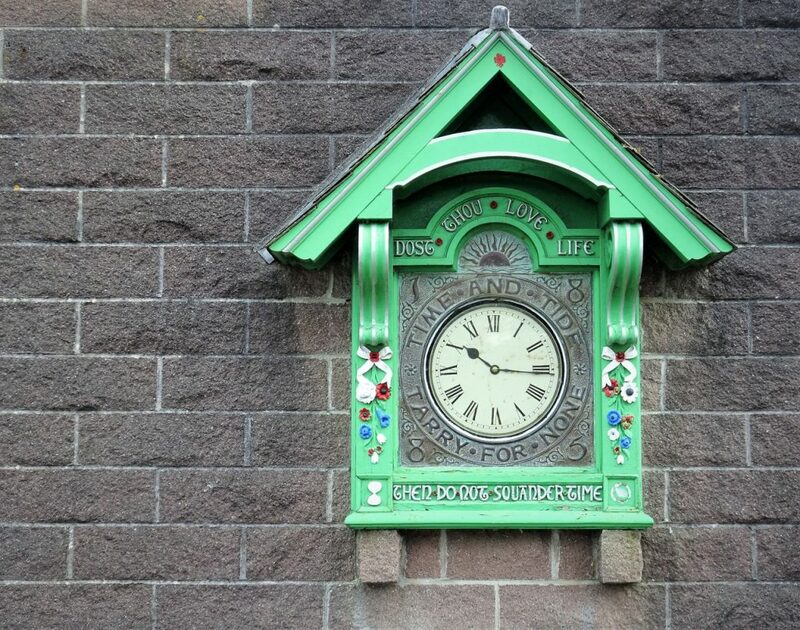 The clock at Cremyll’s ferry landing. 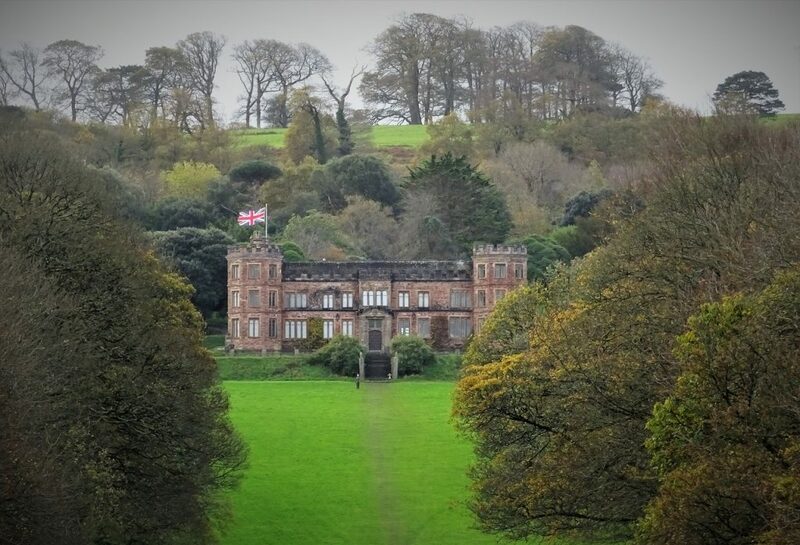 The grand Mount Edgcumbe House overlooking Cremyll and the River Tamar. 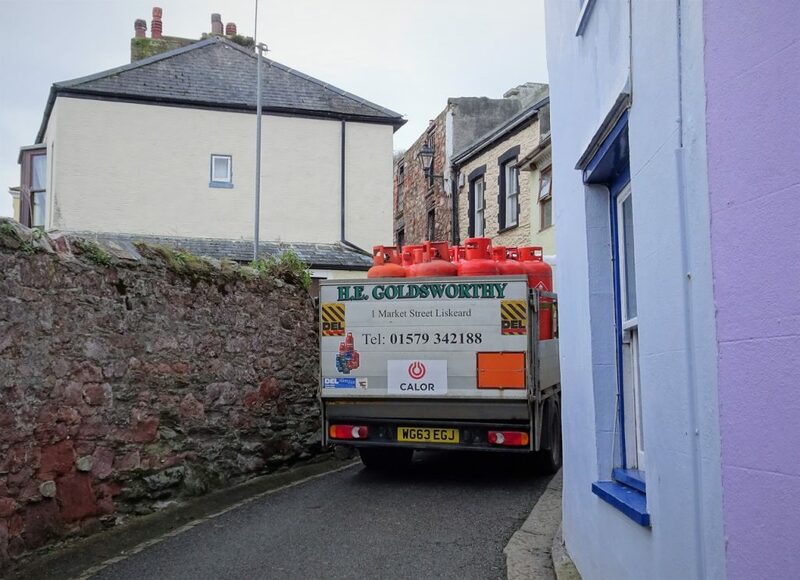 Driving through Kingsand to Cawsand we got stuck behind a delivery truck. With no way to pass, you just have to be patient. 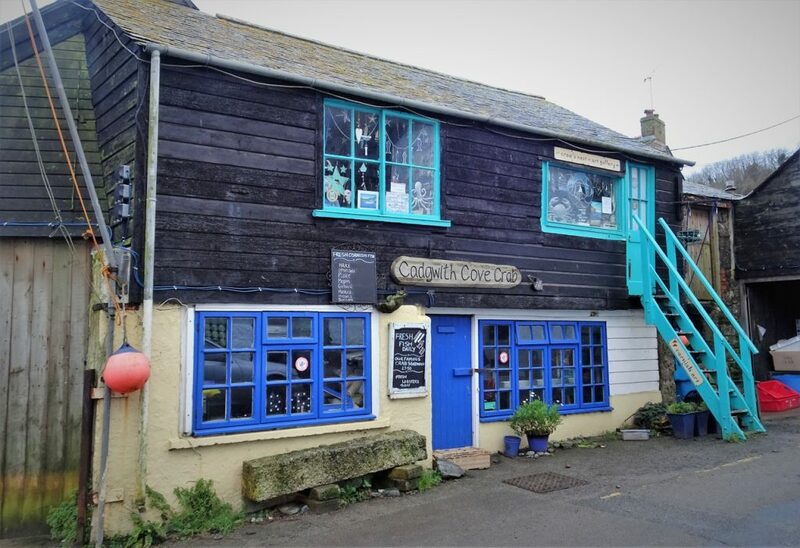 We used the opportunity to nosey in the windows of the cute coastal cottages. 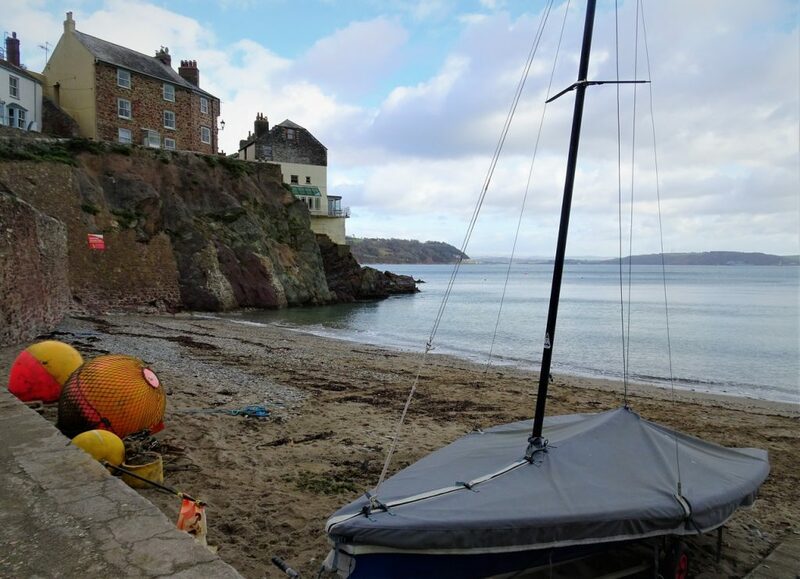 Cawsand Beach and Bay. Just out of the picture there was a couple preparing for a morning swim around the bay. Rather them than us. 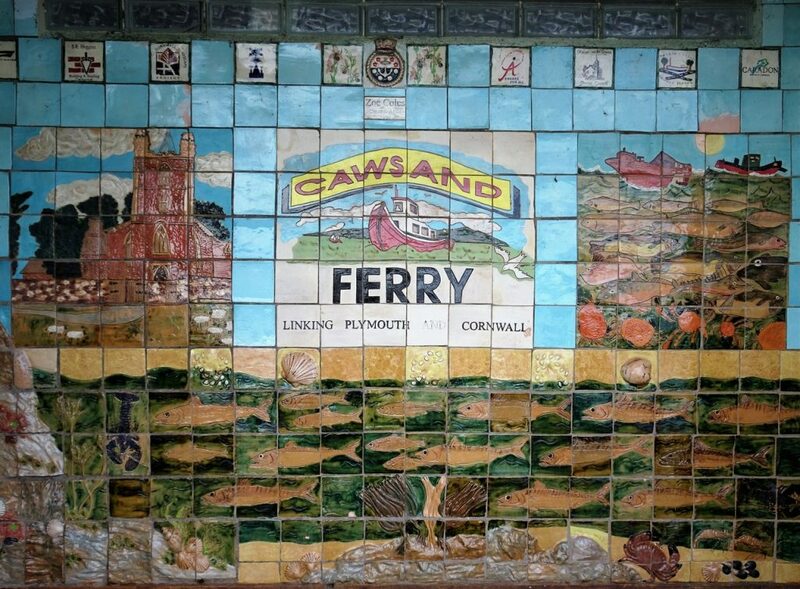 Painted tiles decorating the waiting shelter of the seasonal Cawsand Ferry. 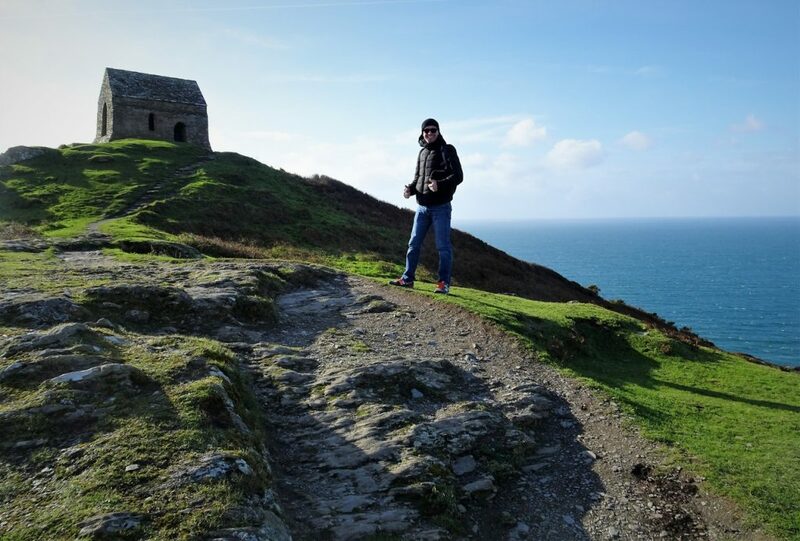 The clouds started to clear as we arrived at Rame Head, so we had a little hike up to St Michael’s Chapel on the headland. 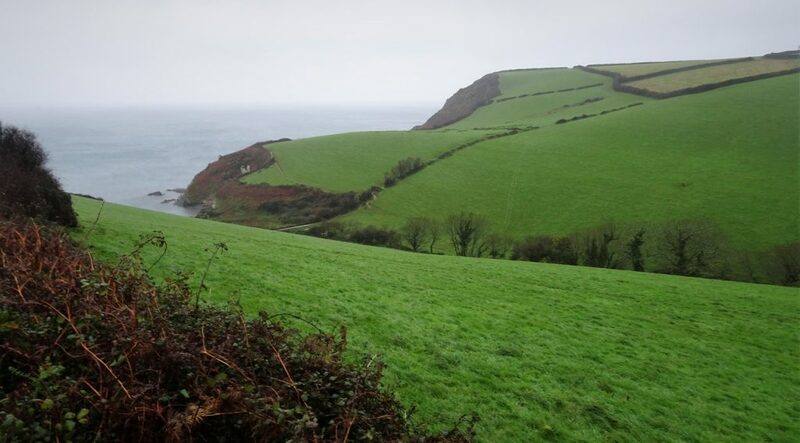 There were amazing panoramic views along the coast, looking as far east as the Great Mew Stone in Wembury Bay. Looking back down the headland to the National Coastwatch Institution buliding by the car park. 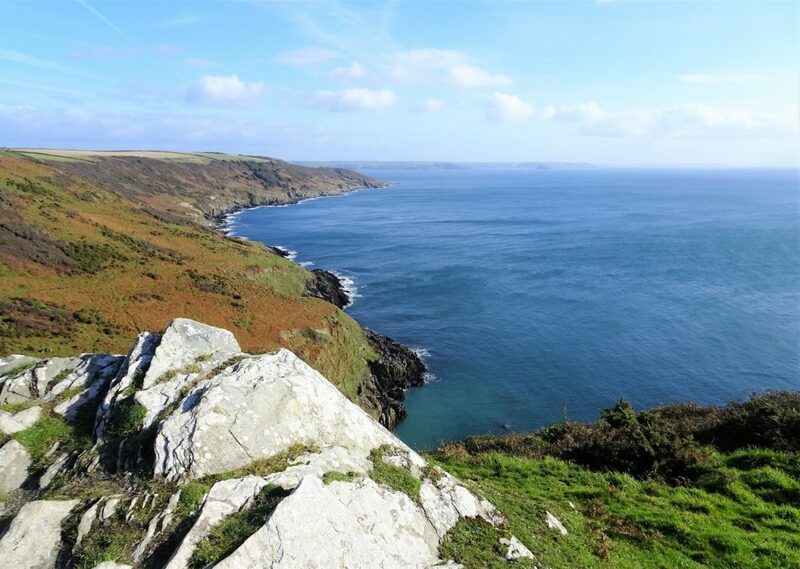 Whitsand Bay and Tregantle Fort above the cliffs to the northwest. 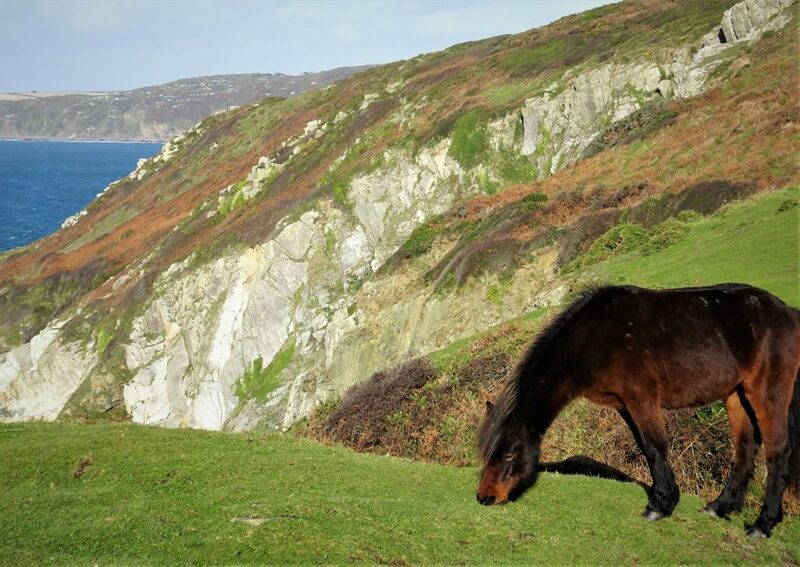 There were plenty of Dartmoor ponies precariously grazing around the headland cliffs. Choppy waters at the foot of the cliffs. 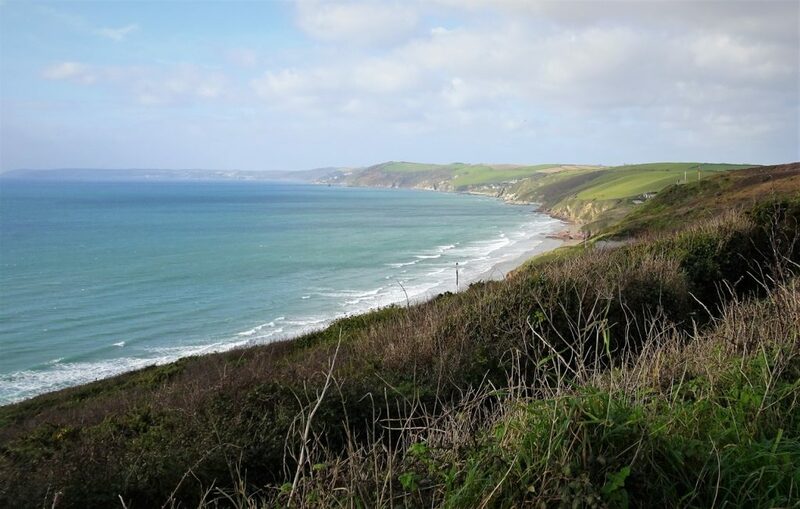 We then continued along the coastal road past Treninnow Cliff and Freathy. 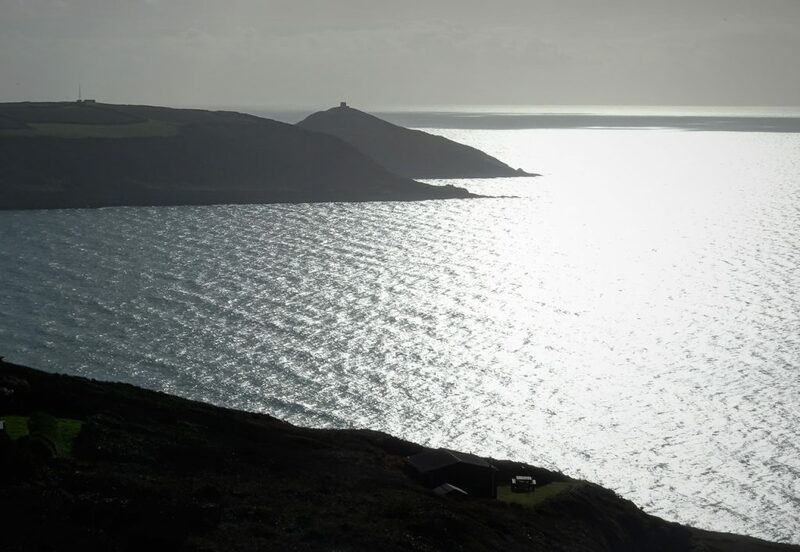 Rame Head silhouetted against the bright sunlight across Whitsand Bay. 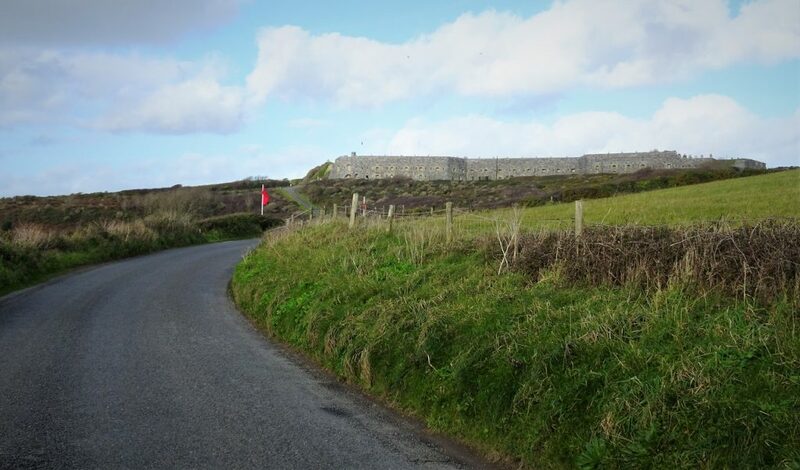 The 1865 Tregantle Fort along Military Road. Still open and working. As we drove past we could see training in progress. 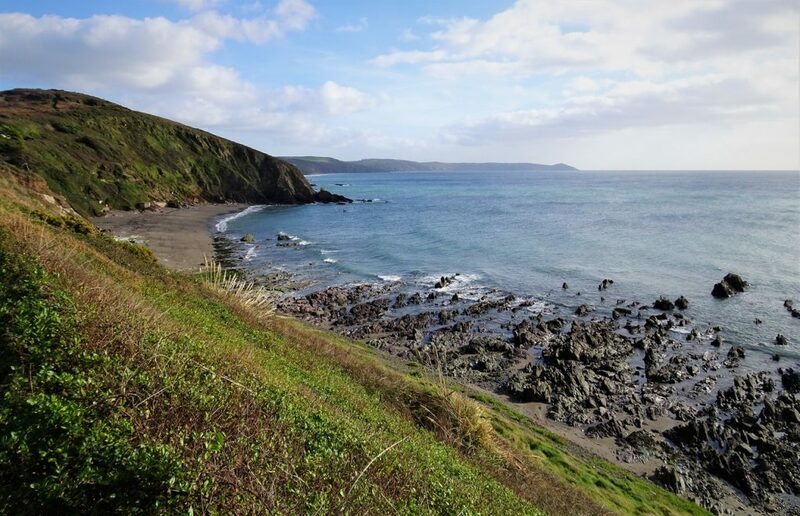 Portwrinkle Beach with Rame Head still visible in the distance. 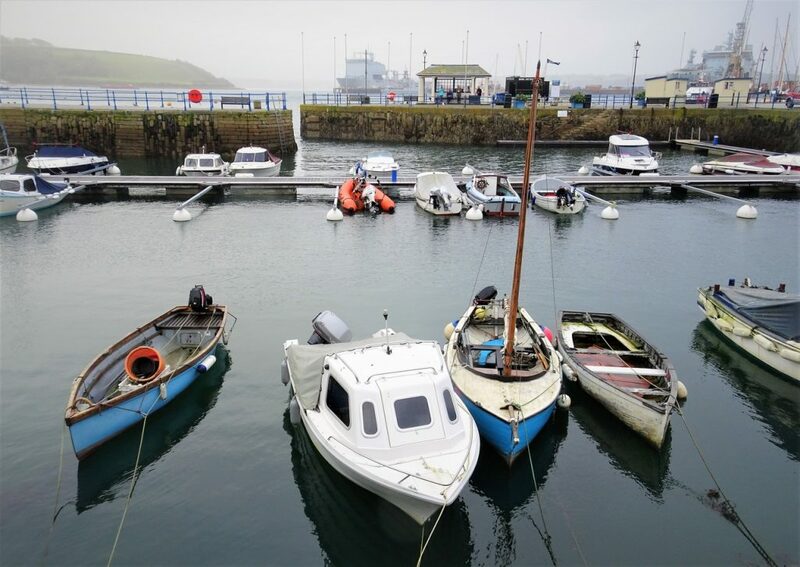 Small boats neatly stored on end by the water’s edge at Portwrinkle. Driving through a patchwork of fields along the B3247 to Downderry. 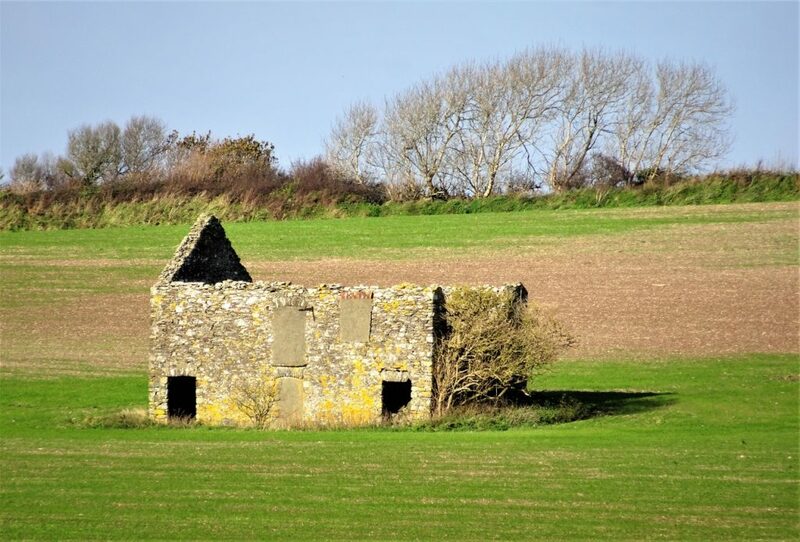 All along this coastal journey we’ve passed so many abandoned farm houses and barns… so they haven’t all been converted yet! 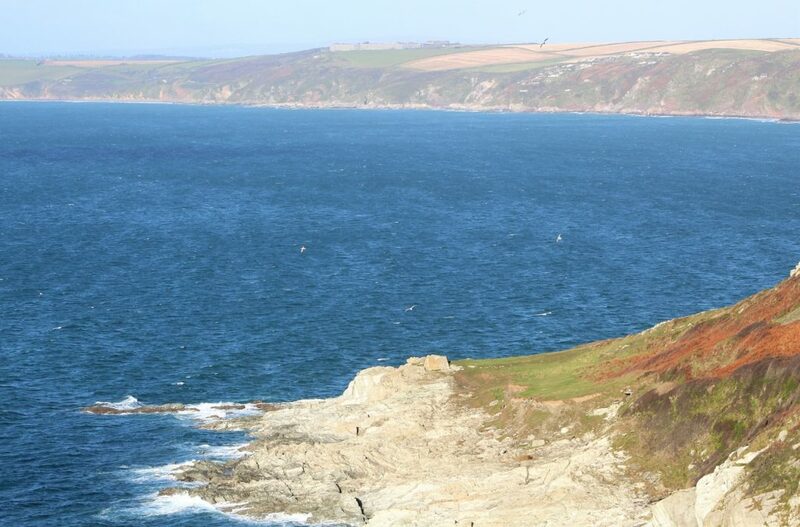 Amazingly Rame Head and St Michael’s Chapel were still visible in the distance from Seaton Beach. We stopped at bustling East Looe for our first Cornish pasty. 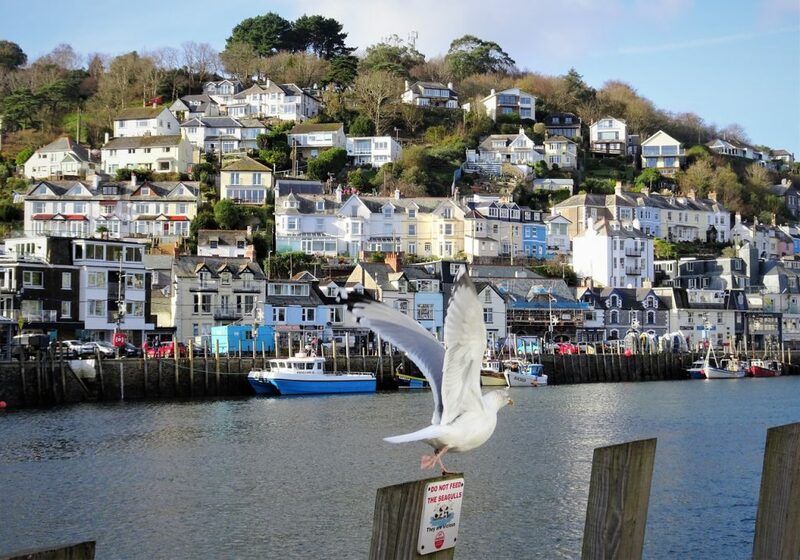 As we looked across the East Looe River to West Looe, the seagulls were keeping a beady eye on us (or rather our pasties). 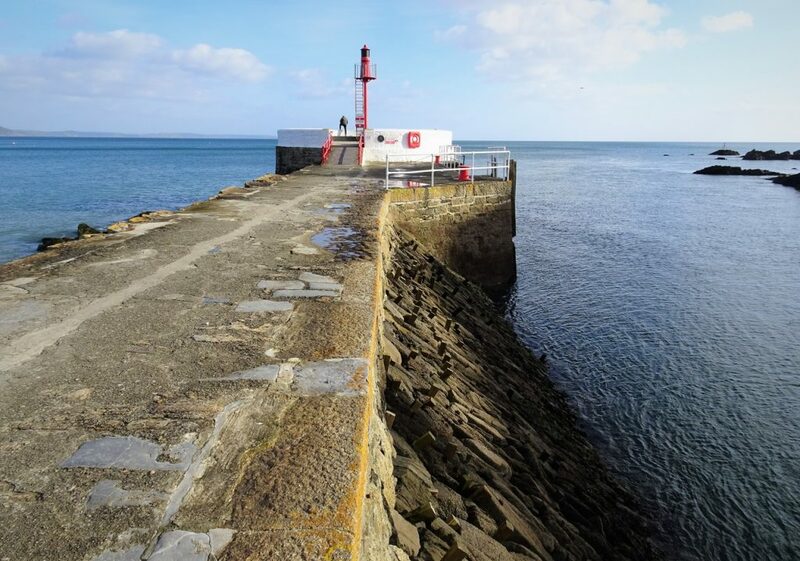 Looking down the breakwater to the calm sea in Looe Bay. 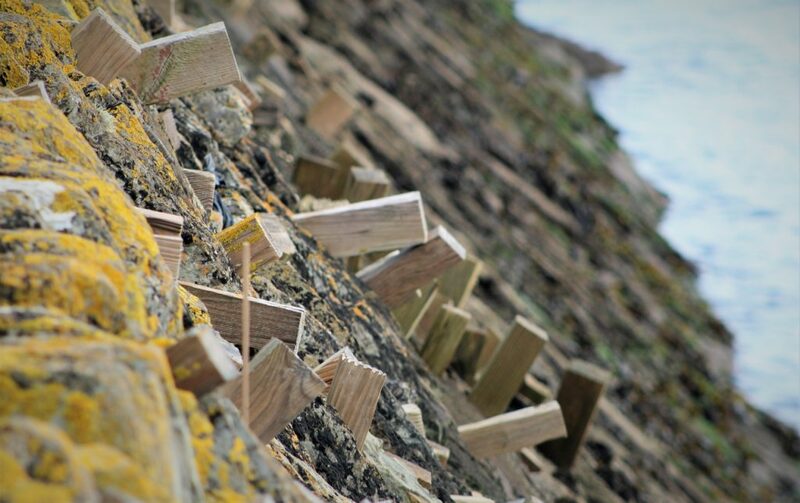 The breakwater walls were full of wooden wedges. Very curious. Maybe to help hold the wall together? 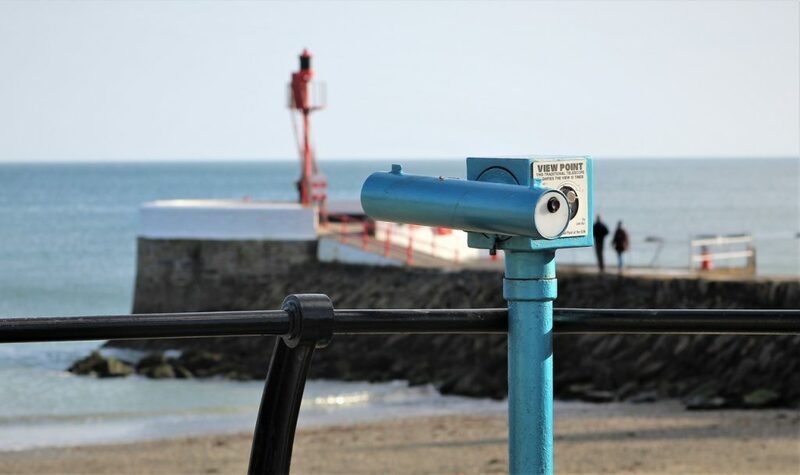 A telescope by the sandy East Looe Beach. 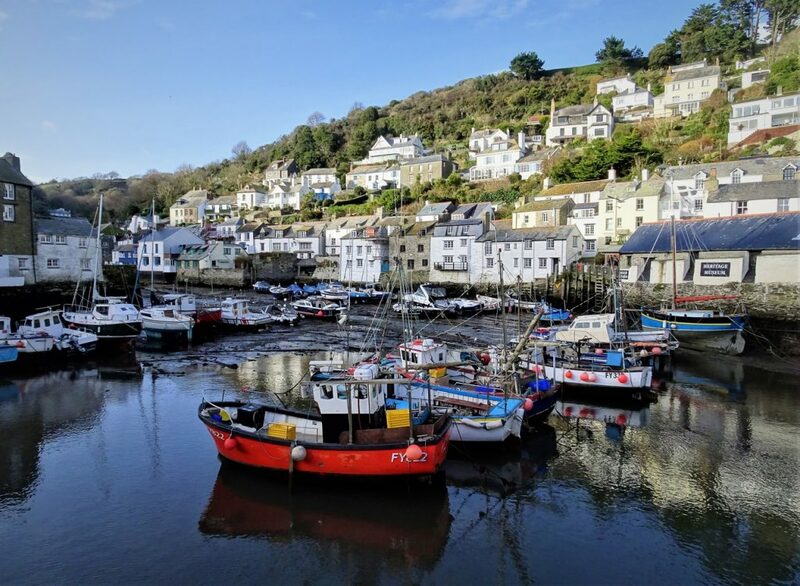 Our next stop was at Polperro. The village was admittedly very quaint, but felt very surreal, like a ghost town. 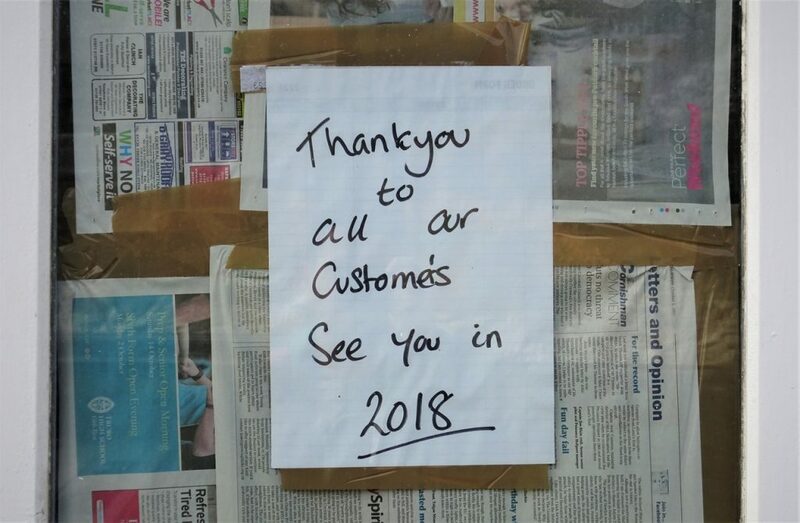 Most of the shops and cafes were closed and there was hardly anyone around, unlike our previous stop at Looe. Clearly a tourist village now, which is a real shame as out-of-season there seemed to be no locals to keep the place alive, so it somehow lacked soul. We also had to pay the highest parking charge of our entire British coastal road trip here too! Maybe that’s why it was so quiet. We only stayed 45 minutes but had to pay £4.50 to park, which was the minimum charge (3 hours). At least the seagulls seemed happy with the range of seafood. 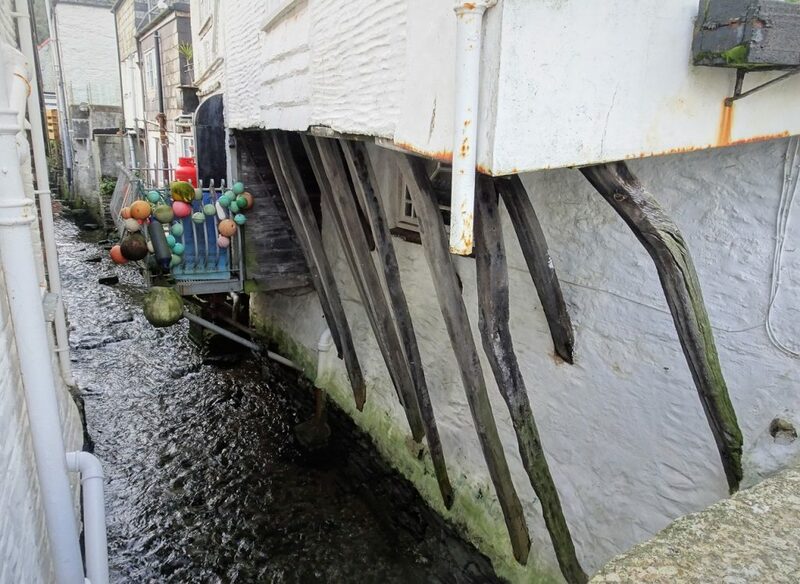 The locally famous ‘House on the Props’, precariously hanging over the stream. Winding our way through more narrow country lanes we passed the small hamlet of Lansallos, and Saint Ildierna Church. 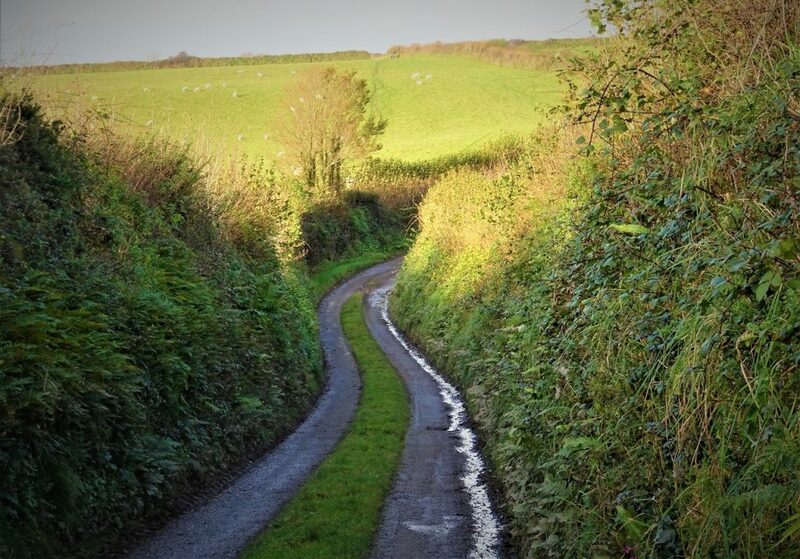 The lanes got narrower and narrower as we passed Lantivet. Grass growing down the middle of the road is never a comforting sight. Fortunately it was so quiet, so we didn’t have to make any difficult reversing-all-the-way-back-down-the-country-lane manoeuvers! 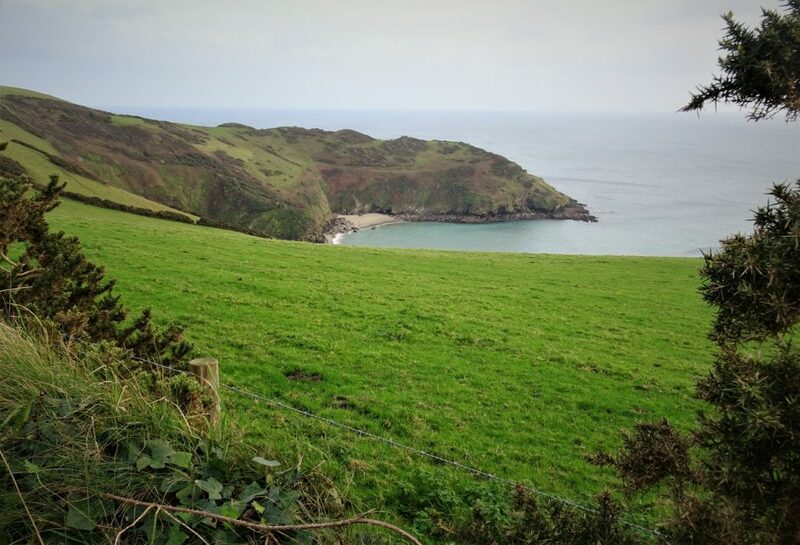 Passing the secluded National Trust Lantic Bay. 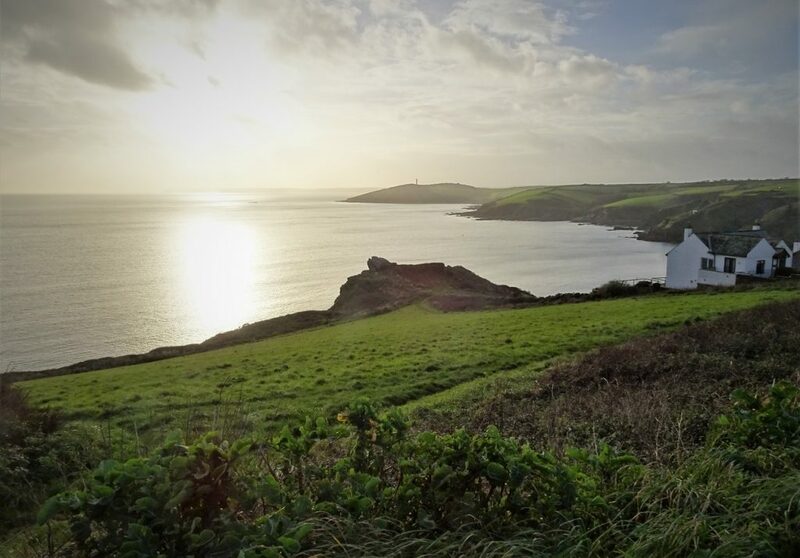 Gribbin Head in the distance from the headland at Polruan. 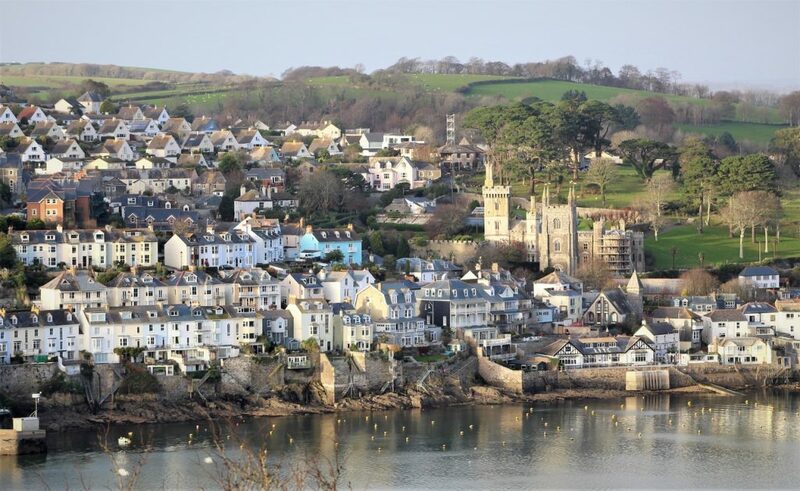 From Polruan we looked across to Fowey and its Parish Church. 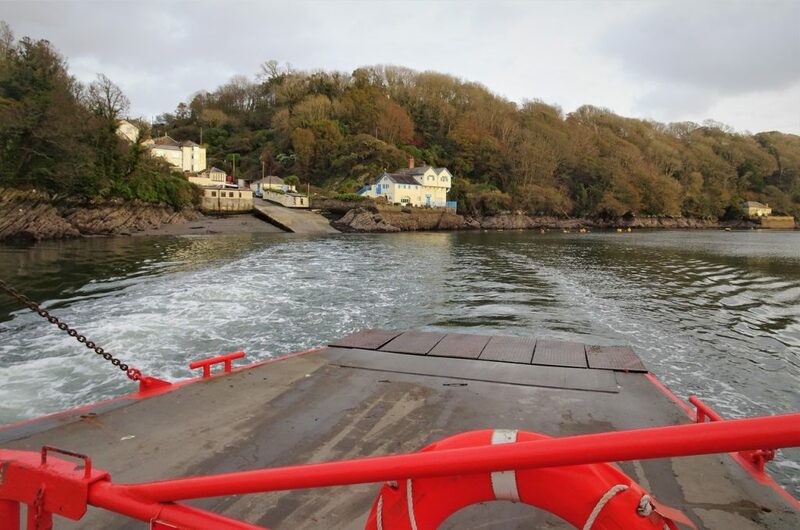 We then took the Bodinnich Ferry crossing over the River Fowey. 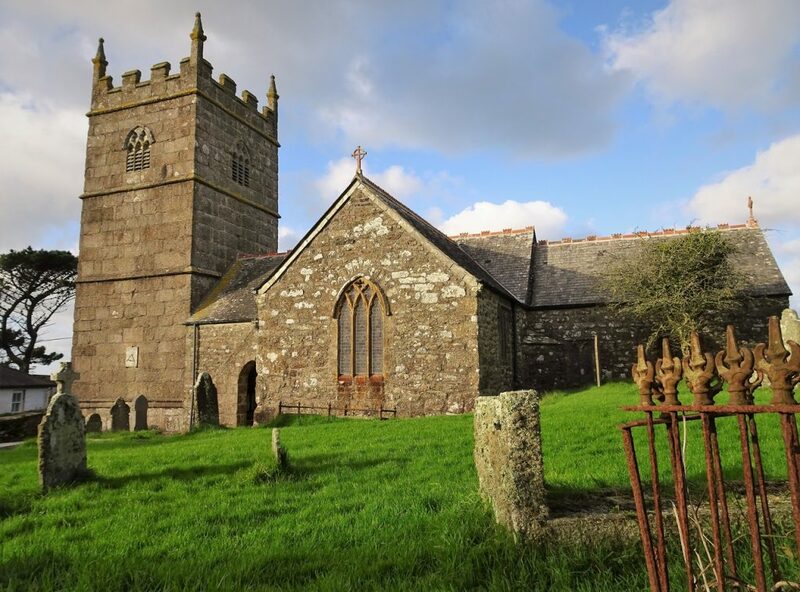 Taking the ferry saved us a 15 mile detour (and a precious 35 minutes of daylight) inland via Lostwithiel. Looking back to Bodinnich Landing as we crossed to Fowey. 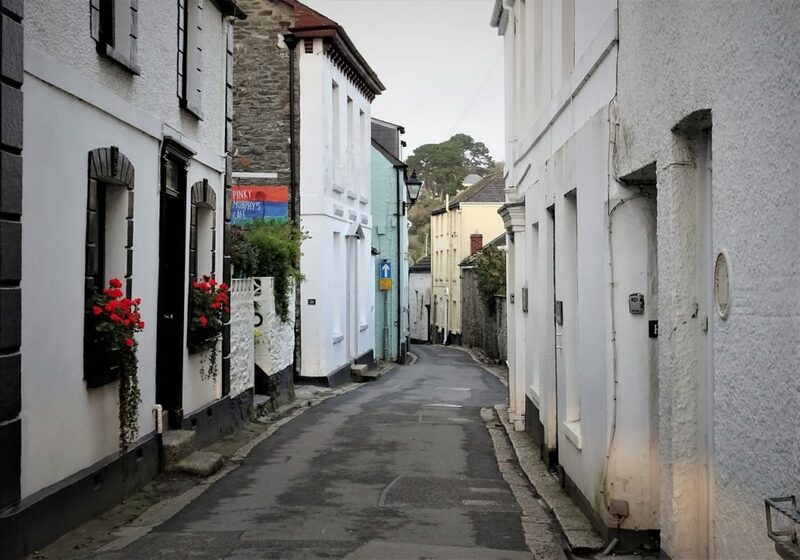 We squeezed our way through Fowey’s narrow streets (fortunately one way). 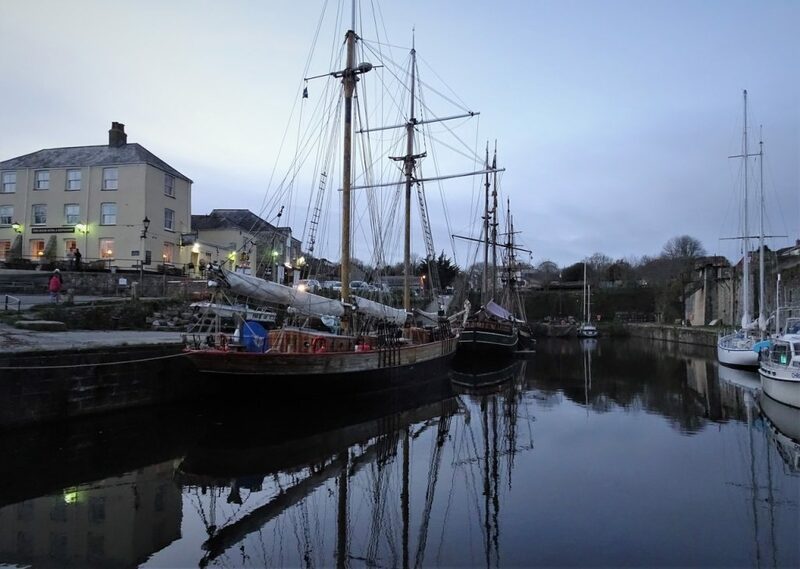 Picturesque Charlestown, our final stop of the day before heading to St Austell for the night. Square rigger tall ships reflecting in the small Georgian harbour. The attractive harbour was originally built for coal imports and copper exports. 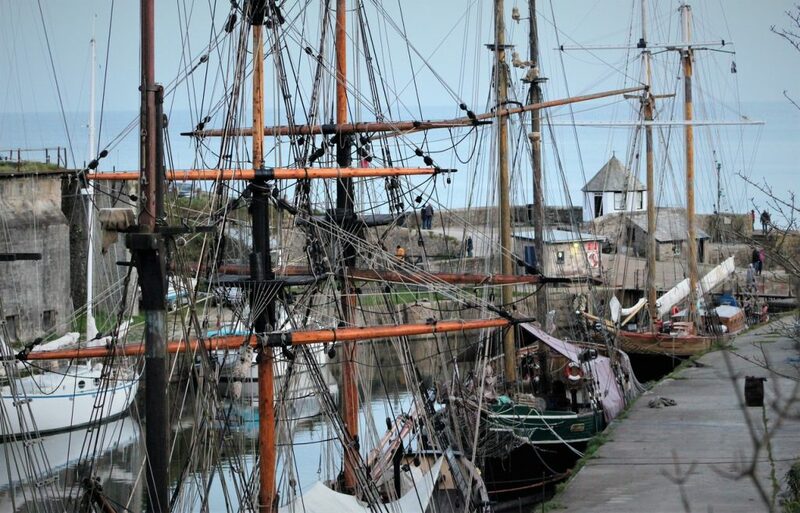 More recently the harbour has been used for period film and TV productions.